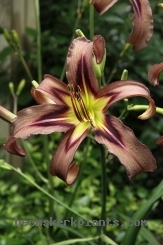 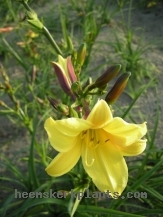 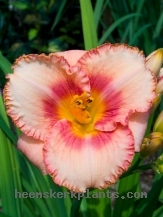 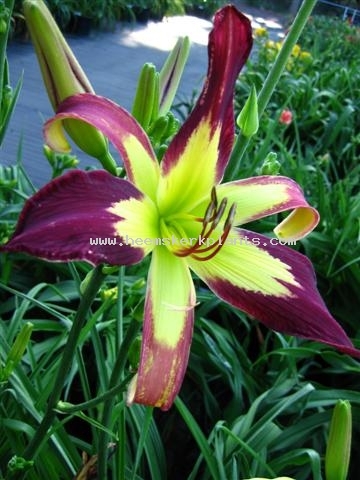 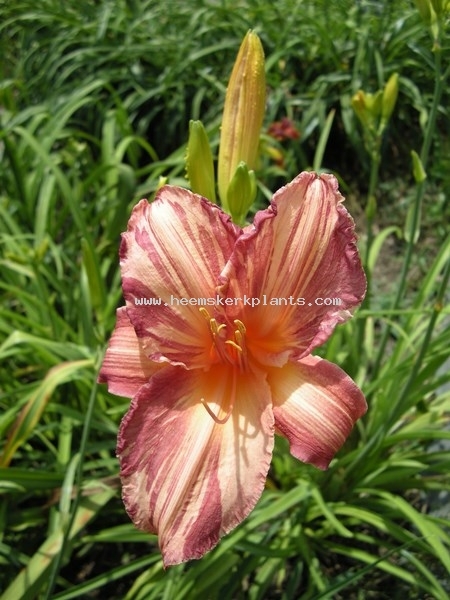 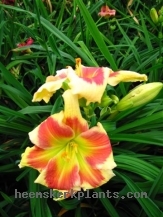 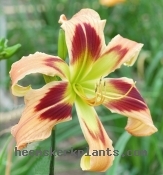 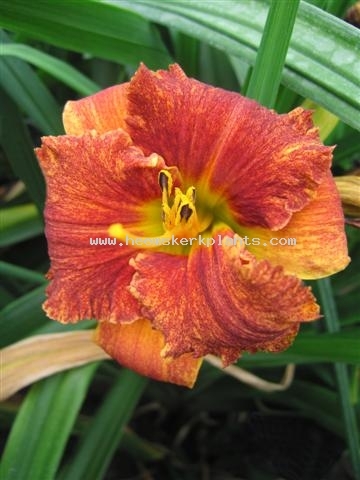 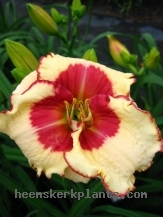 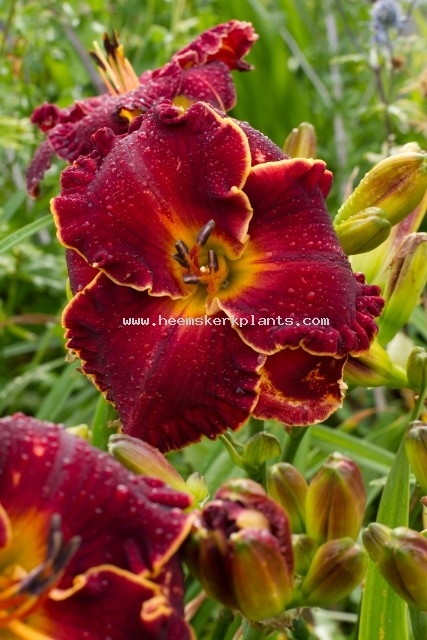 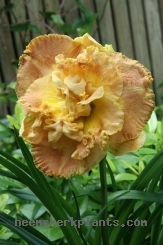 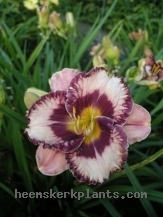 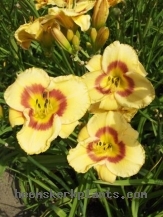 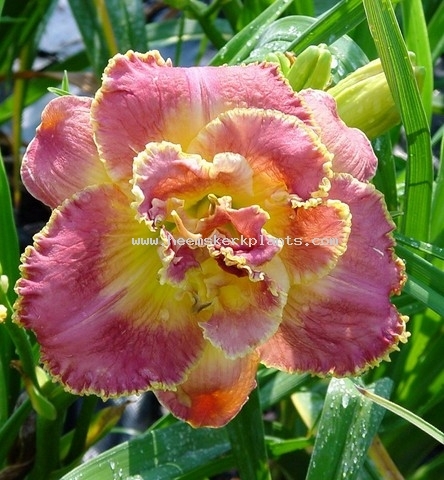 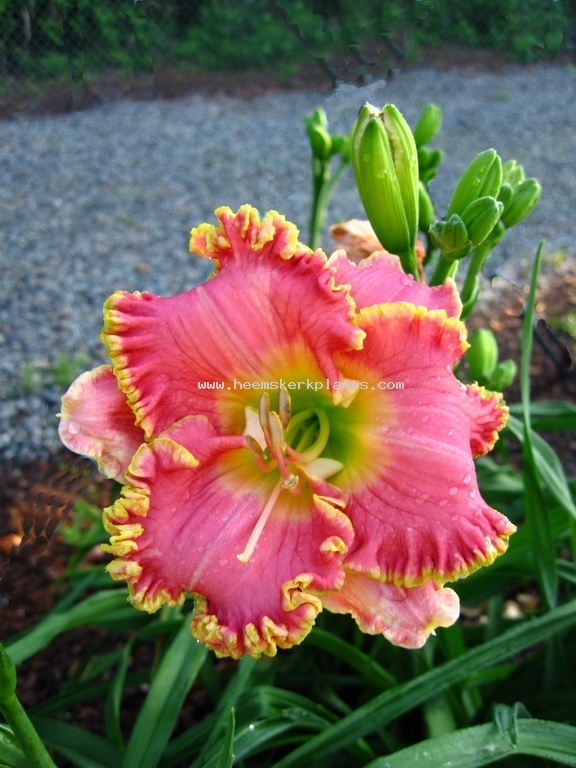 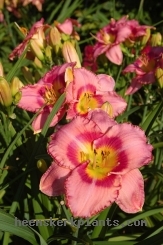 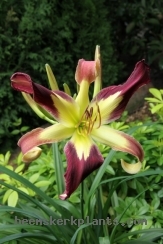 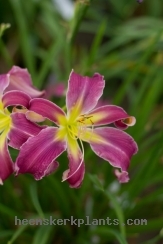 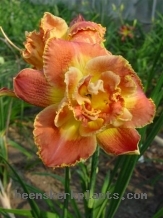 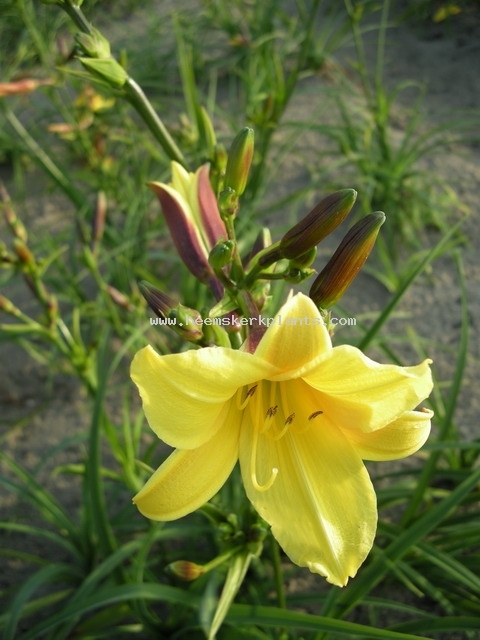 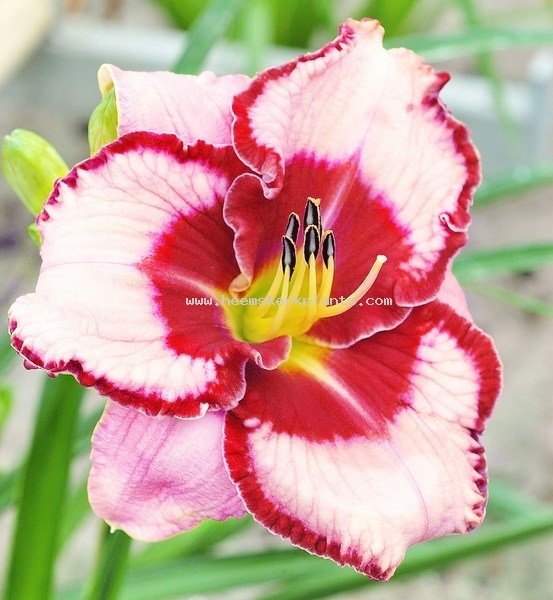 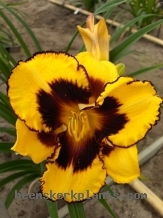 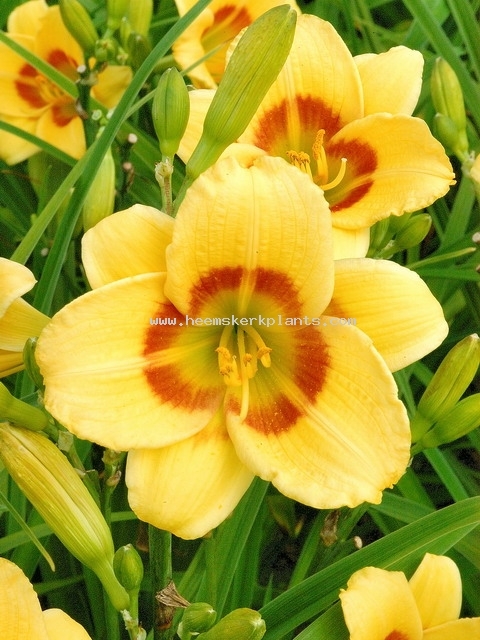 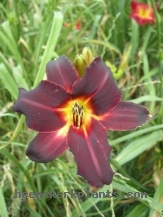 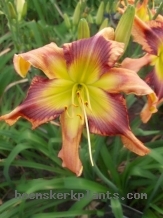 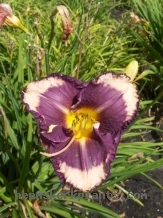 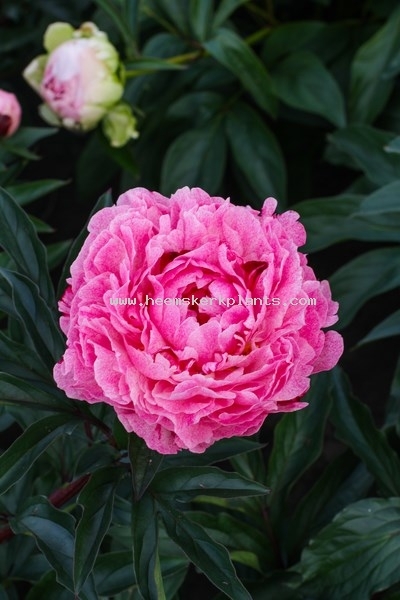 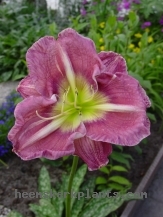 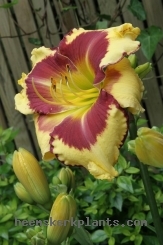 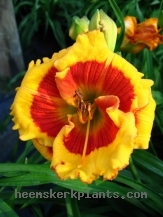 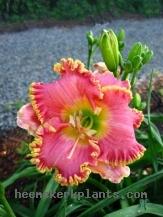 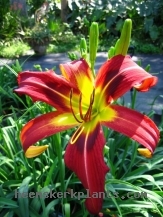 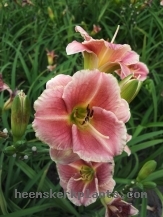 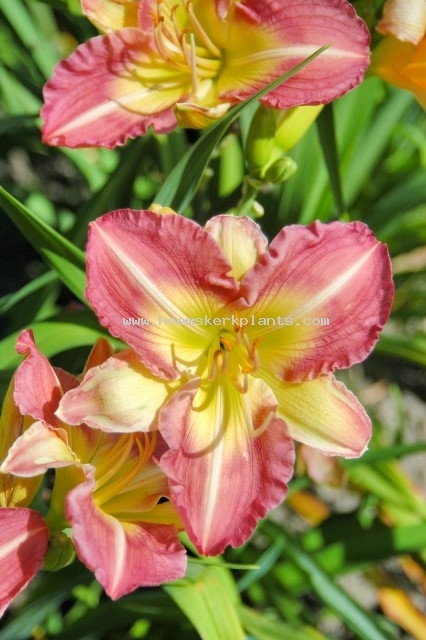 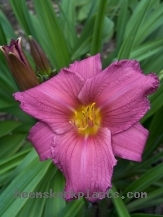 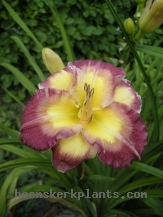 Definition: Round pink flower with dark red eyezone and yellow to green throat. Ruffled red edged. 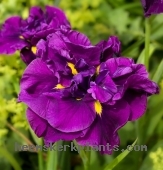 Definition: Falls washed reddish violet, heavy veining and dappling at shoulders, large signal deep yellow to cream, speckled dark purple. 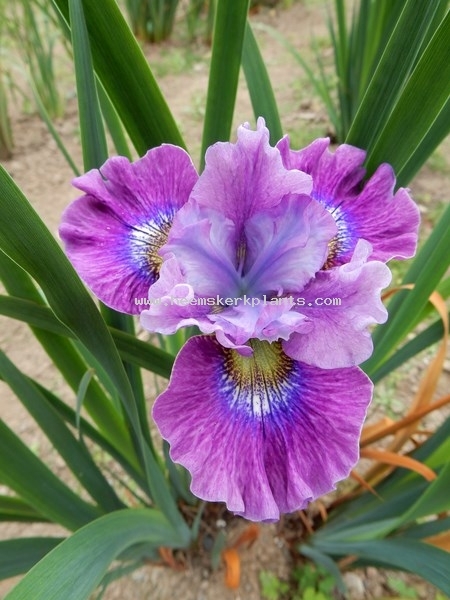 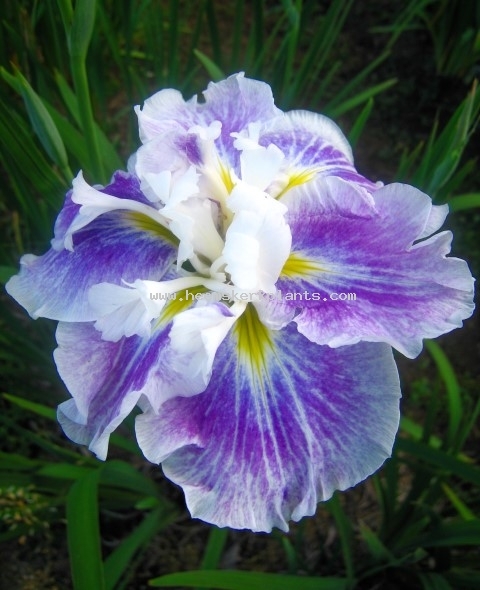 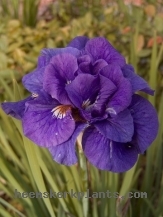 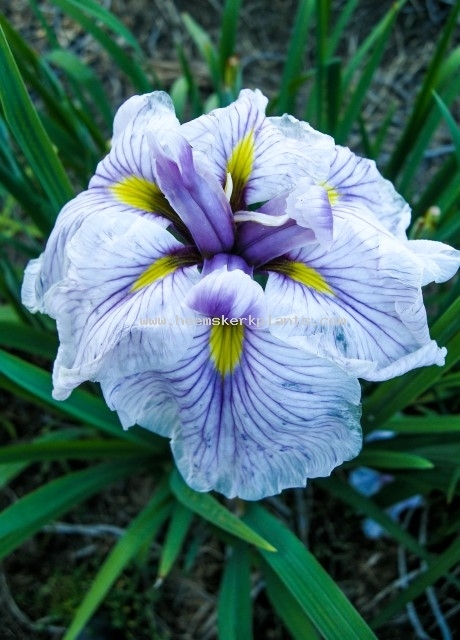 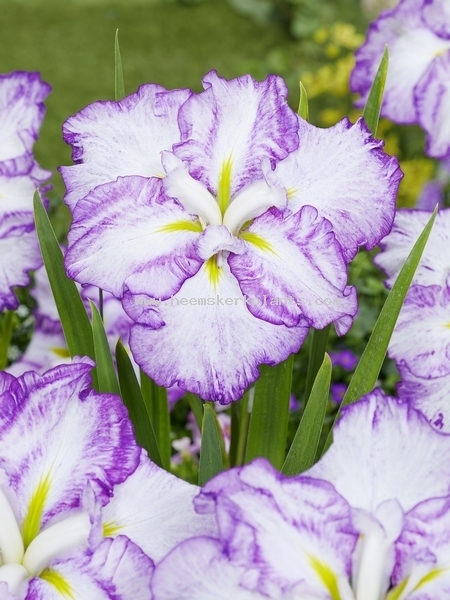 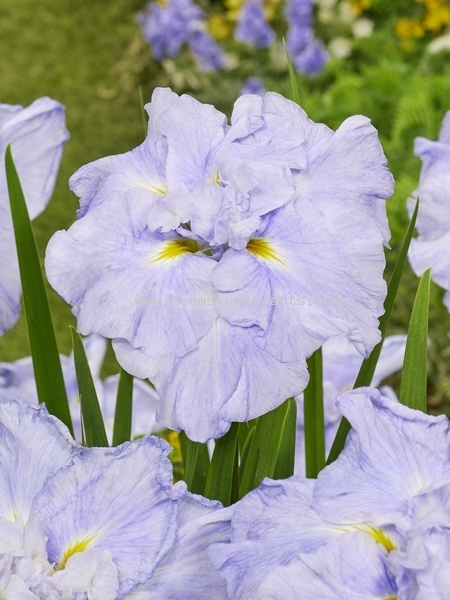 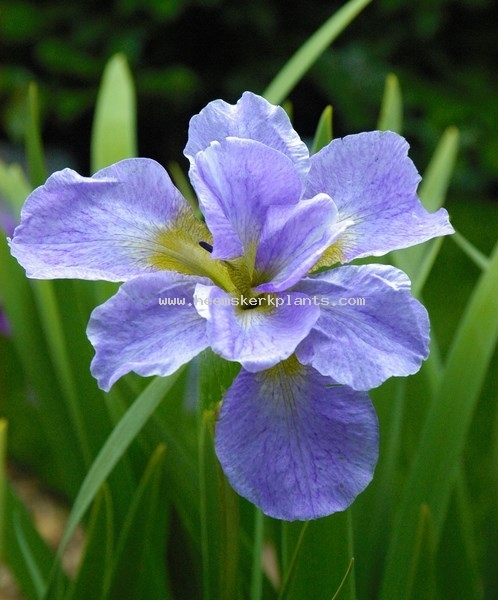 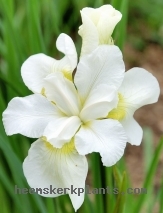 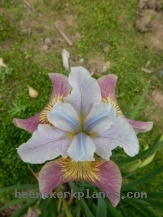 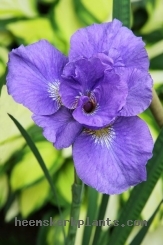 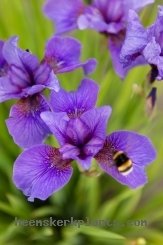 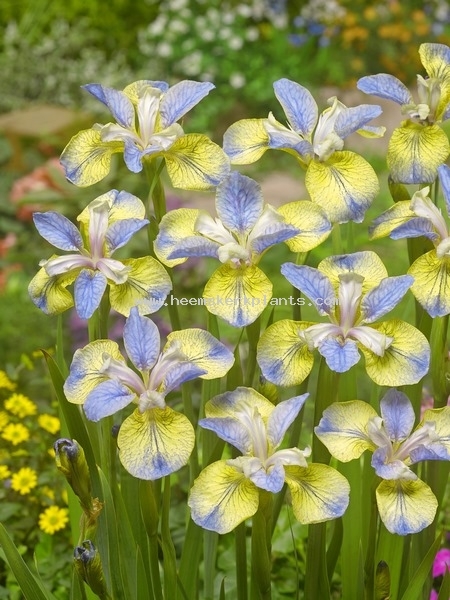 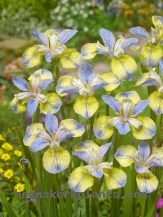 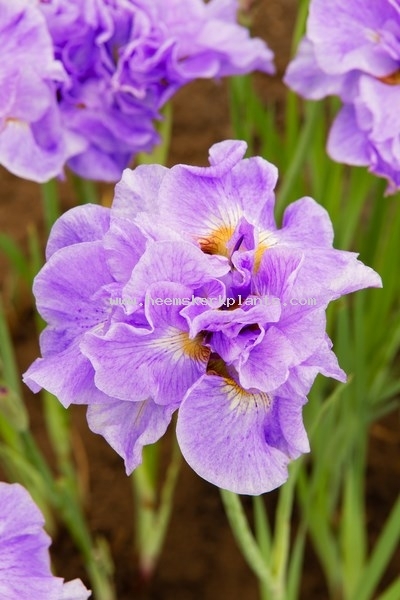 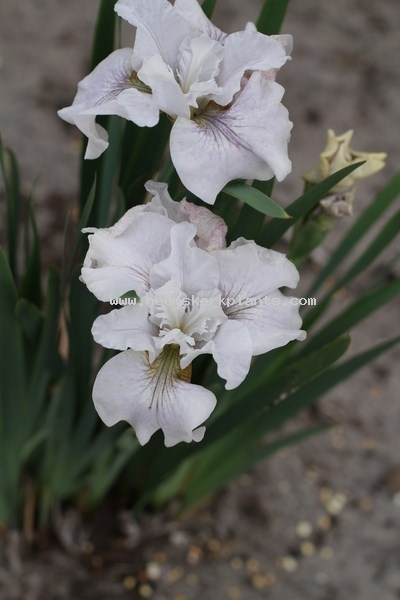 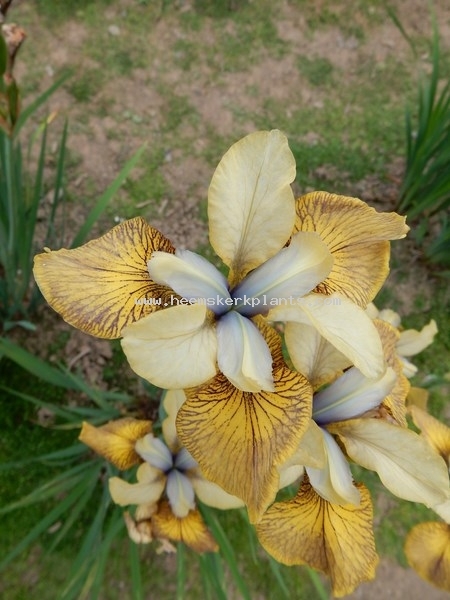 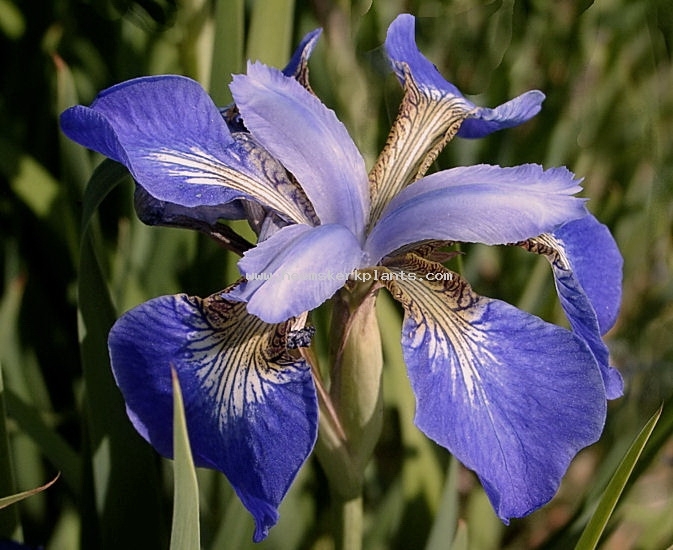 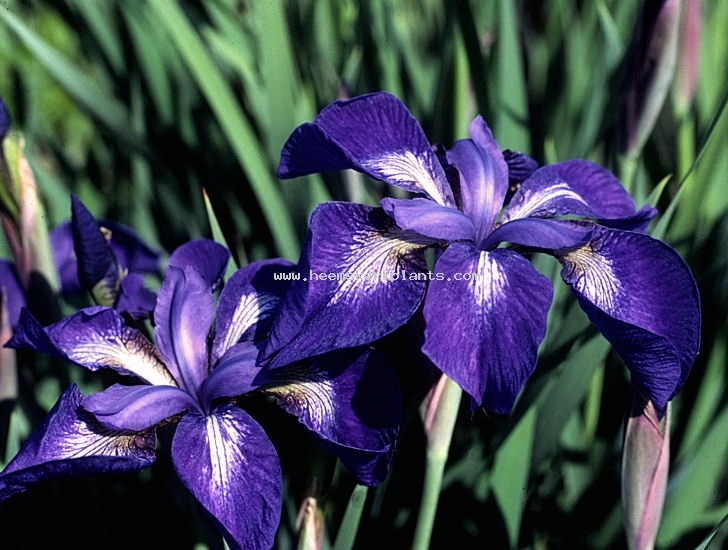 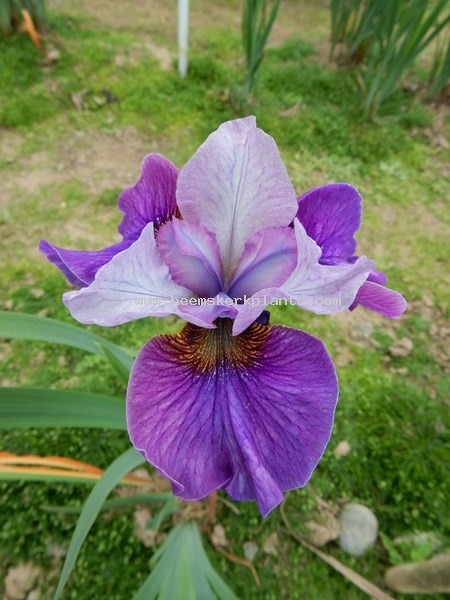 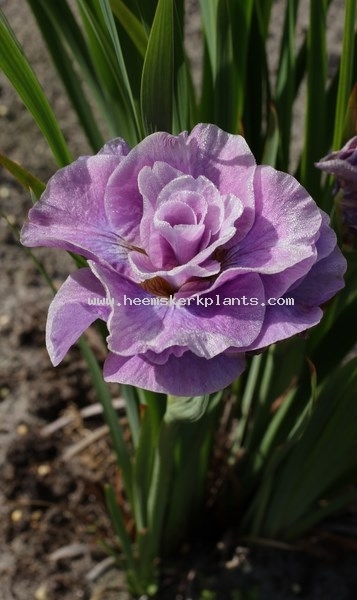 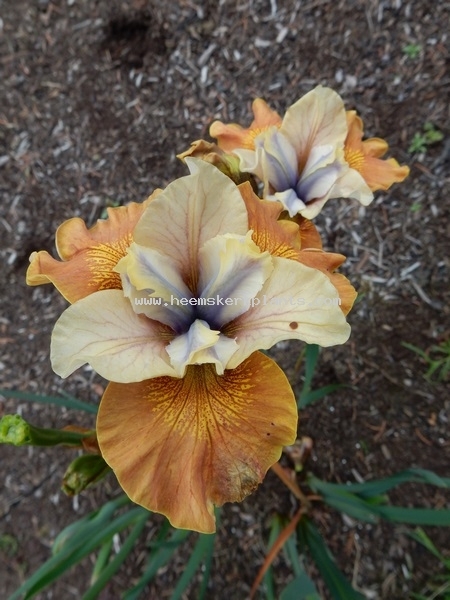 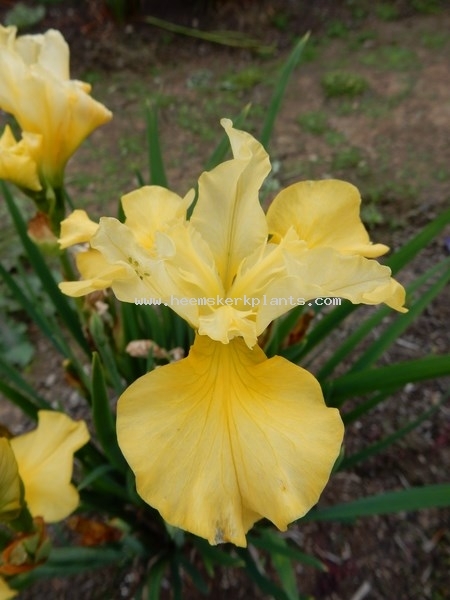 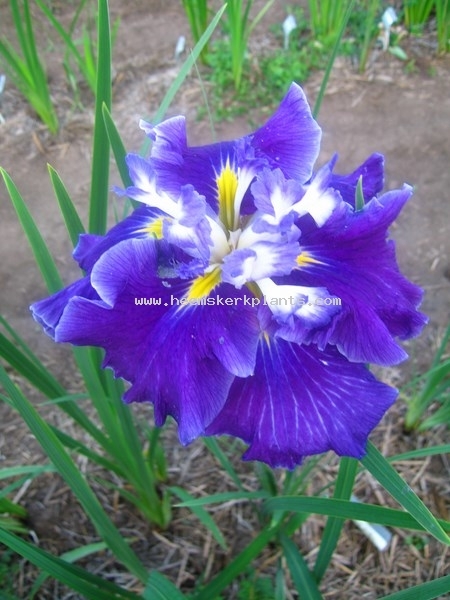 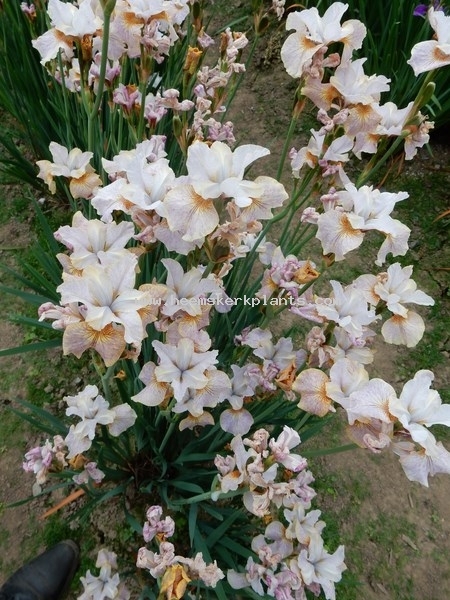 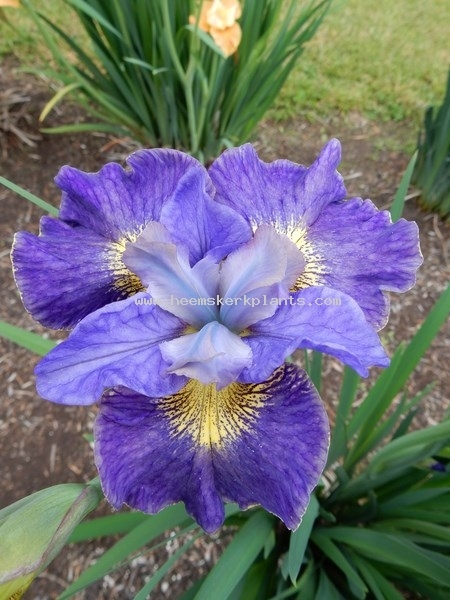 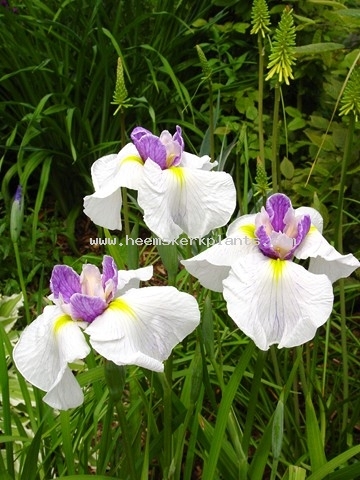 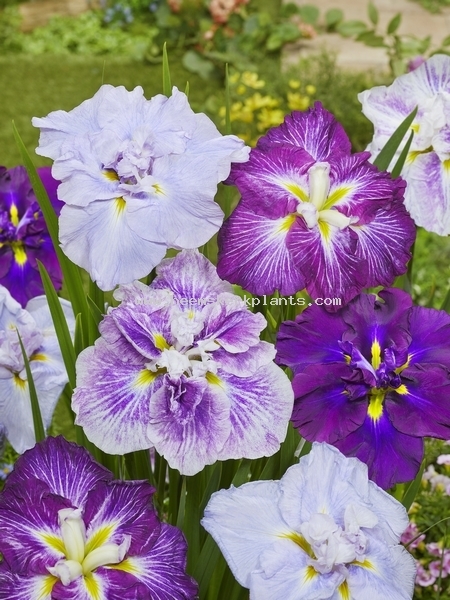 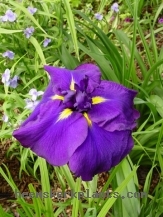 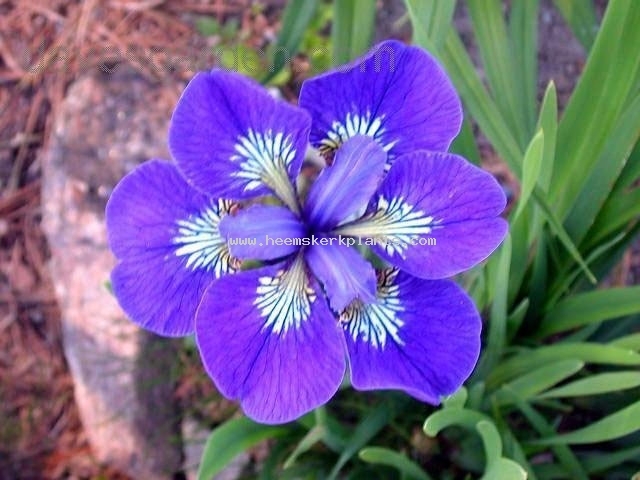 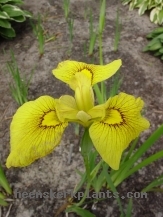 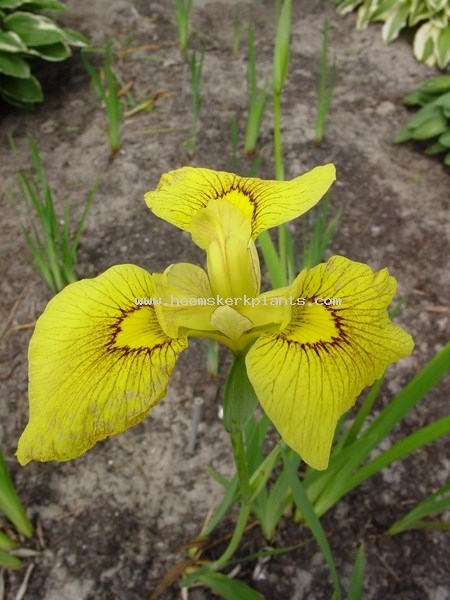 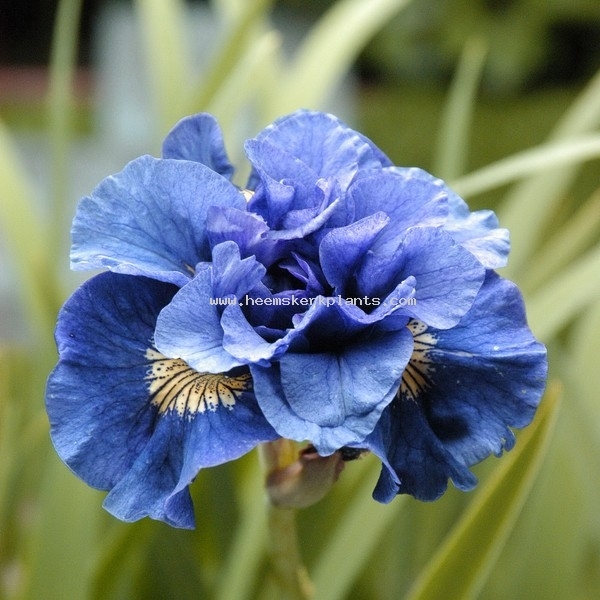 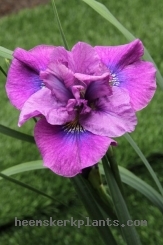 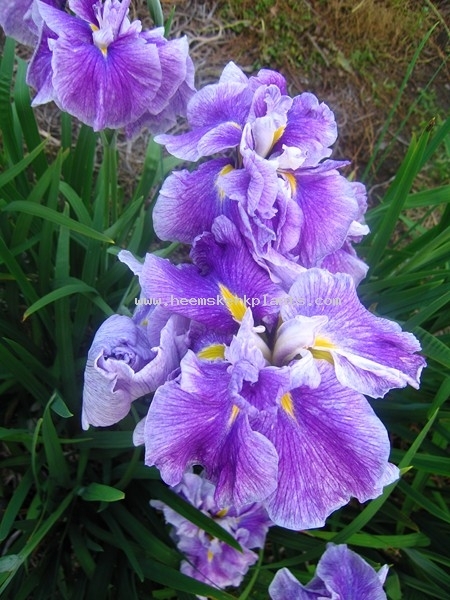 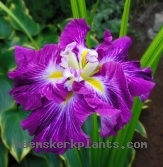 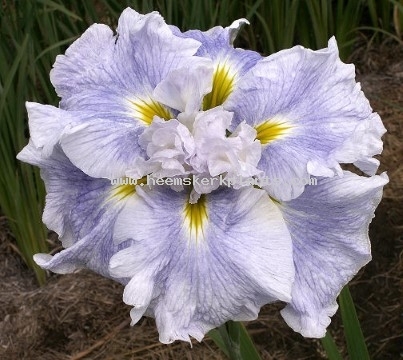 2018 - Iris Sibirica Ester C.D.M. 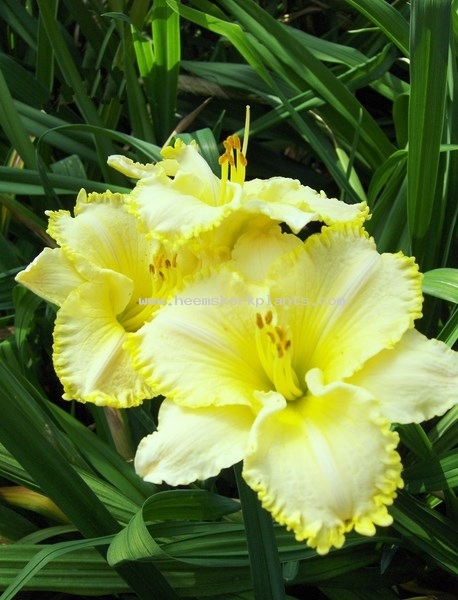 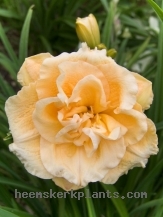 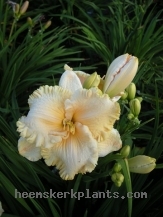 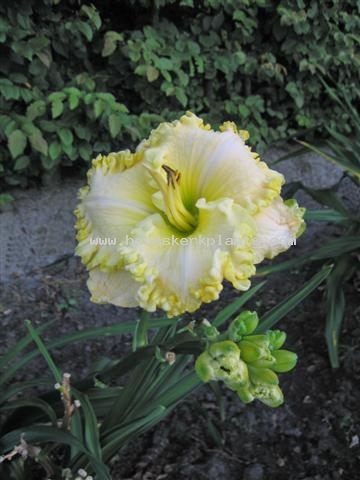 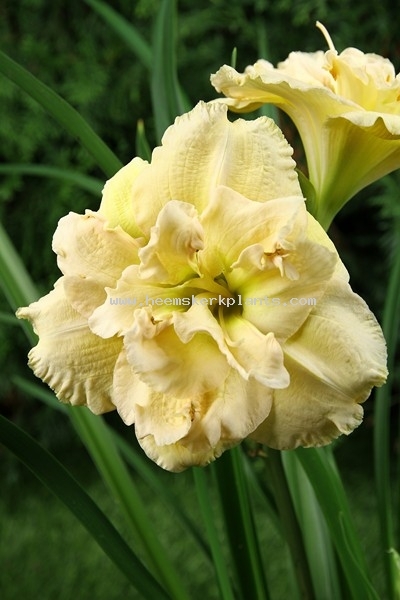 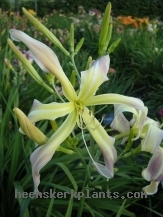 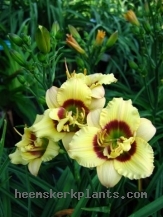 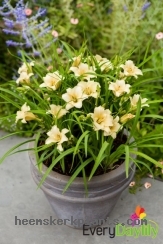 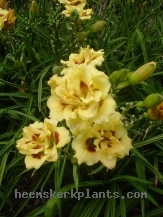 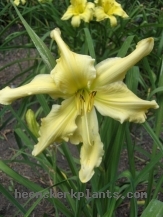 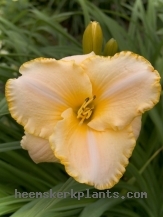 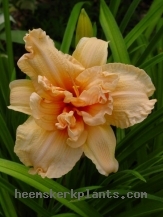 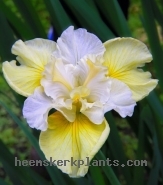 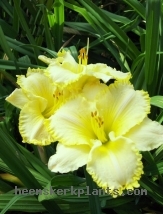 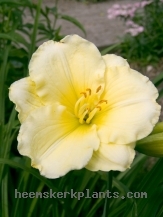 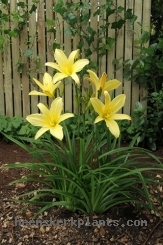 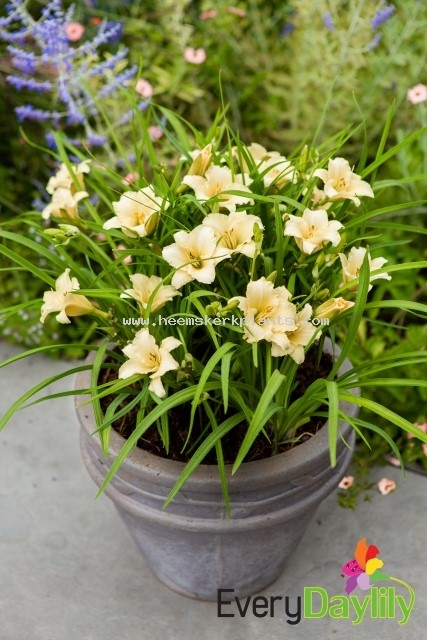 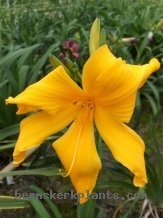 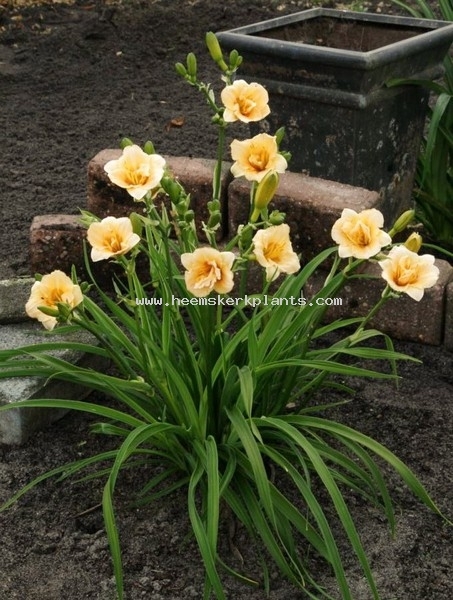 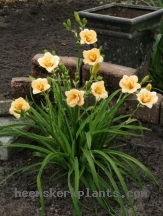 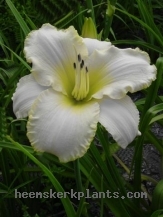 Definition: Whitish pale lavender standards, similar styles, yellow tips above gold signal. 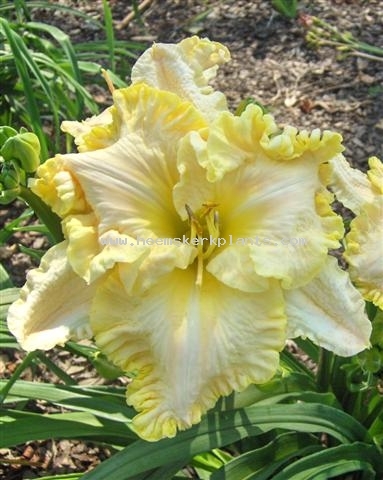 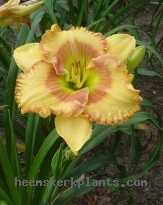 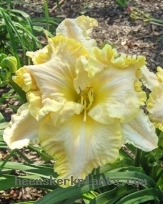 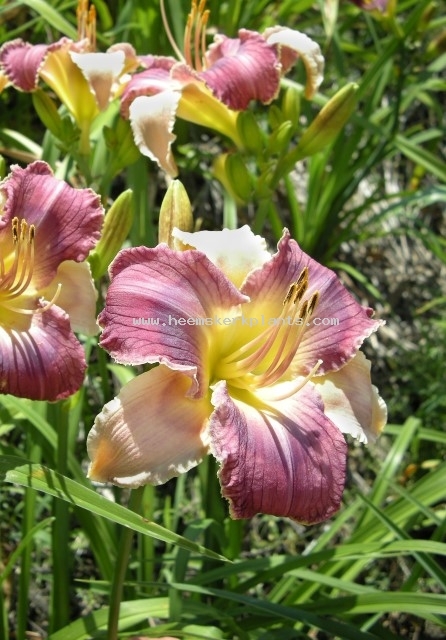 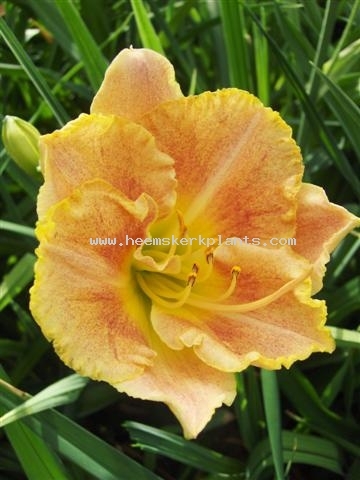 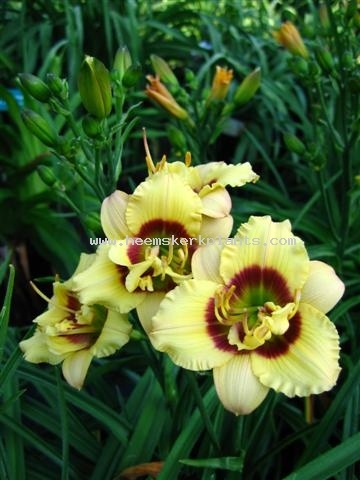 Speckled lavender roes over yellow falls. Definition: White flower with red eye zone, what makes it look like the Japanese flag. Leaf: Yellow rugose leaf with wide green edge. 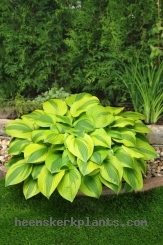 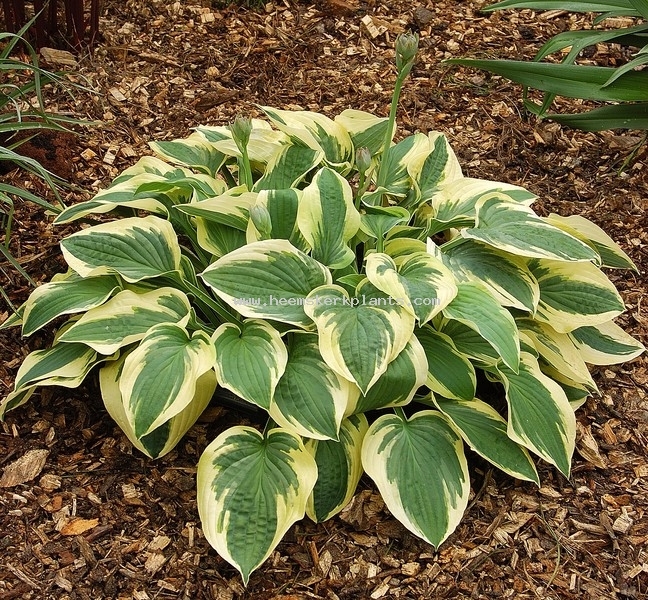 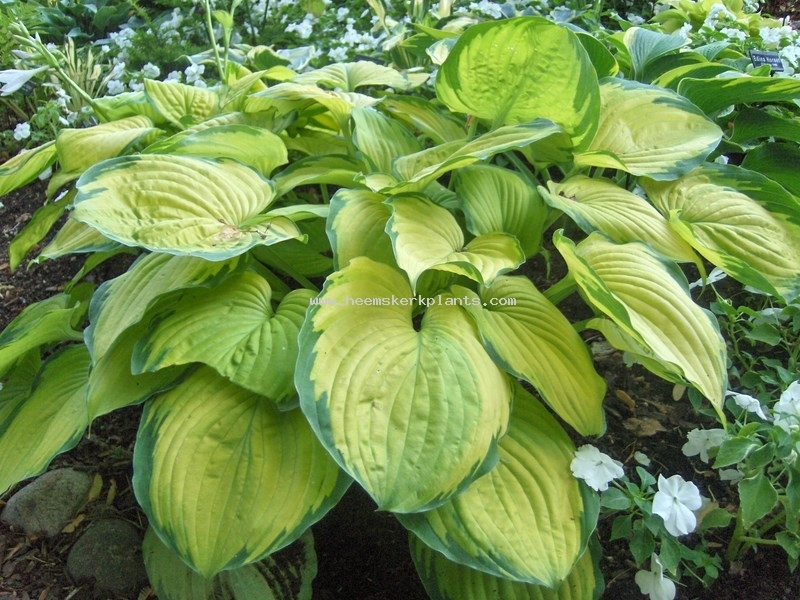 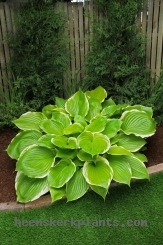 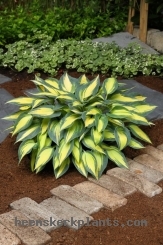 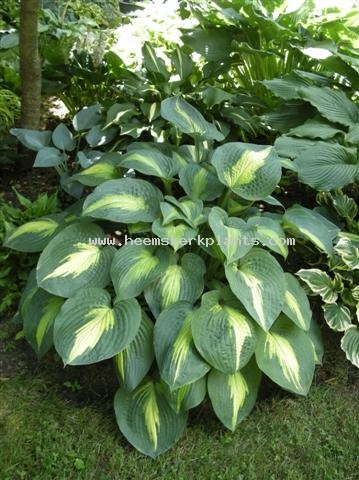 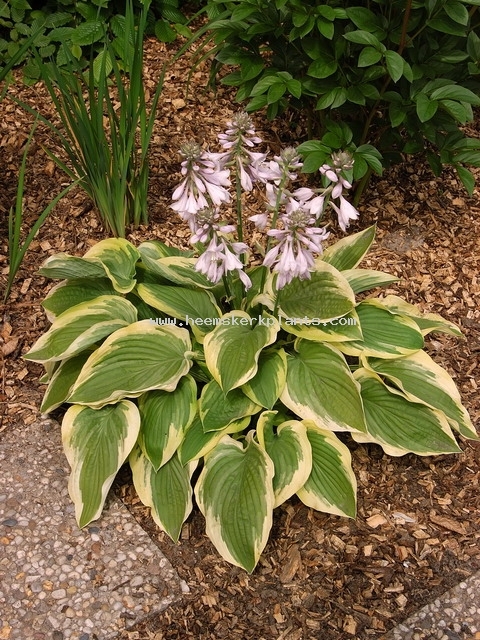 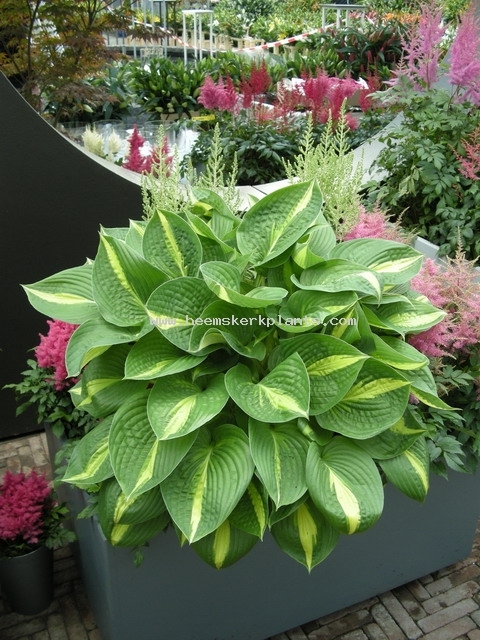 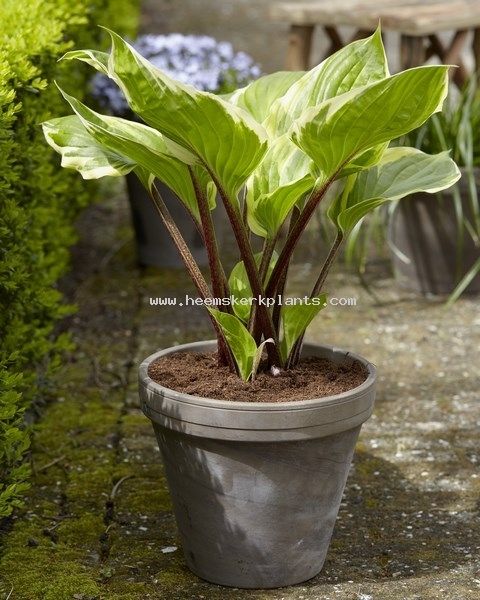 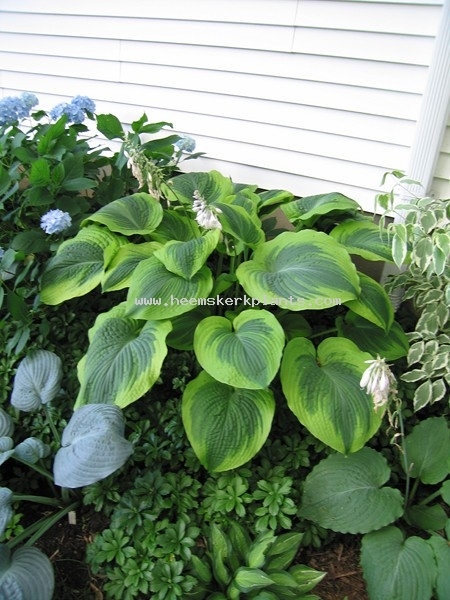 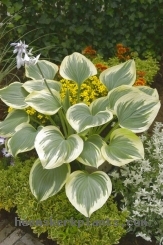 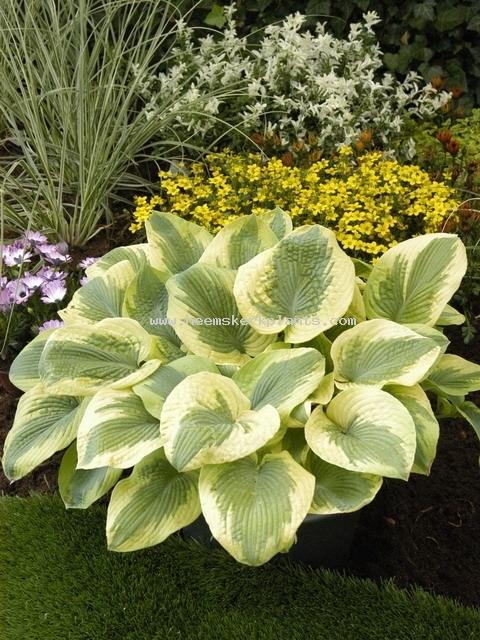 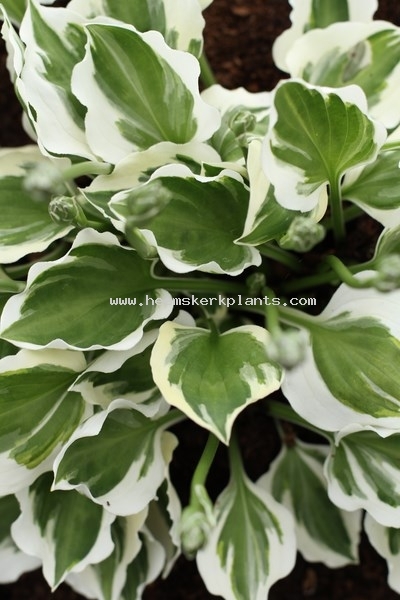 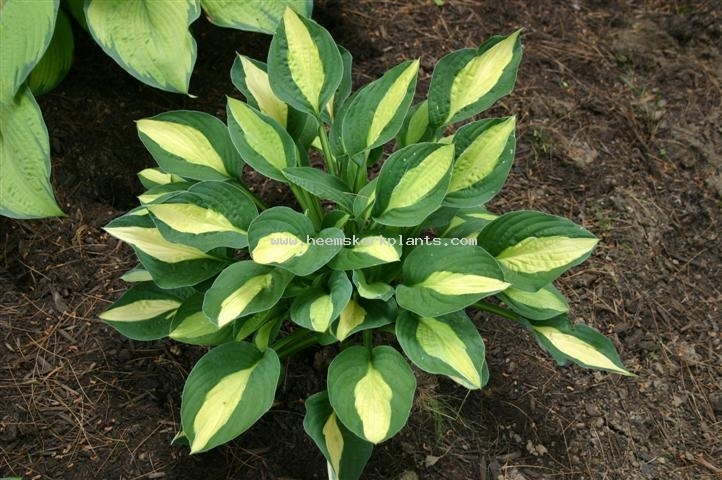 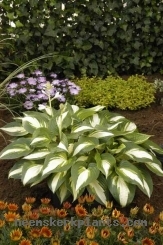 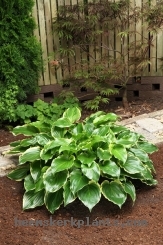 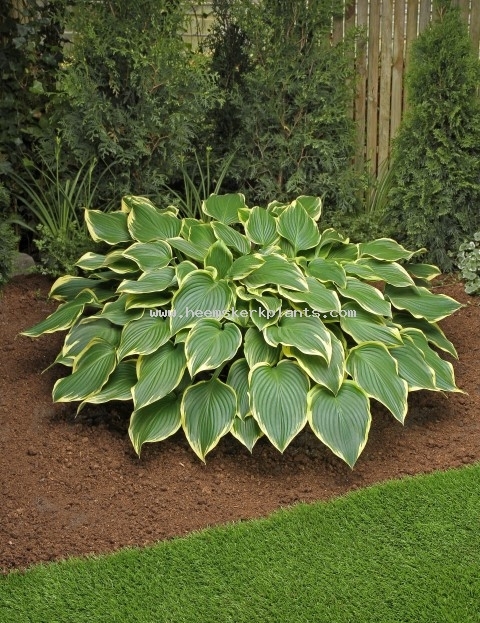 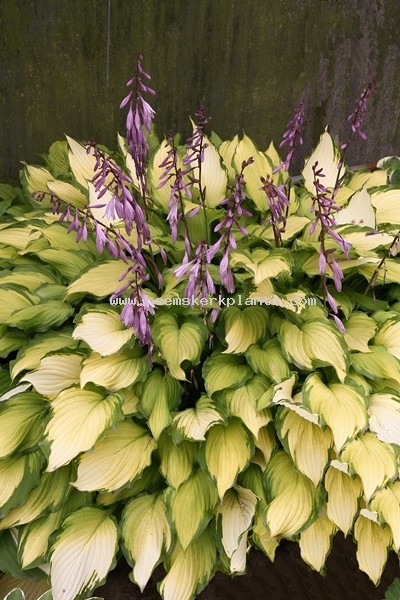 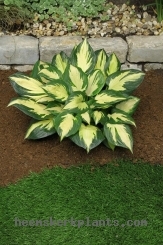 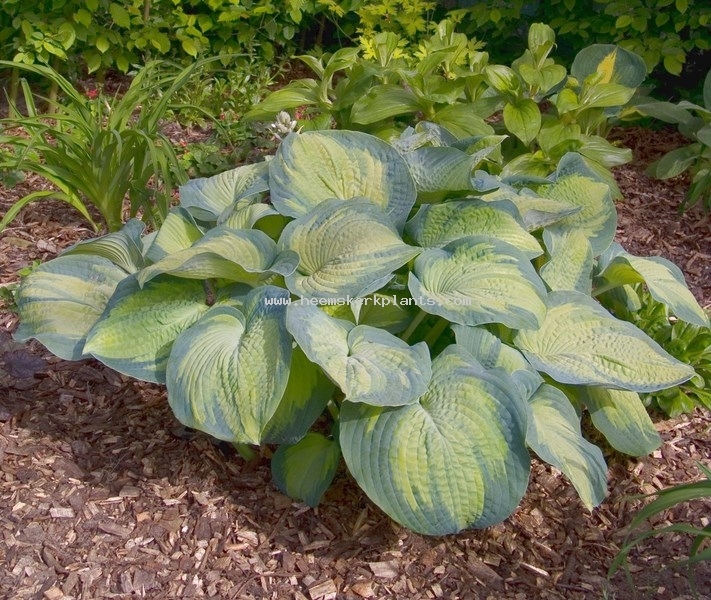 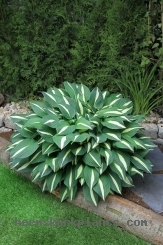 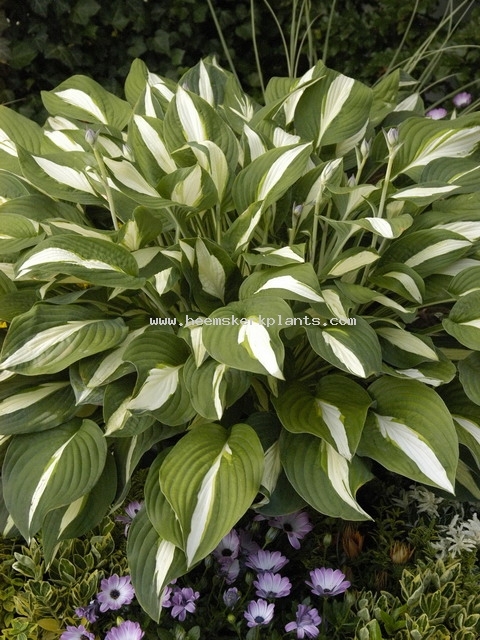 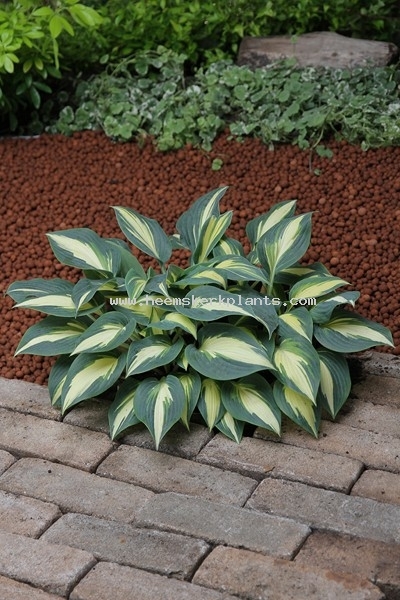 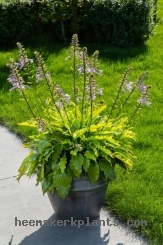 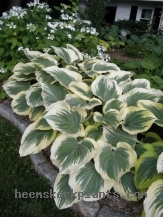 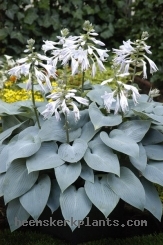 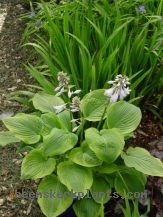 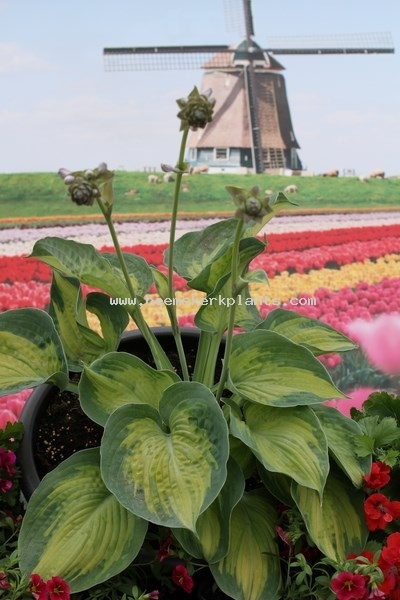 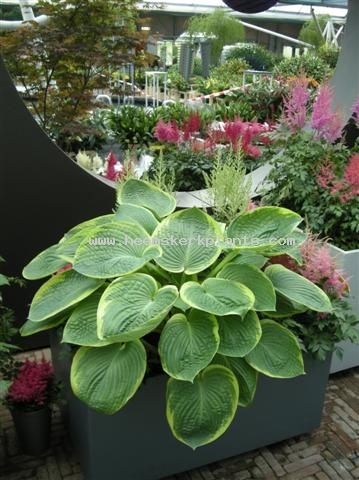 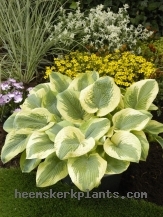 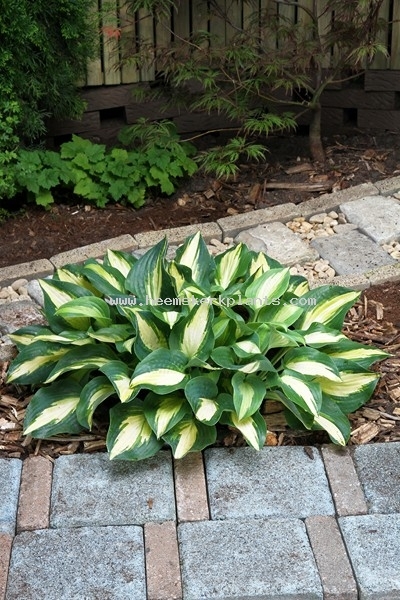 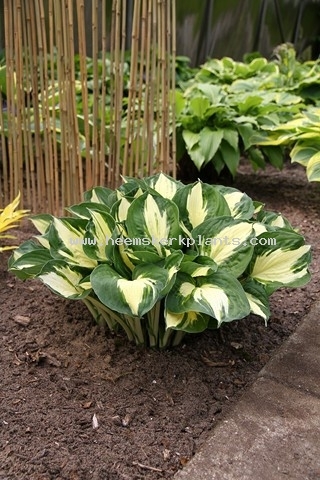 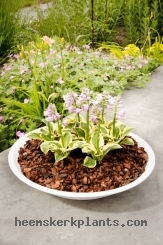 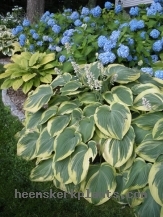 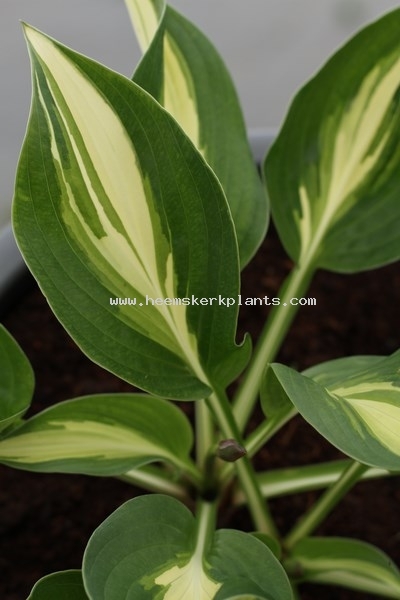 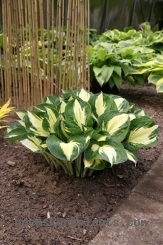 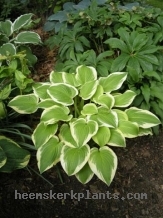 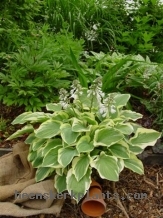 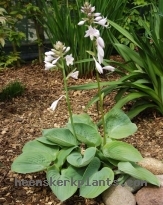 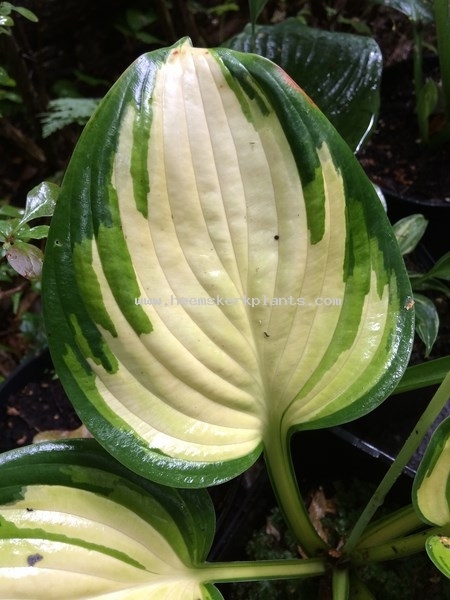 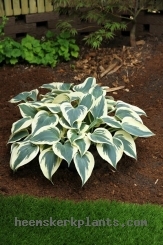 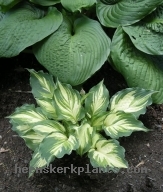 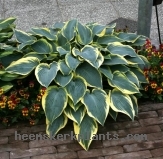 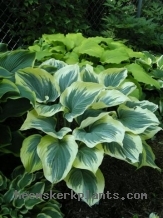 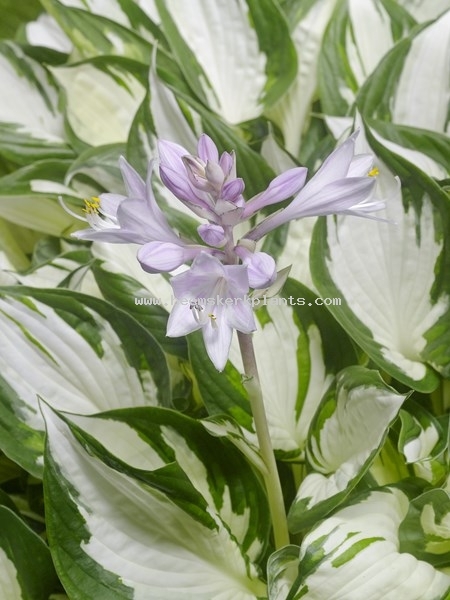 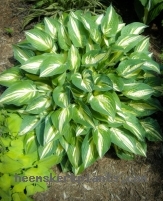 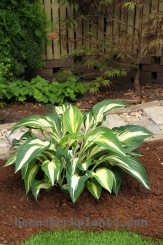 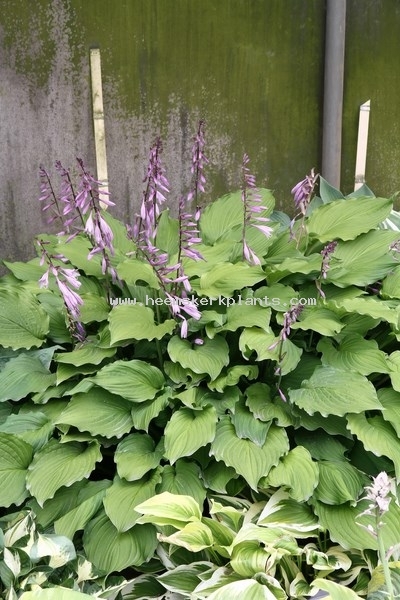 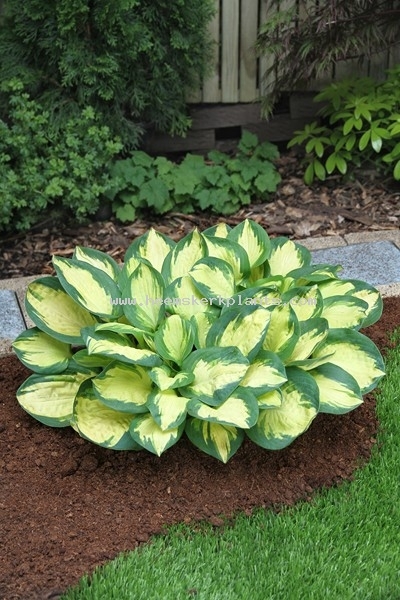 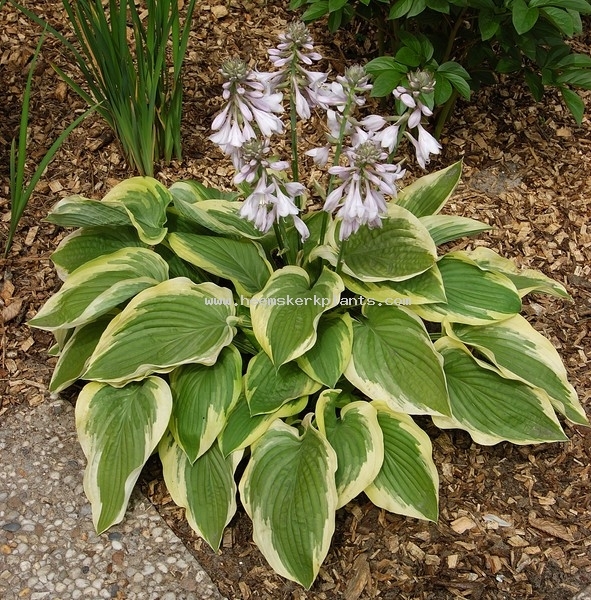 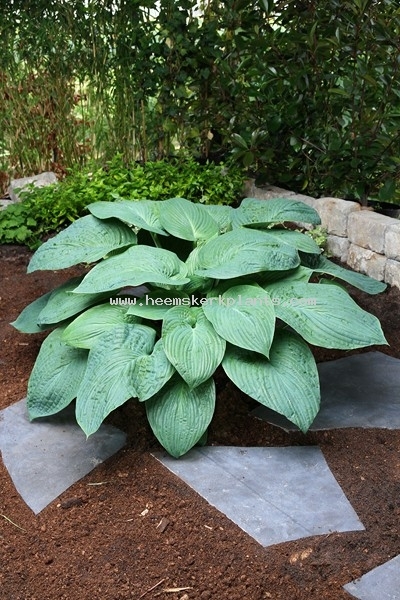 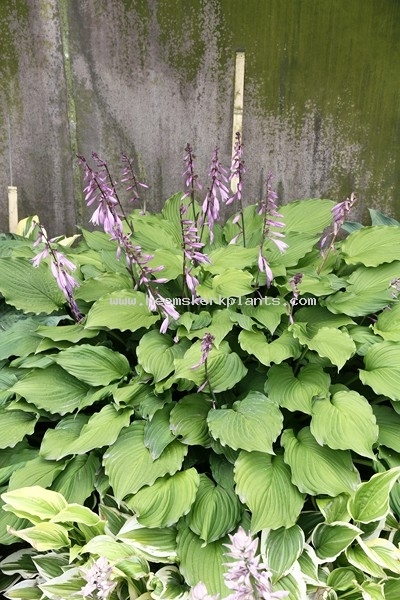 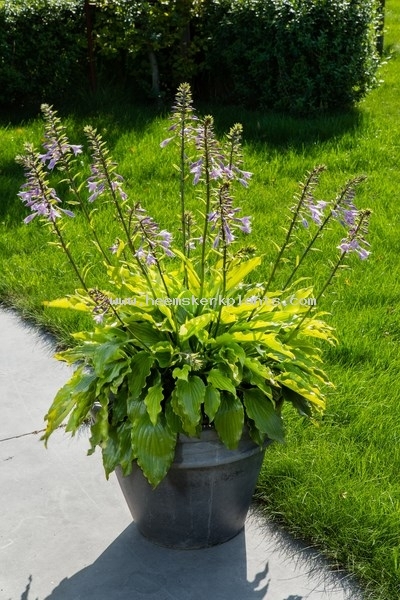 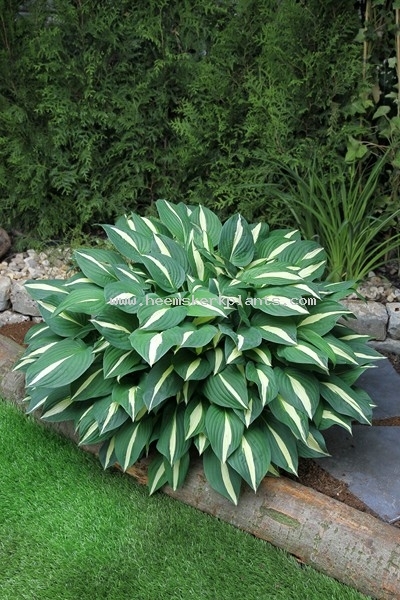 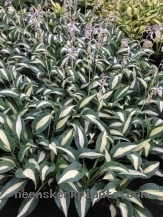 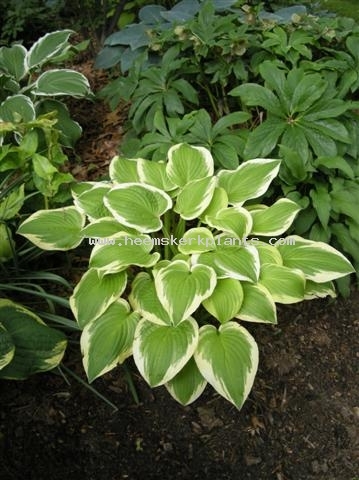 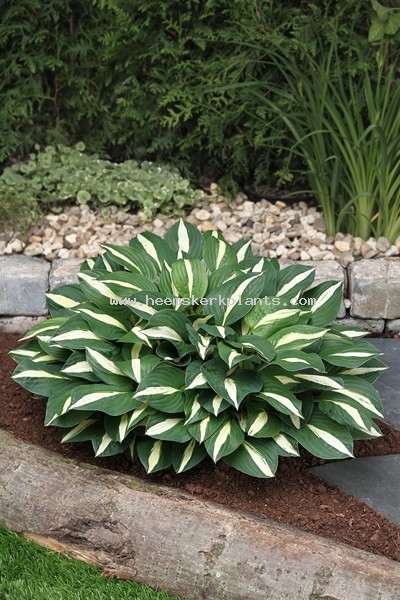 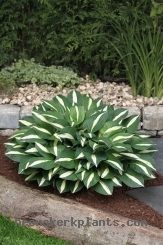 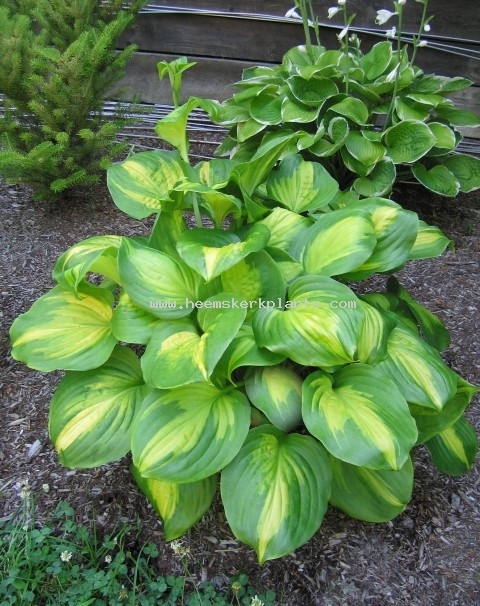 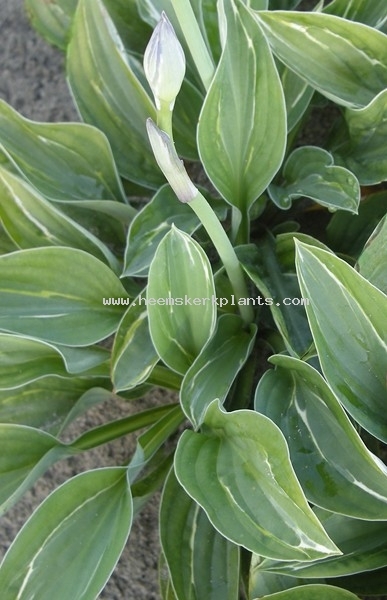 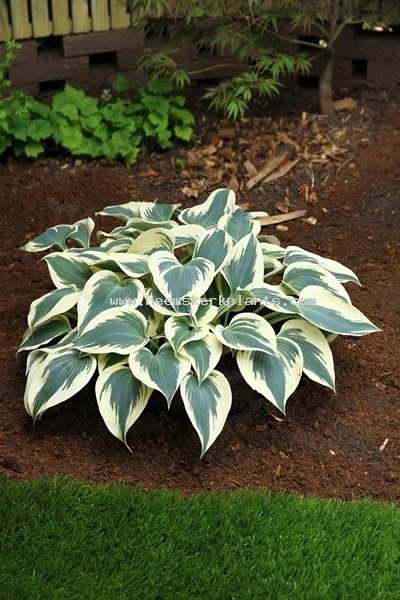 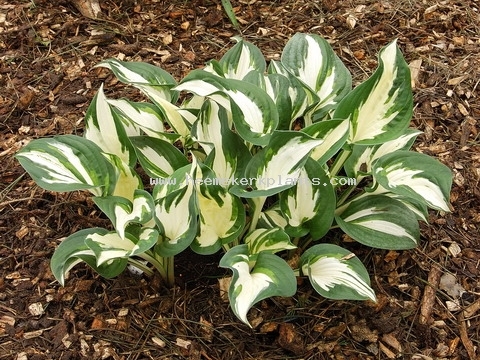 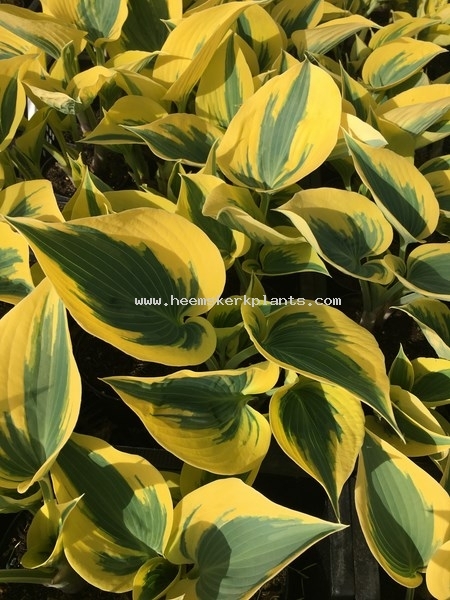 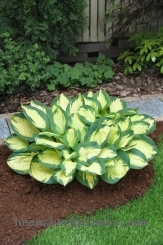 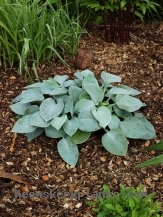 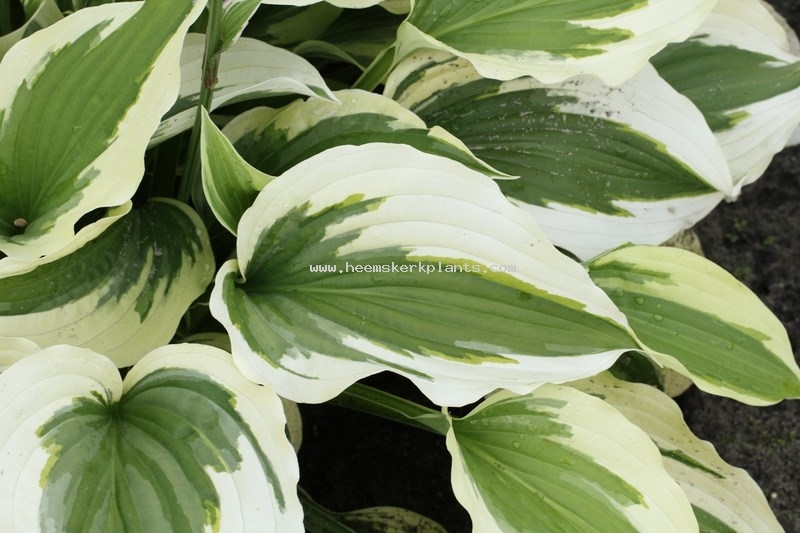 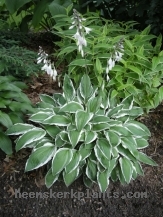 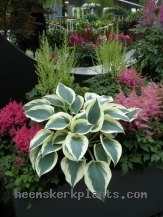 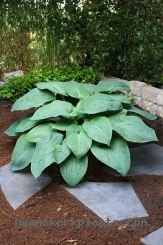 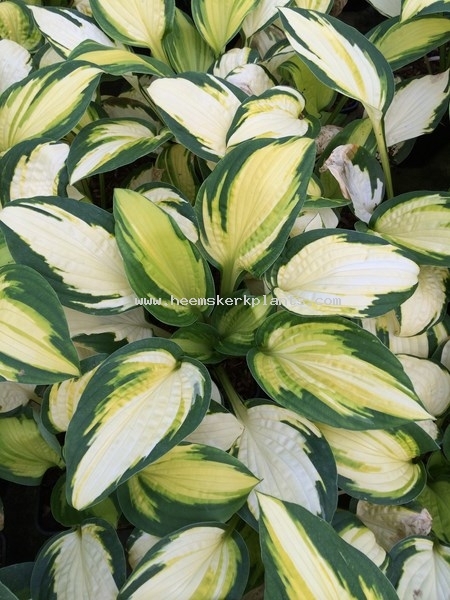 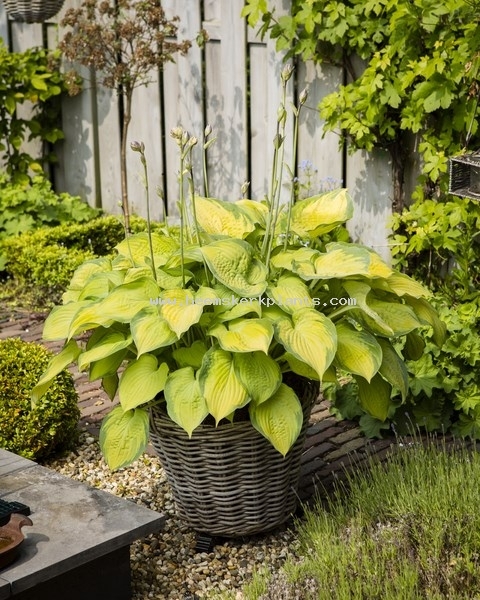 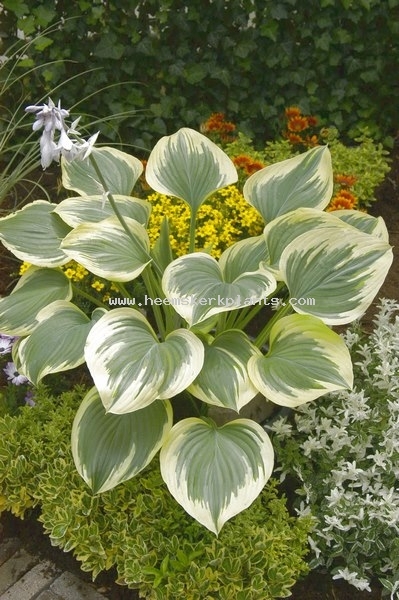 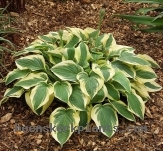 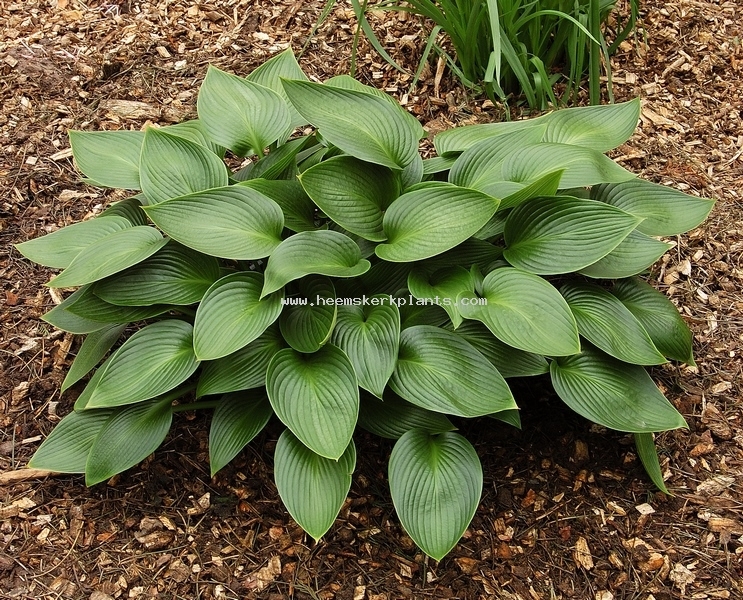 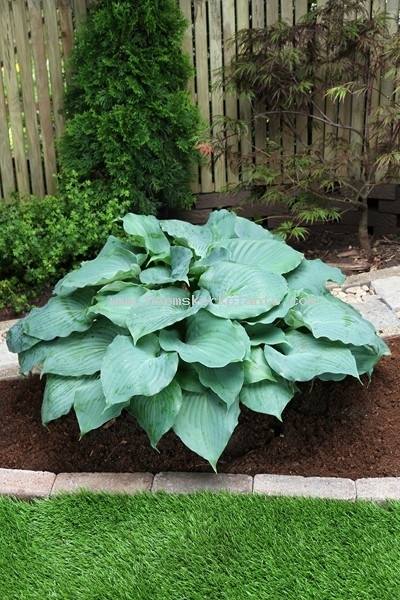 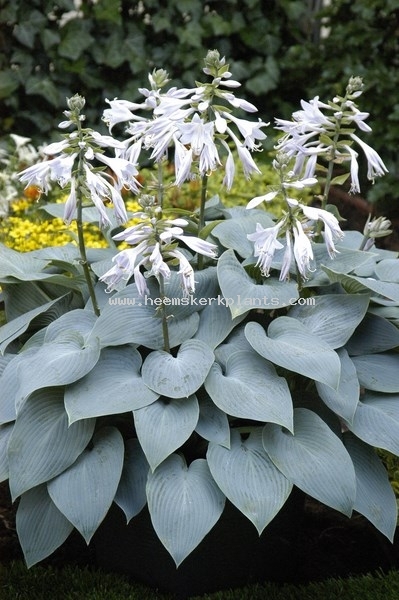 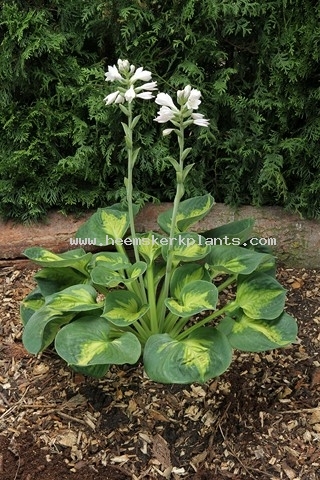 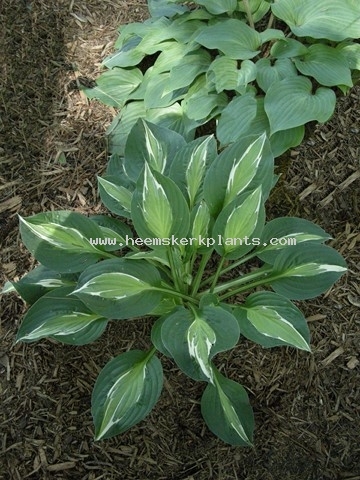 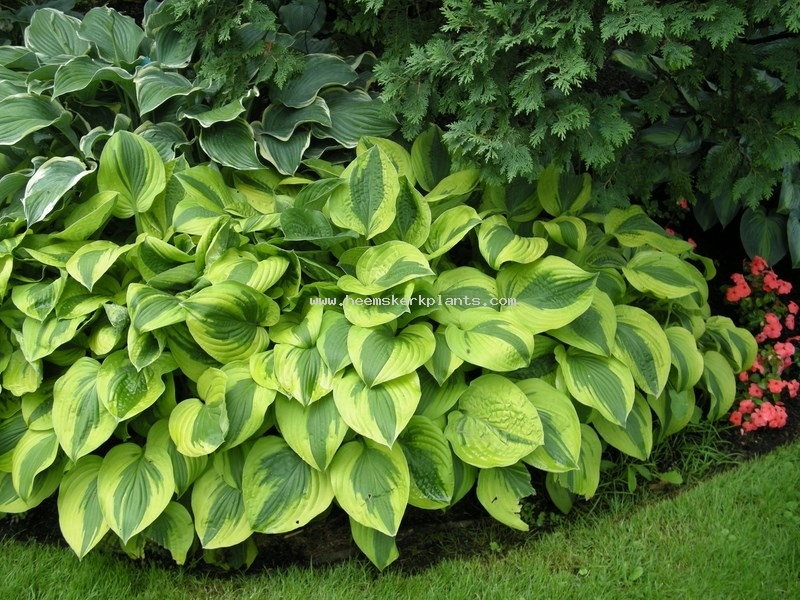 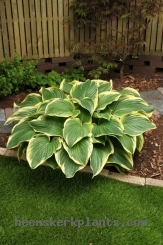 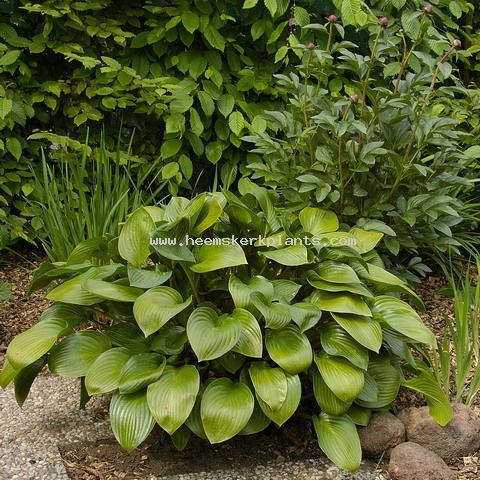 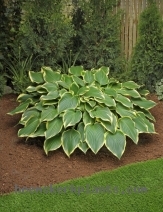 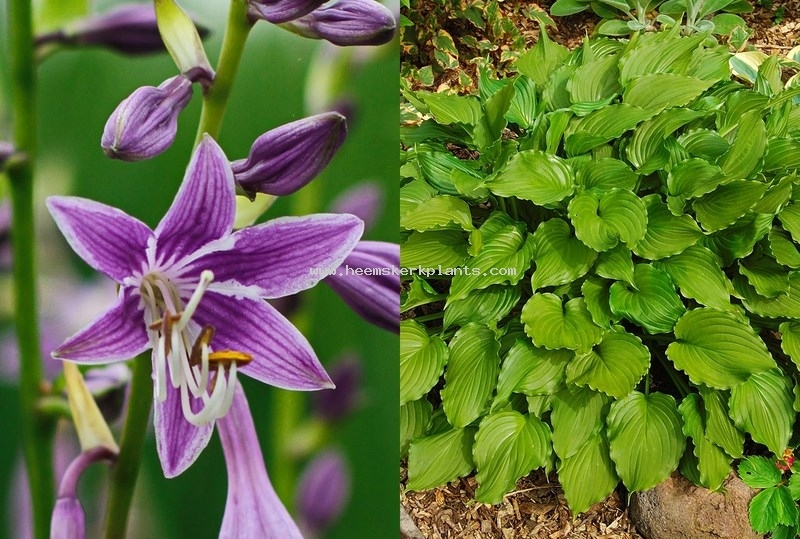 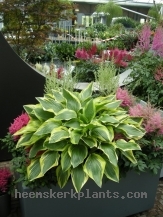 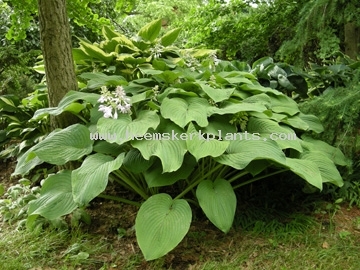 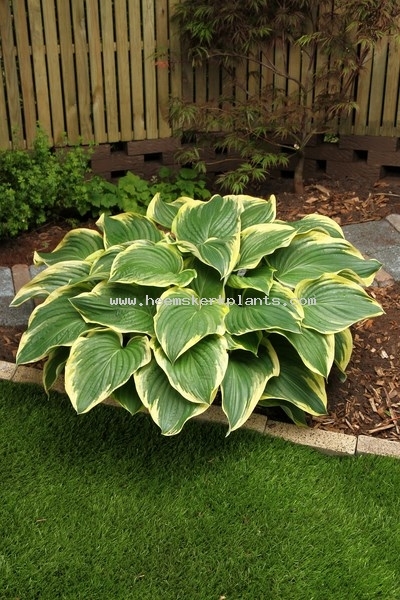 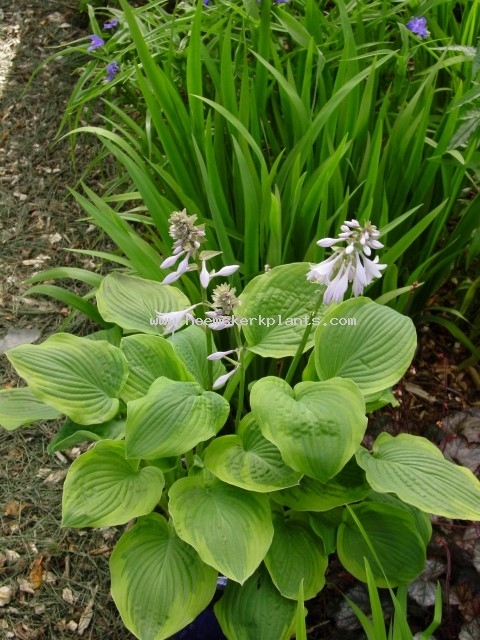 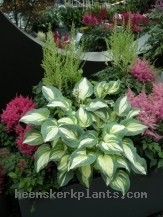 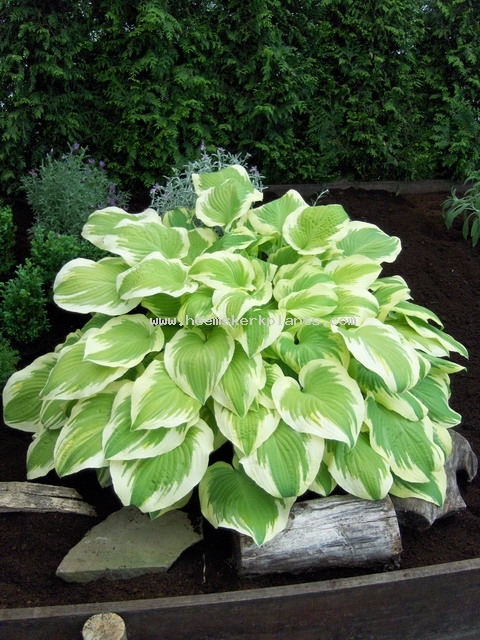 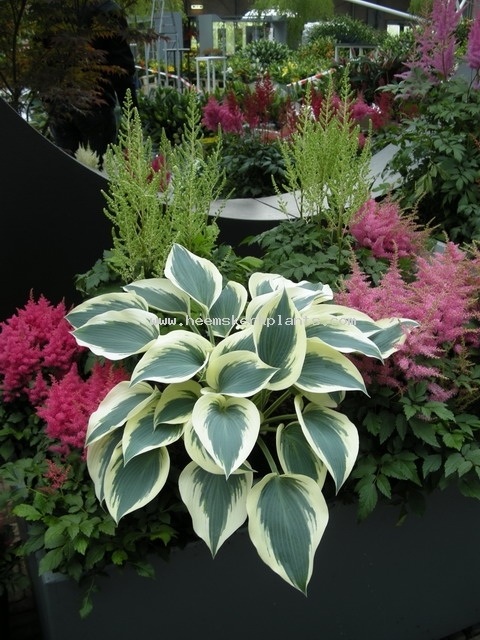 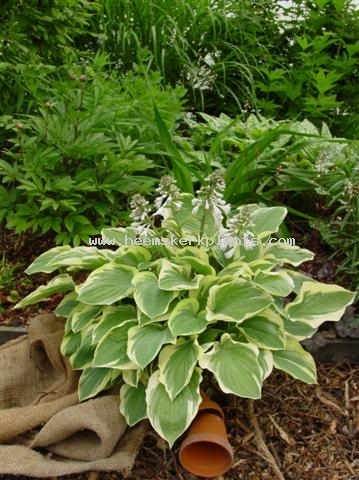 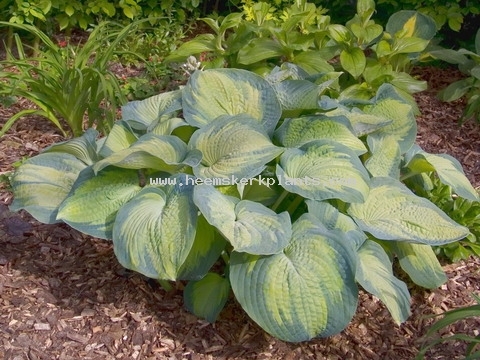 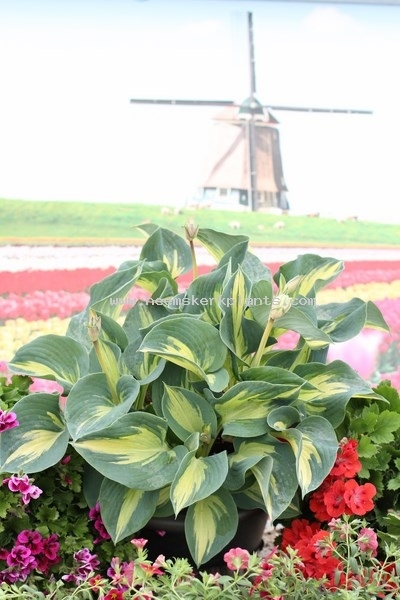 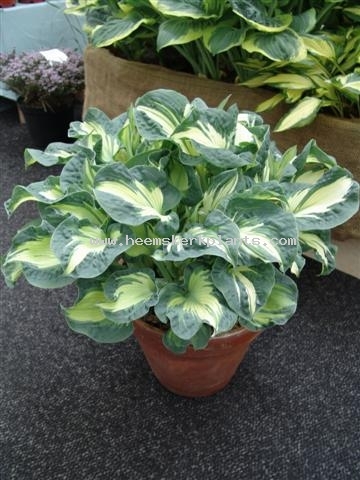 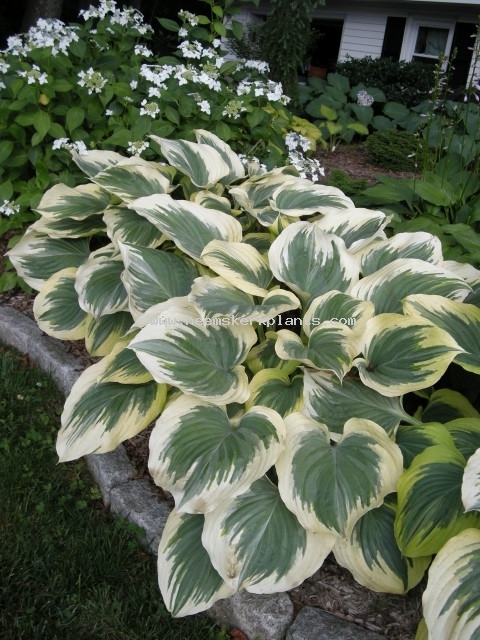 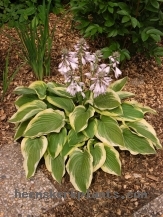 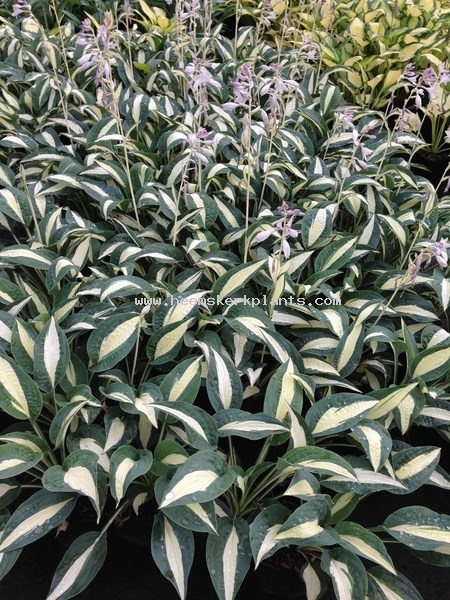 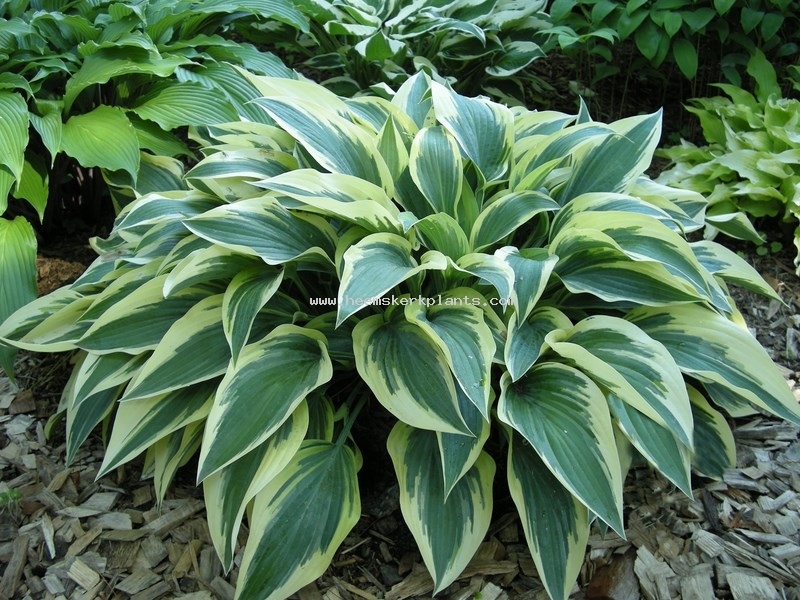 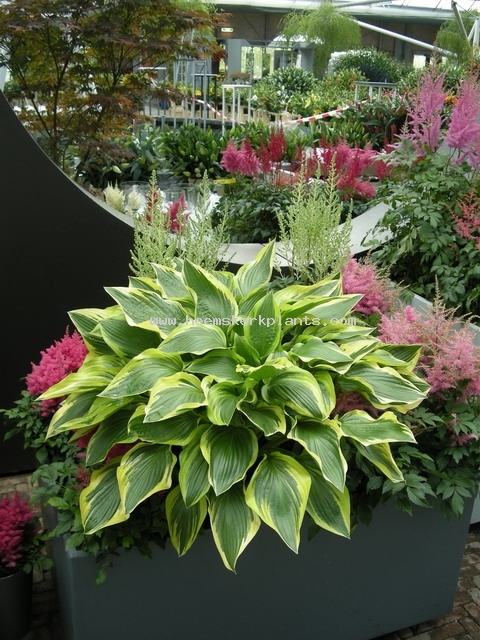 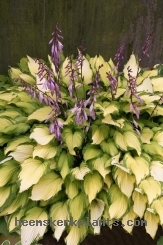 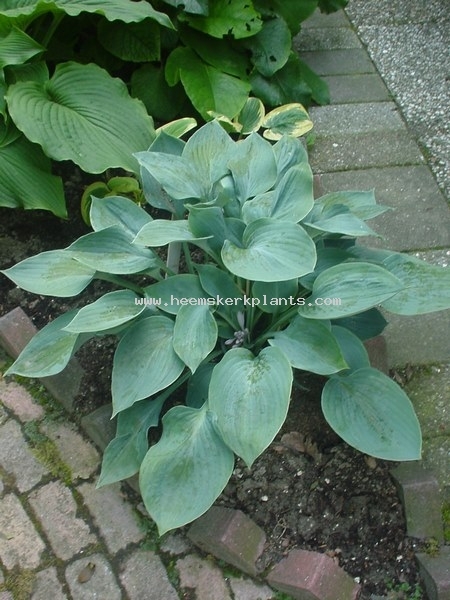 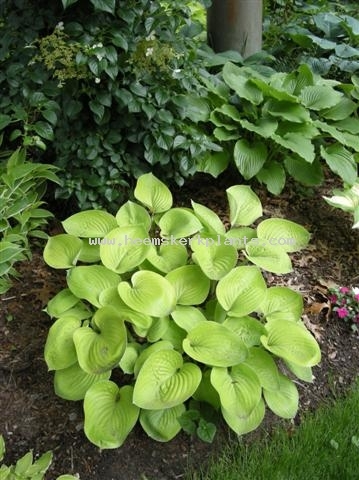 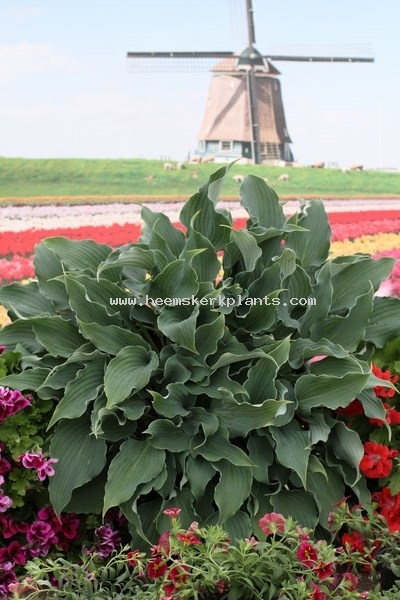 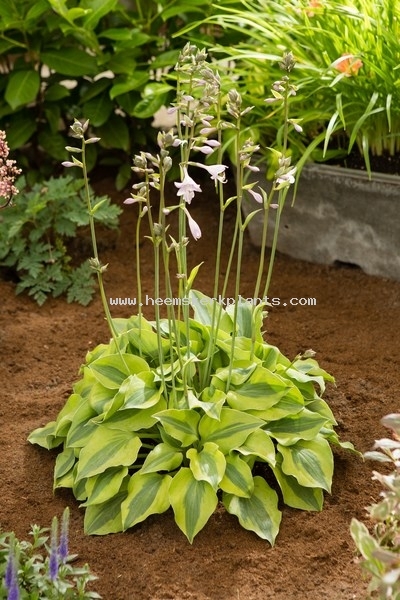 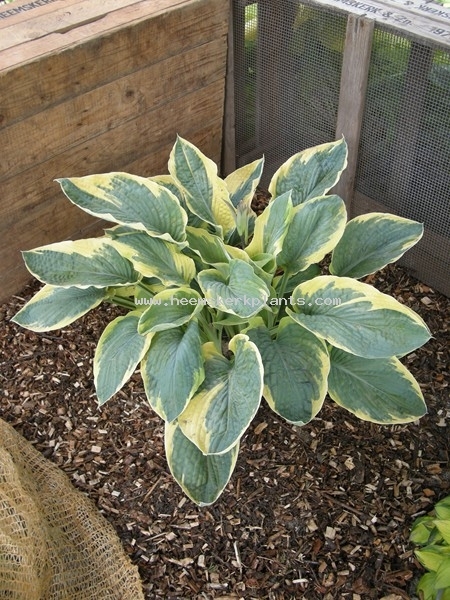 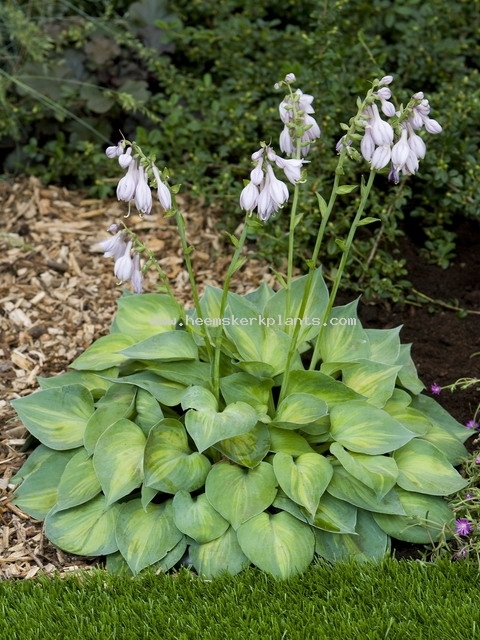 Beautiful medium to large Hosta. Leaf: Heart shaped leather leaves, tetraploid sport from award winner Victory. 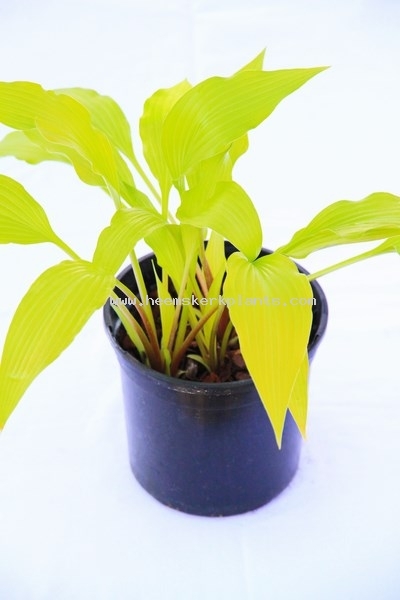 Leaf: Long sharp Yellow leaves on pure red stems. Leaf: A blue leaf with a small yellow center. 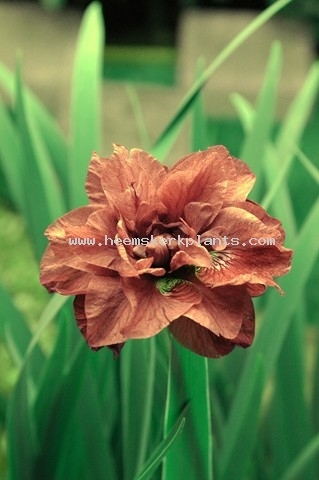 A member in the Halcyon type family. 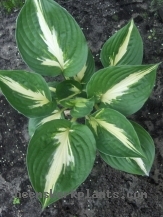 Leaf: Light green later yellow center with blueish green edge. 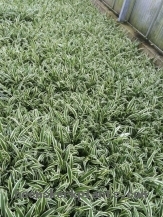 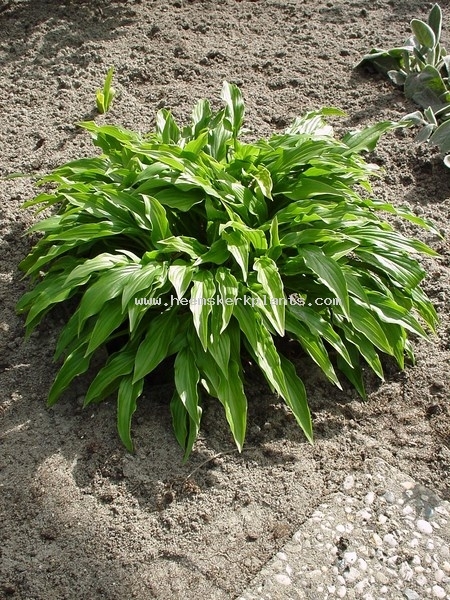 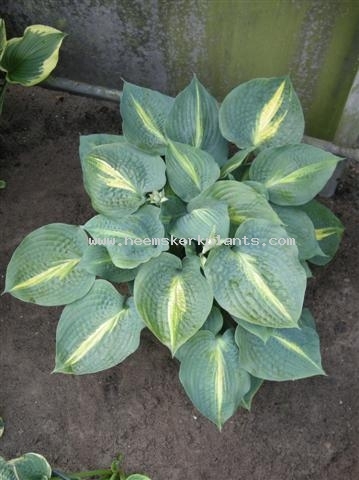 Leaf: Blue leaf with clear white center, good grower for a whtie centered plant. Leaf: Fabulous blue-green sport of 'Chain Lightning'. 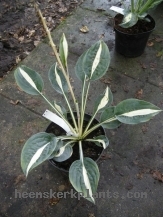 Leaf: Very thick green leaves with a wide flamed cream-white edge. 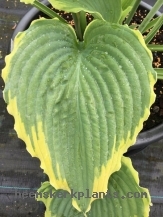 Leaf: Dark green heart shaped leaf and a narrow yellow edge, accentuating the rippled leaf margin. 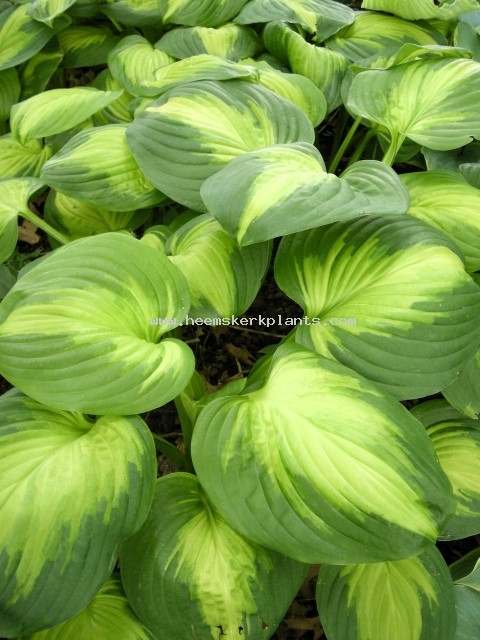 Leaf: Light appelgreen leaf with yellow margin. Later green leaves with cream-white margin. 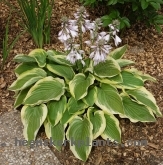 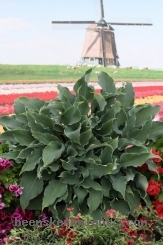 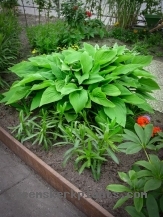 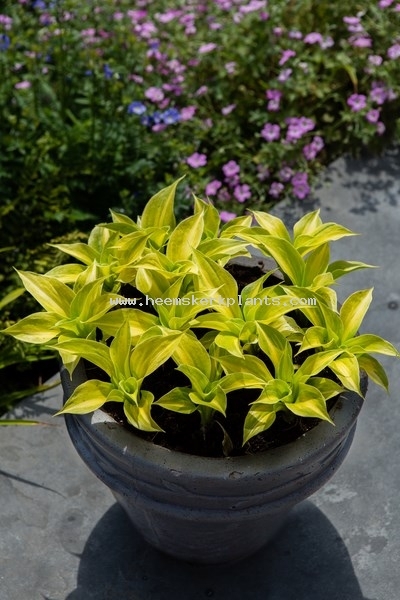 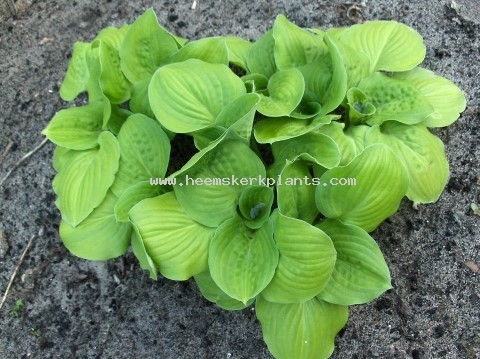 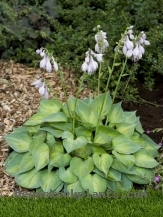 Good growing Hosta. 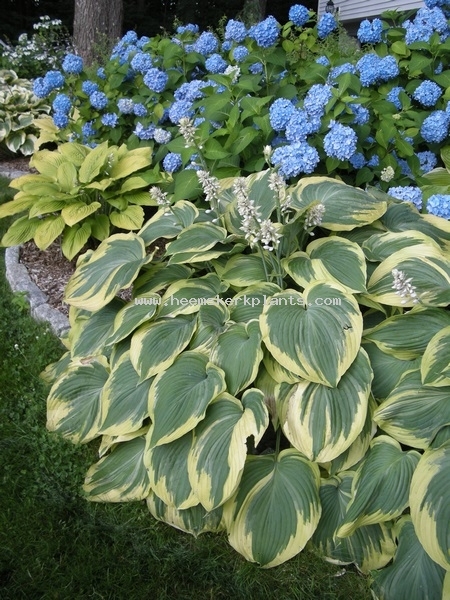 Leaf: Blue leaves with a nice white center, is a sport from Kiwi Full Monty. 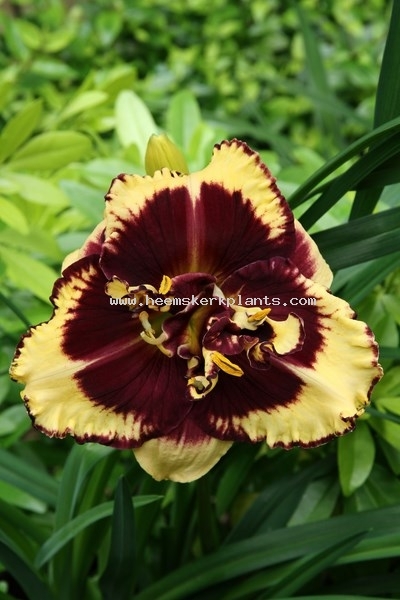 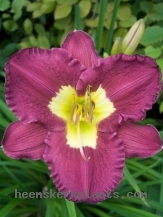 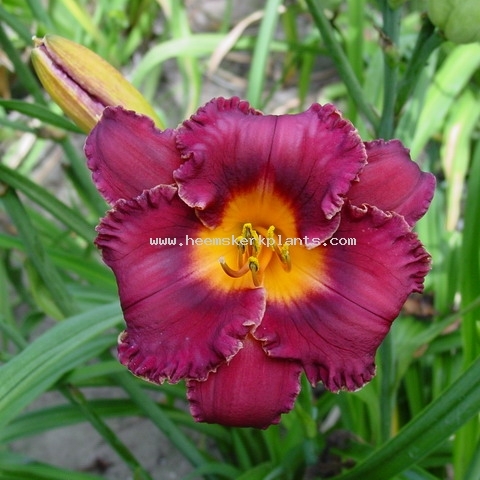 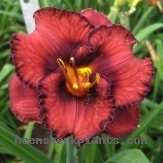 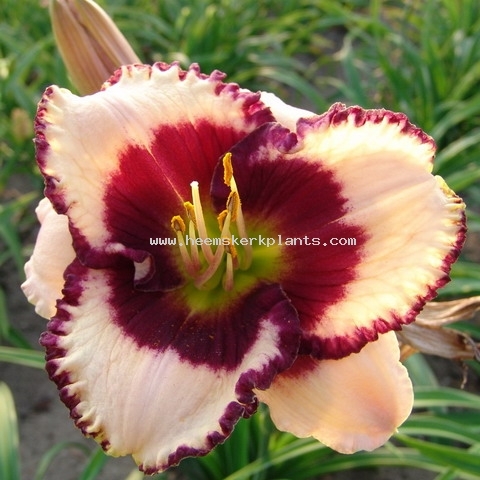 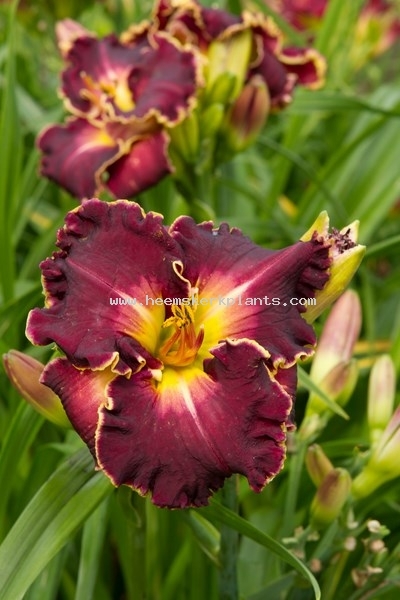 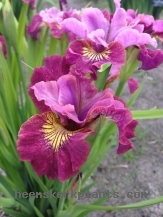 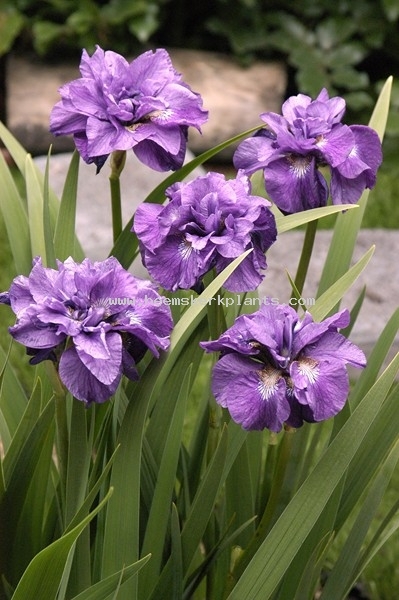 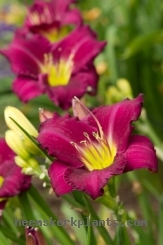 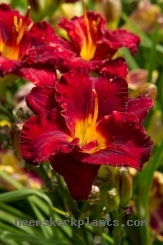 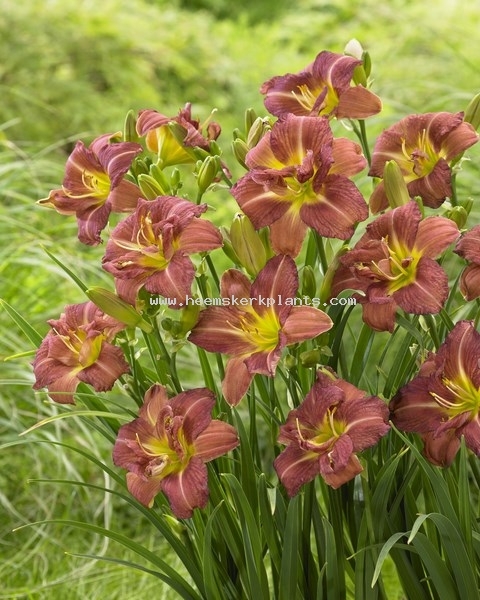 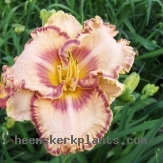 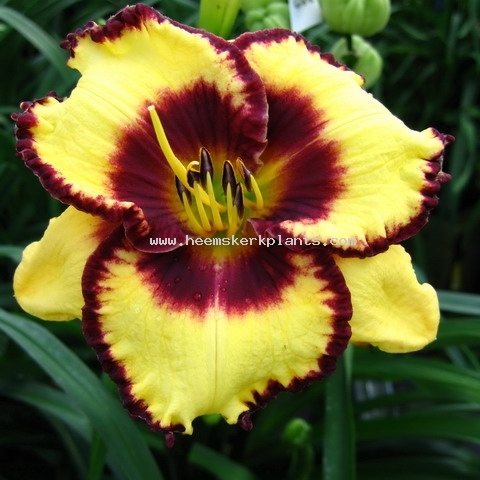 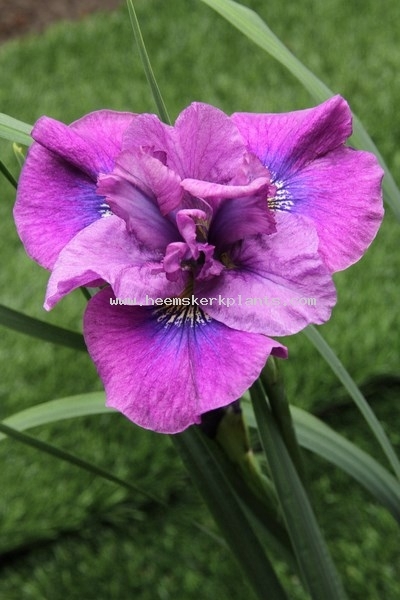 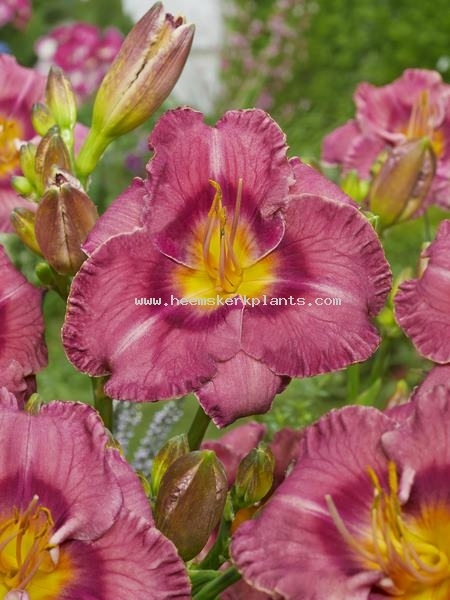 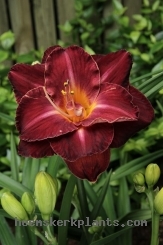 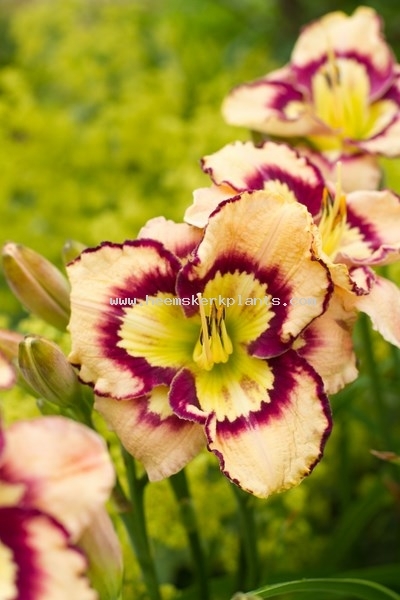 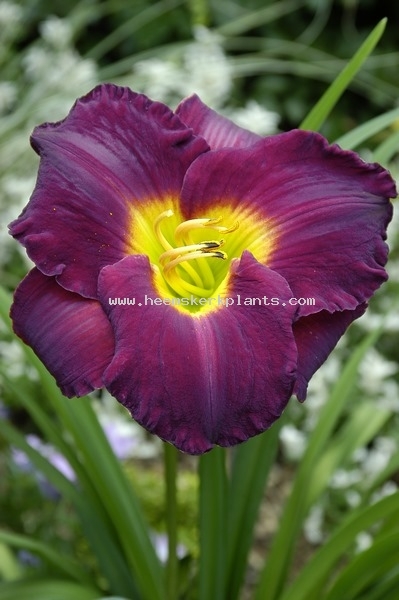 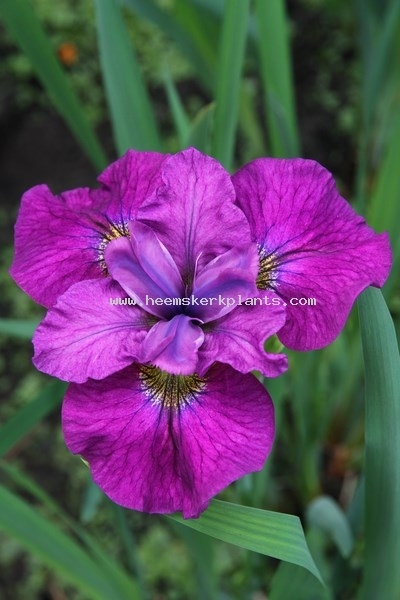 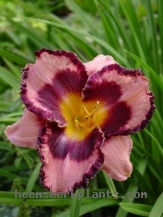 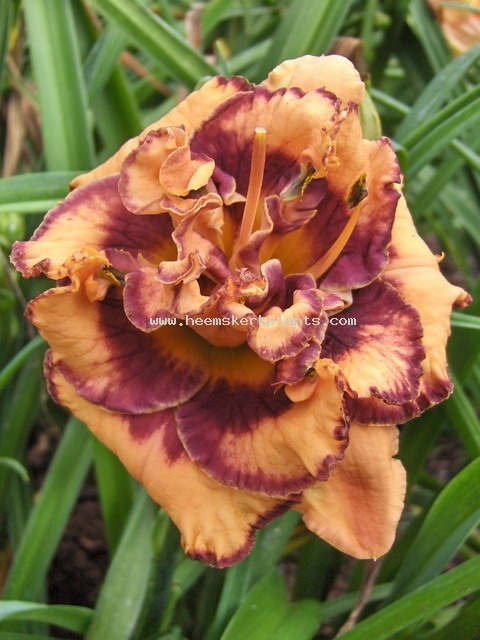 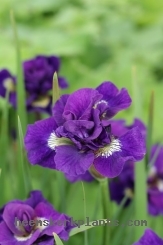 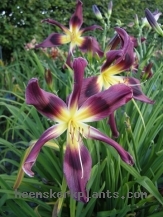 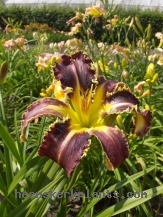 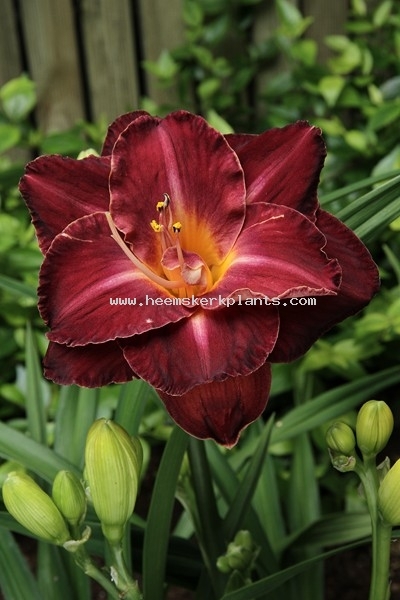 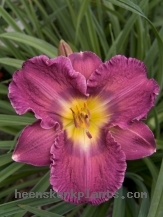 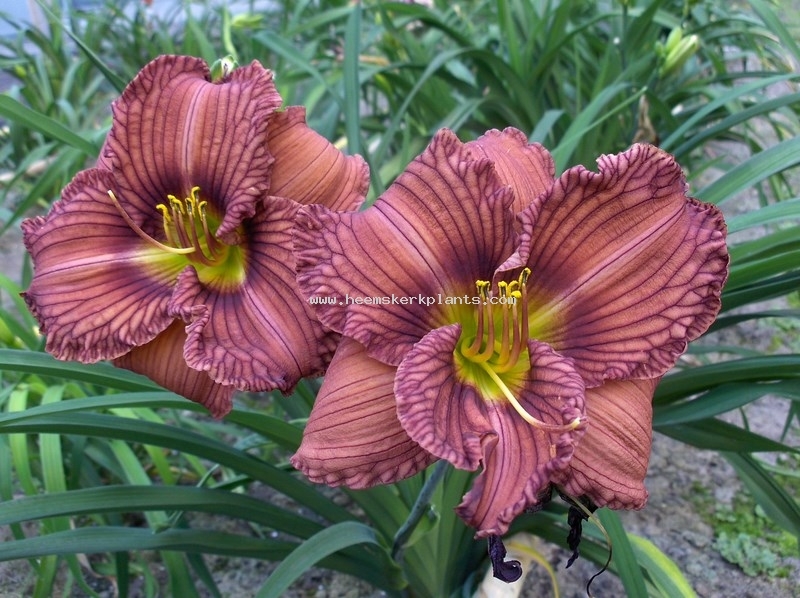 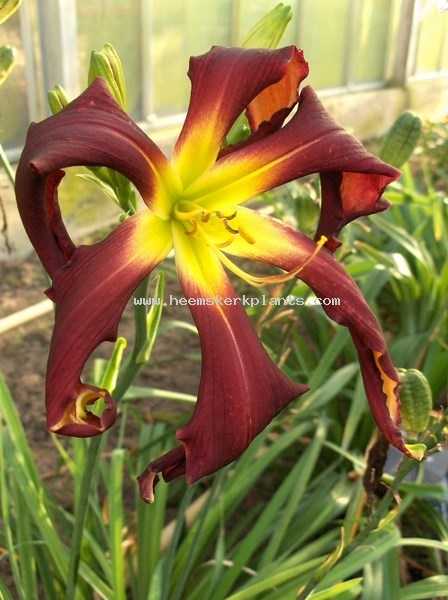 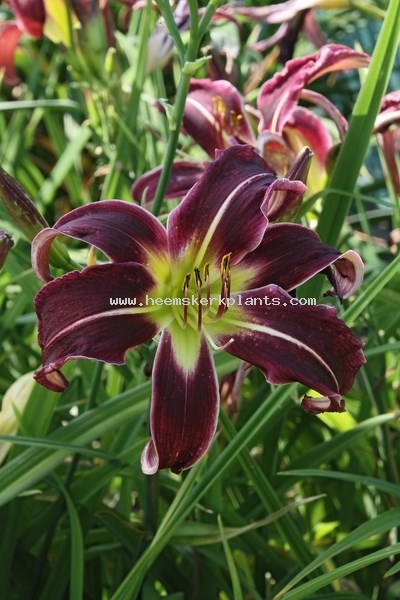 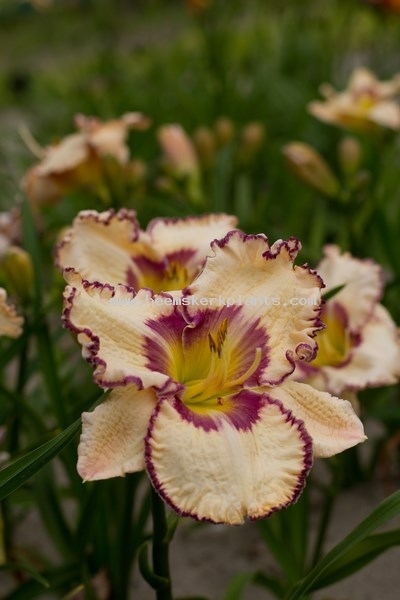 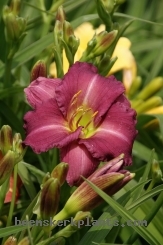 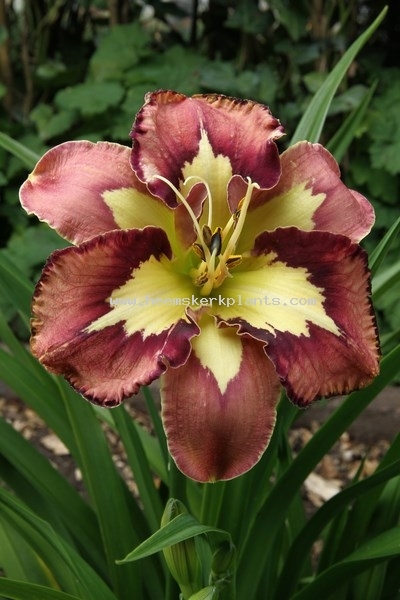 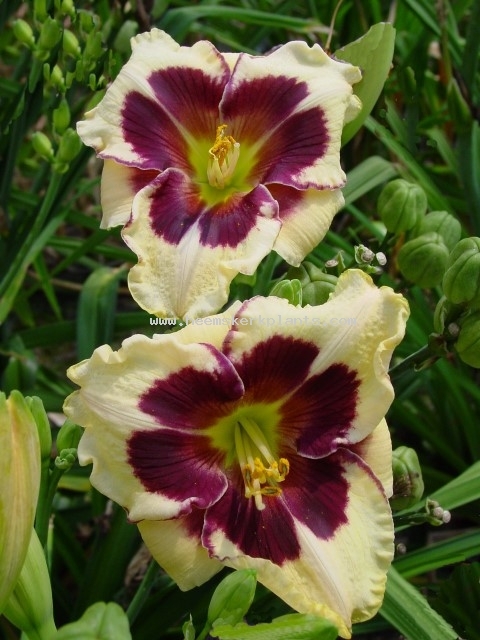 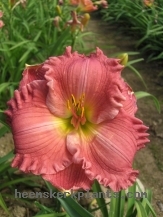 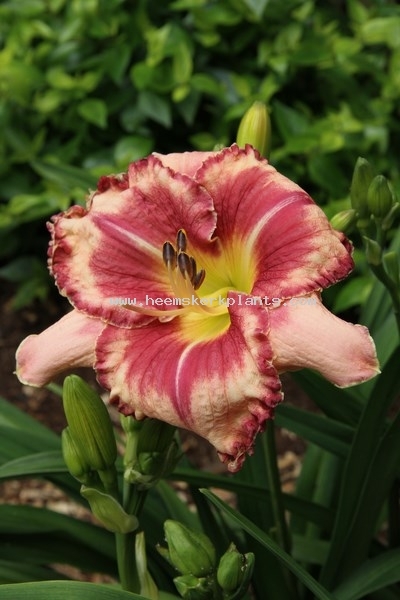 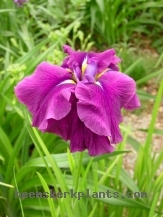 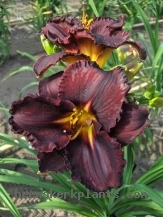 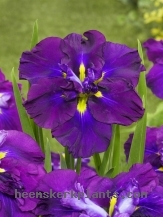 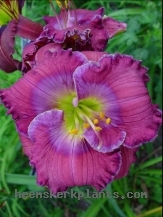 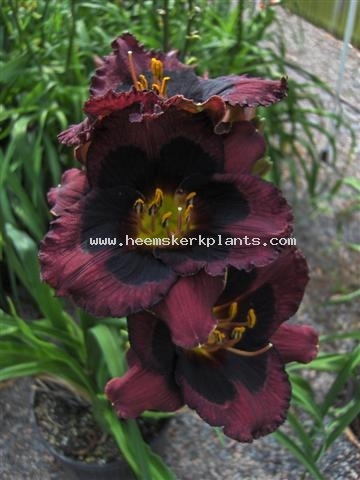 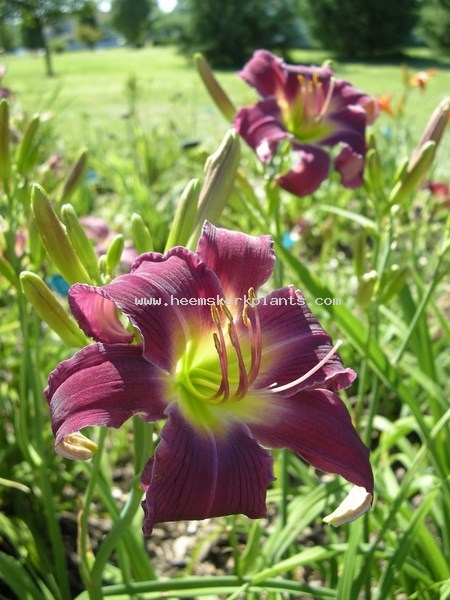 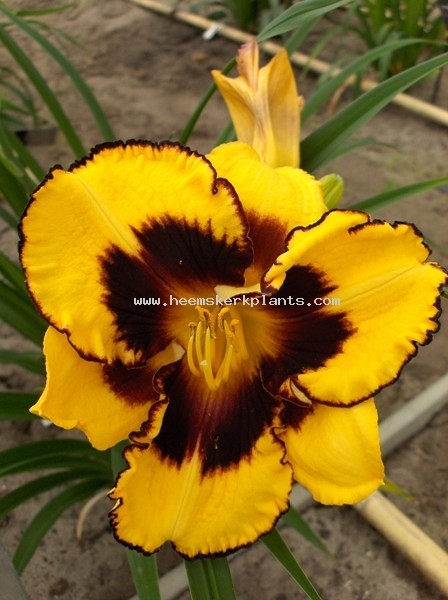 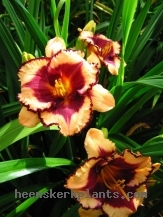 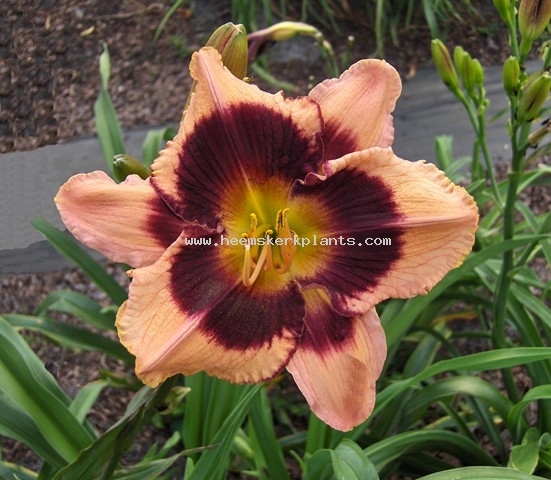 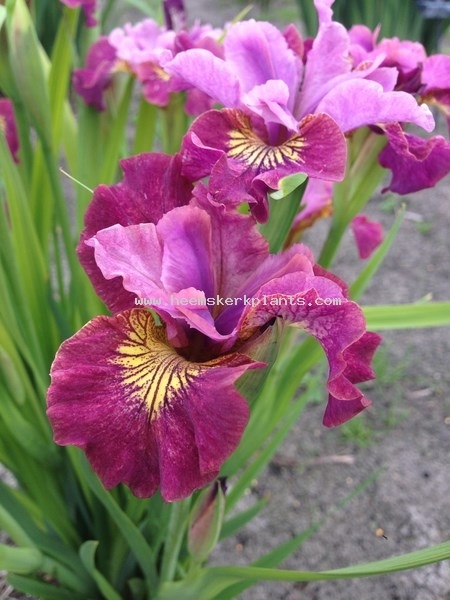 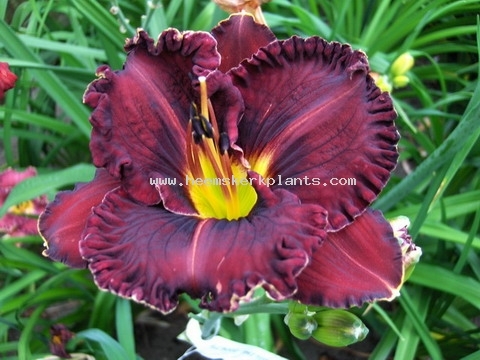 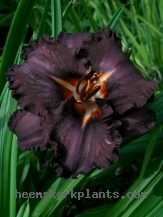 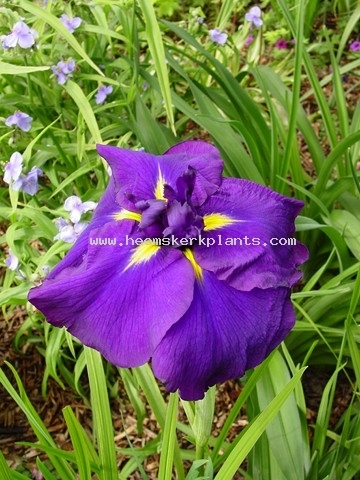 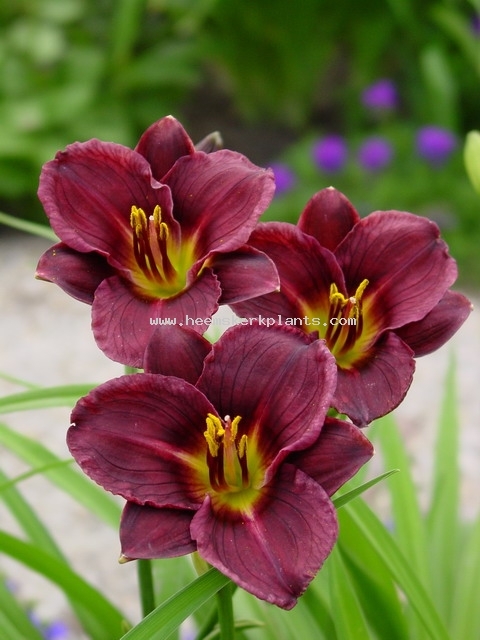 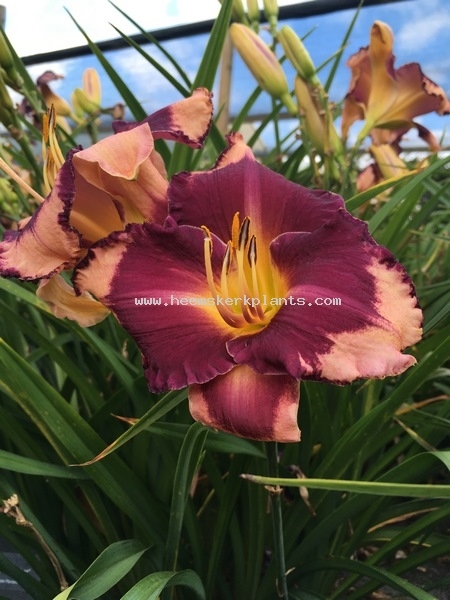 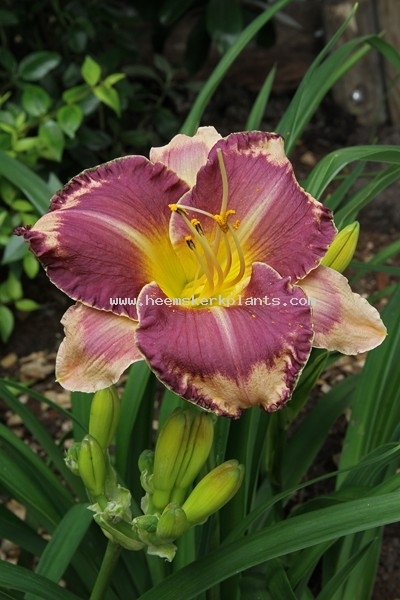 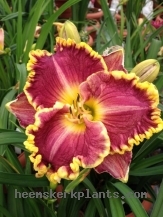 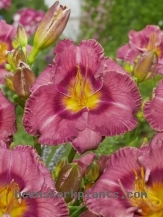 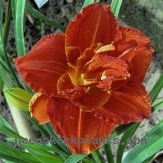 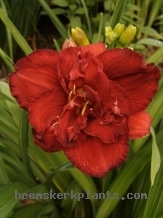 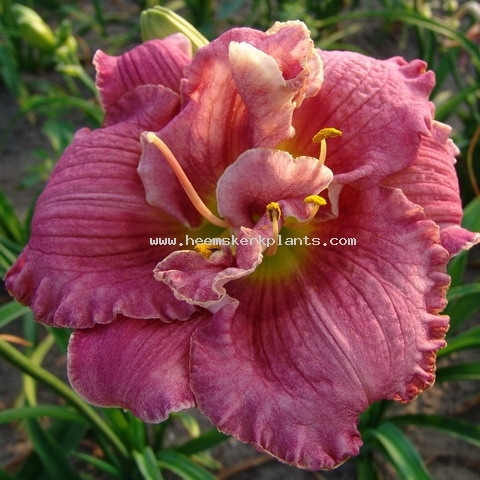 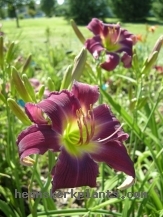 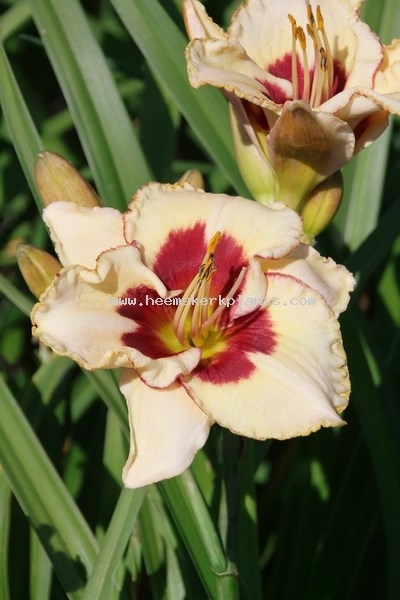 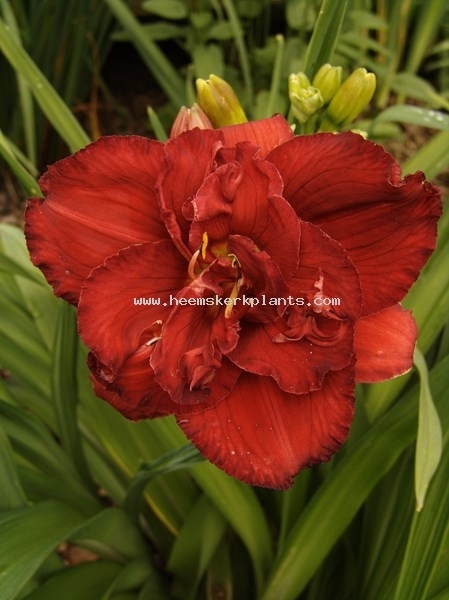 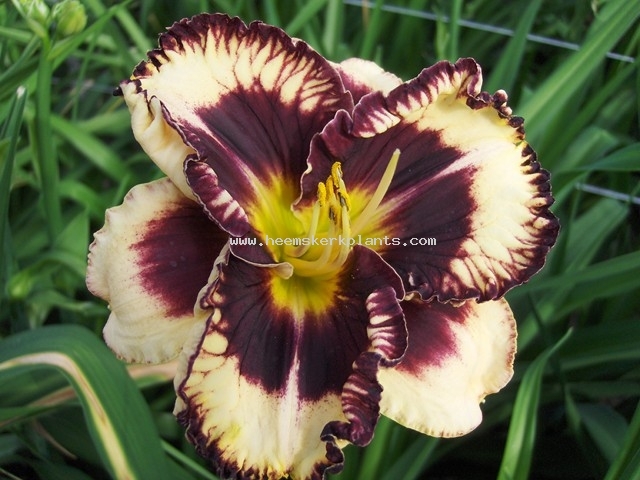 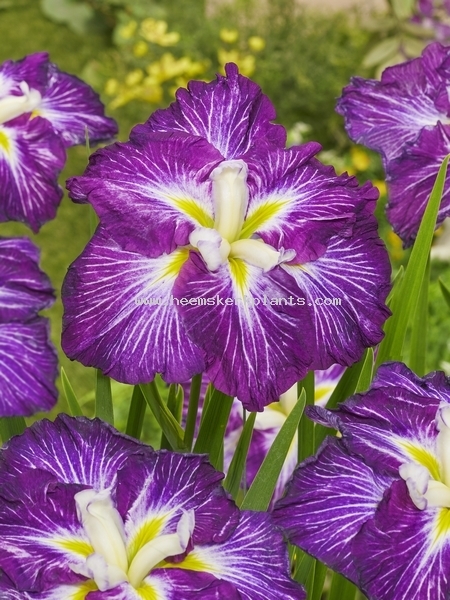 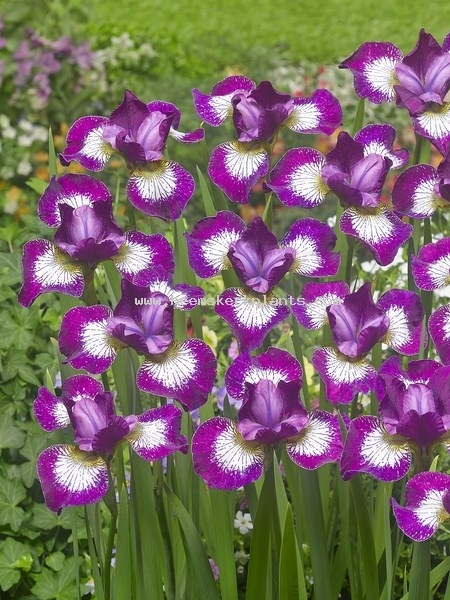 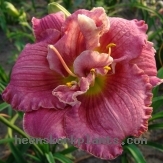 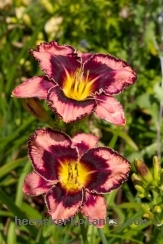 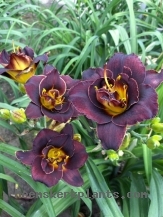 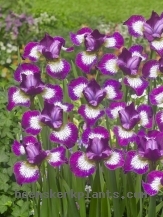 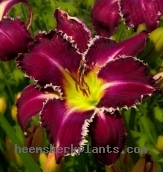 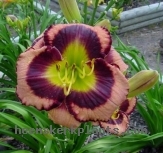 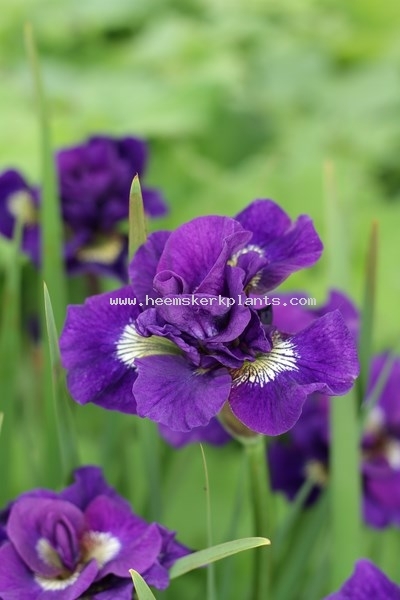 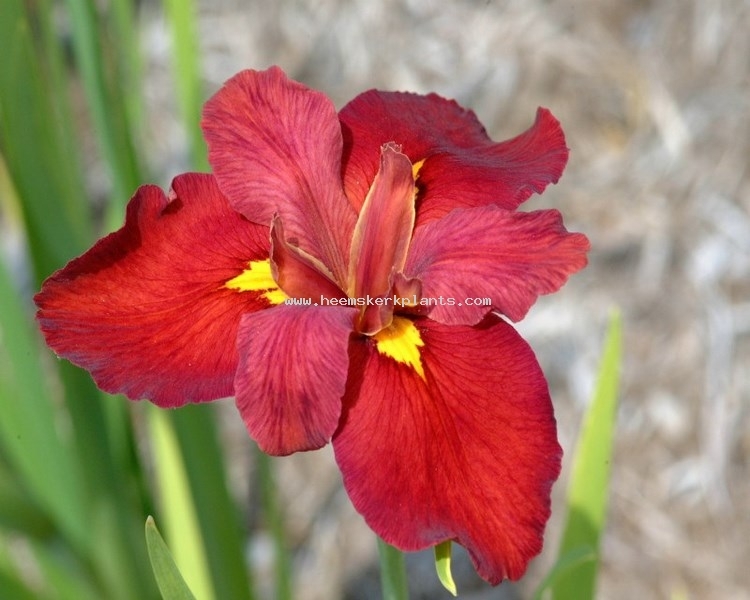 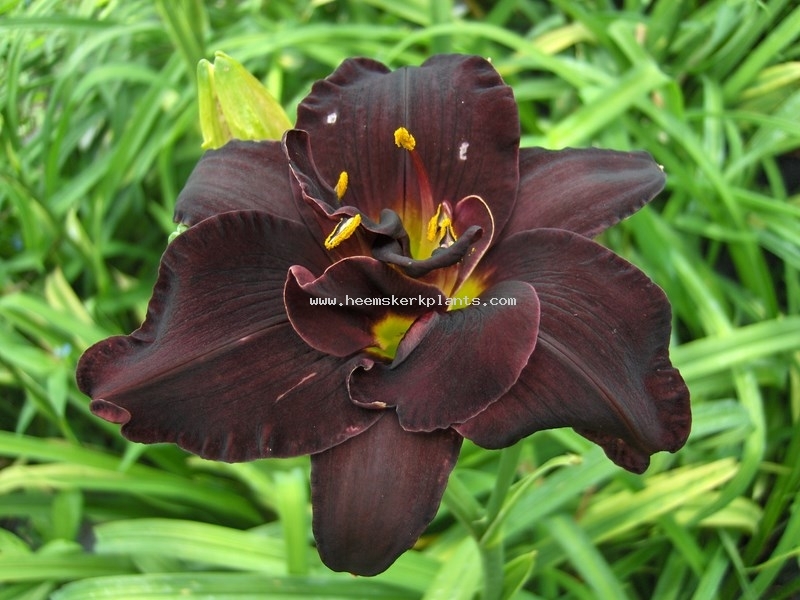 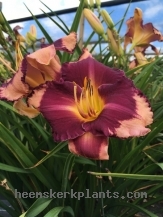 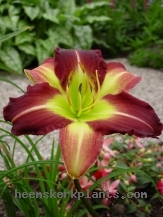 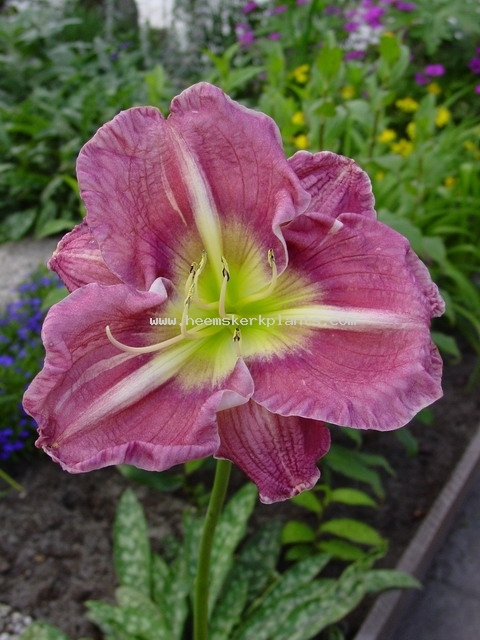 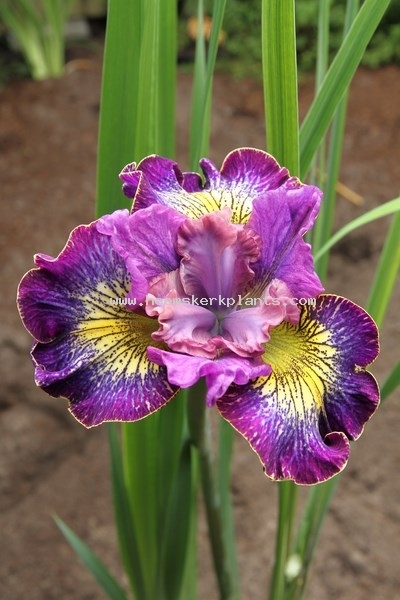 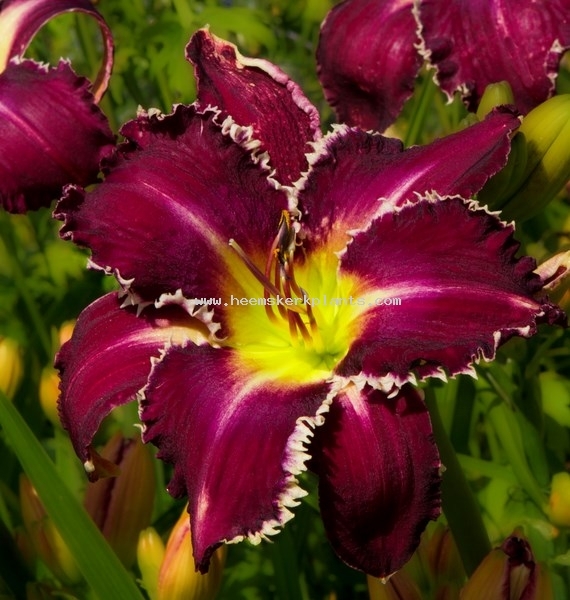 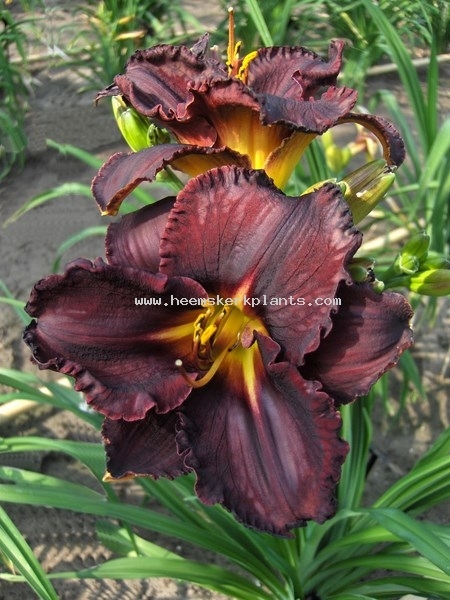 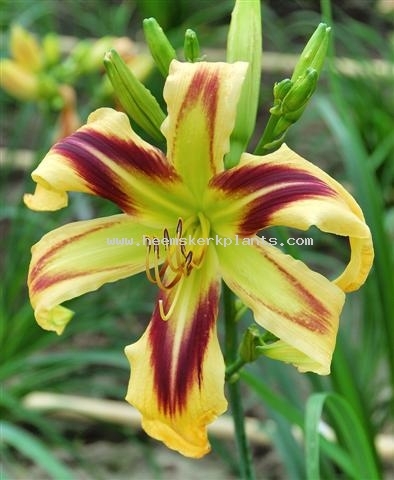 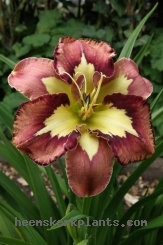 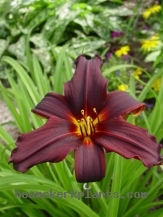 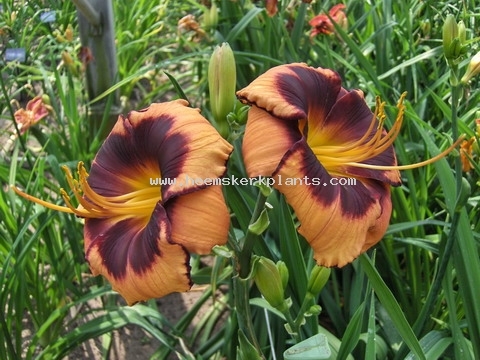 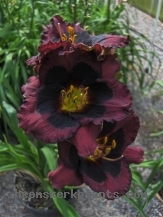 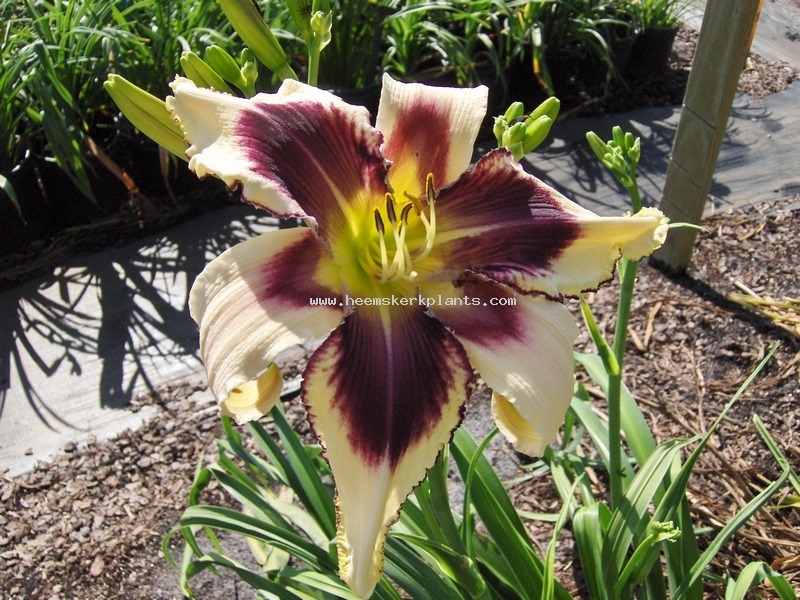 Definition: Red violet with very light contrasting standards. 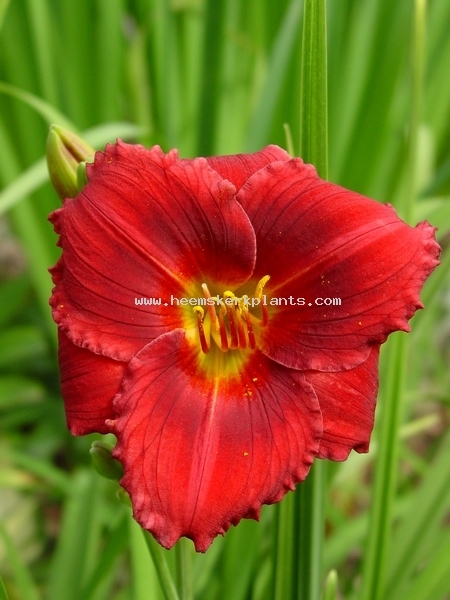 Definition: Gorgeous red standards with dark widely spaced veins. 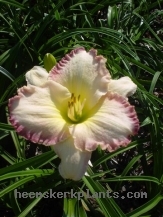 Definition: Standards diamond-dusted whtie; style arms white; falls diamond-dusted very pale lavender. 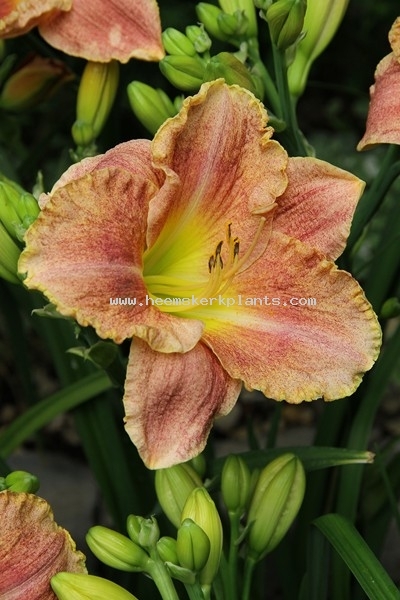 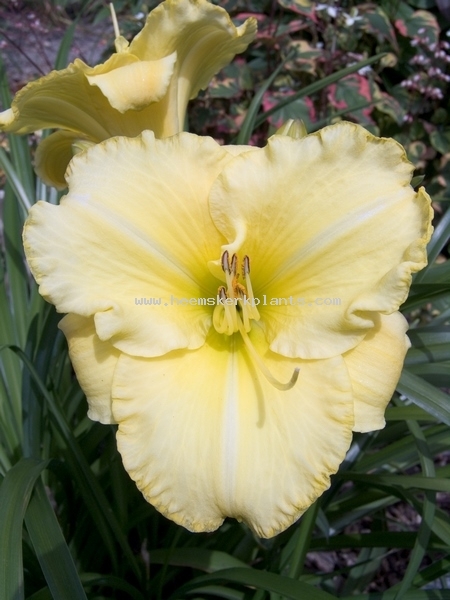 Definition: Striking watermelon falls with prominent yellow signal; cotnrasting lite pearl standards. 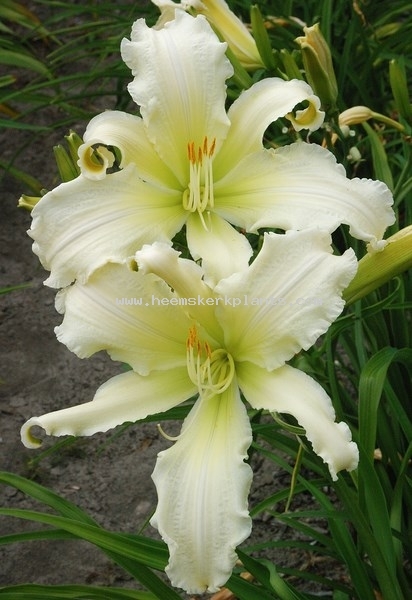 Definition: Very large white self makes a very attractive clump. 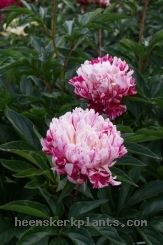 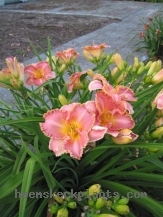 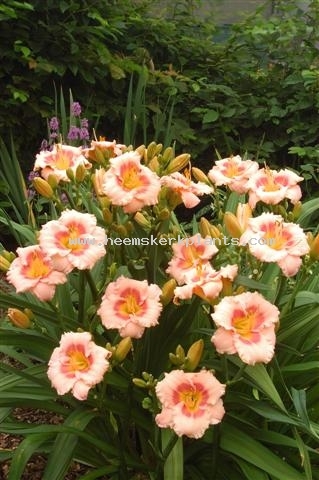 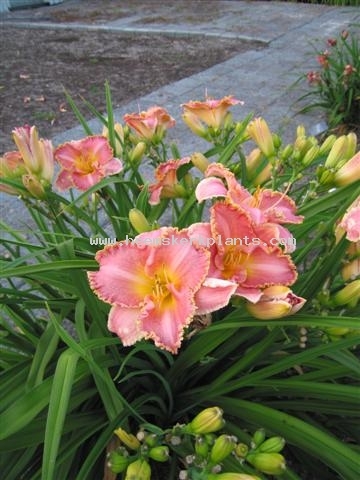 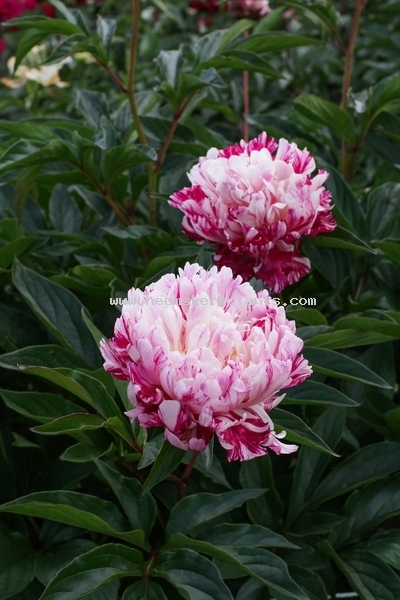 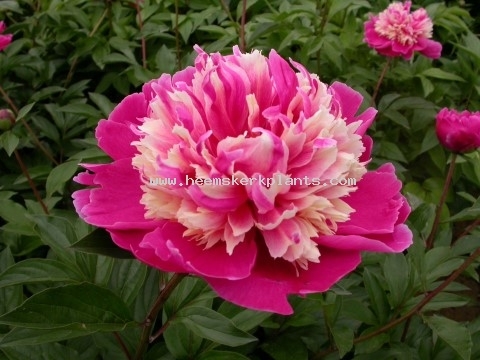 Definition: Nice pink flowers with darker streaks, very fragrant. 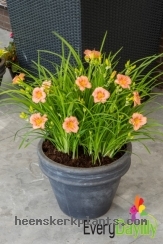 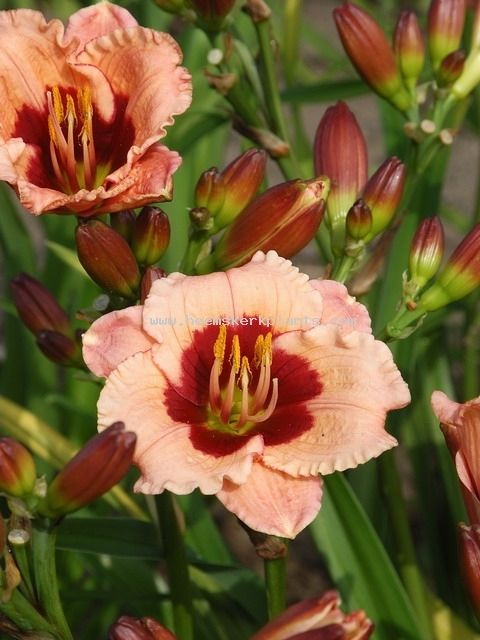 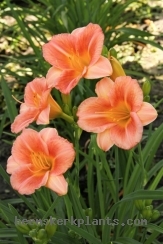 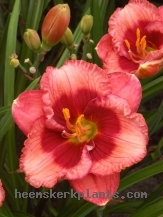 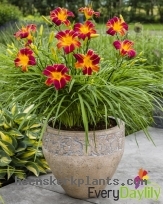 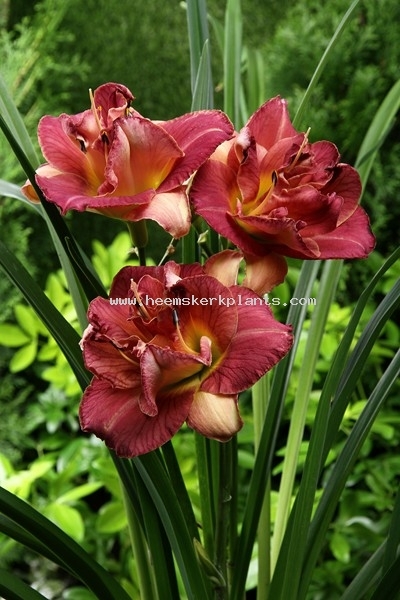 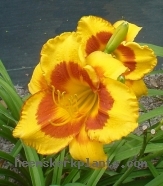 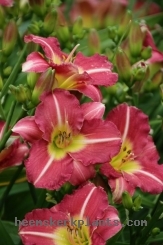 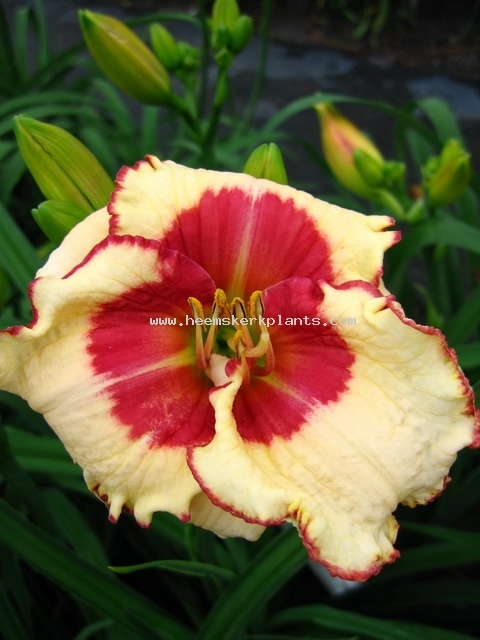 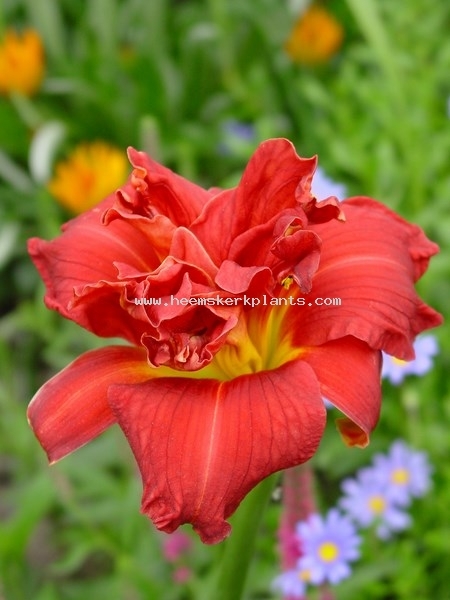 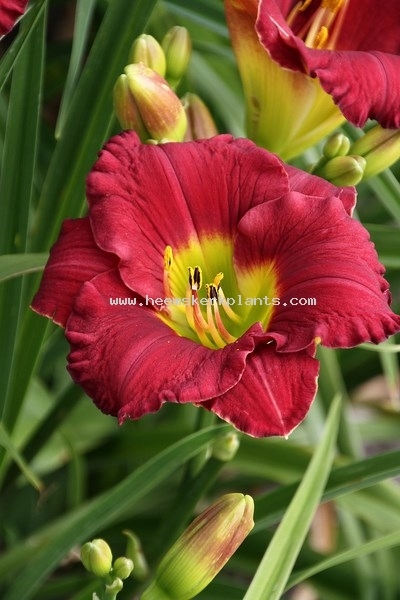 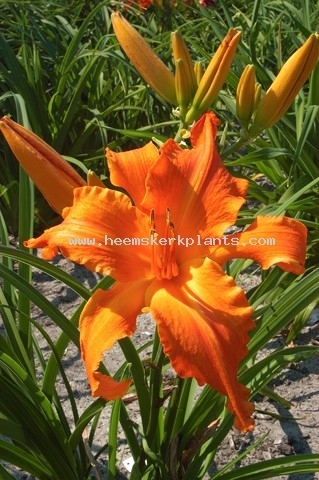 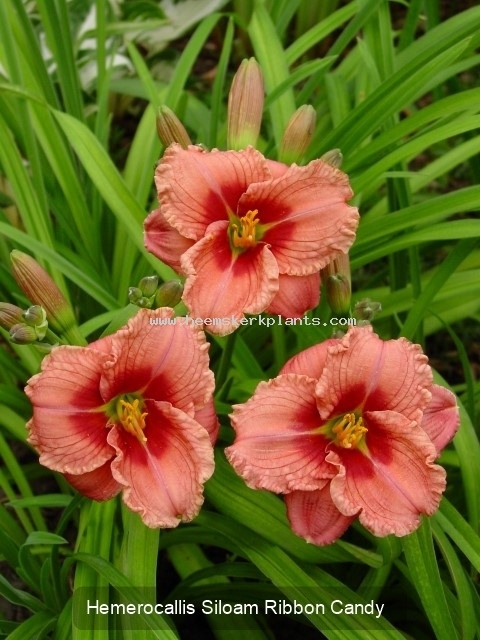 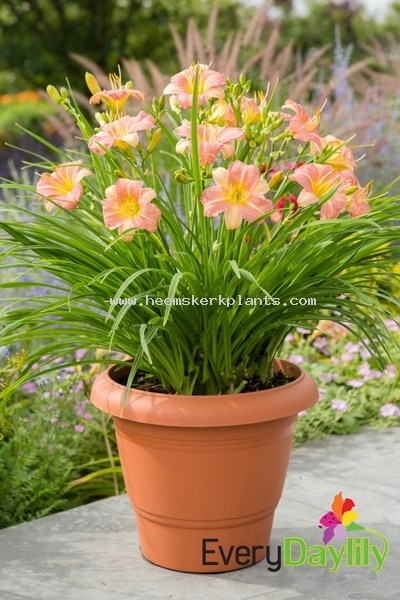 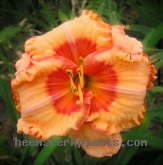 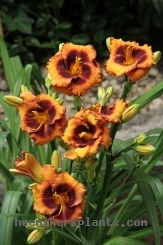 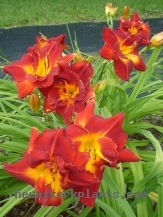 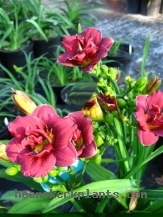 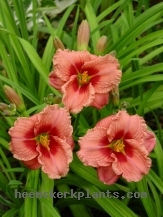 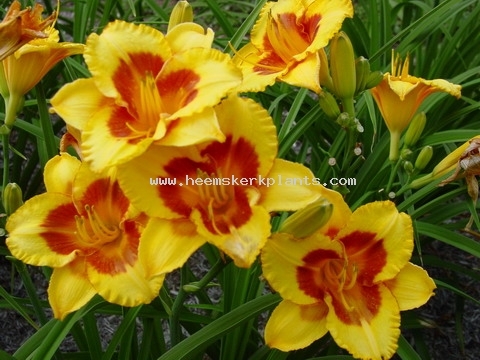 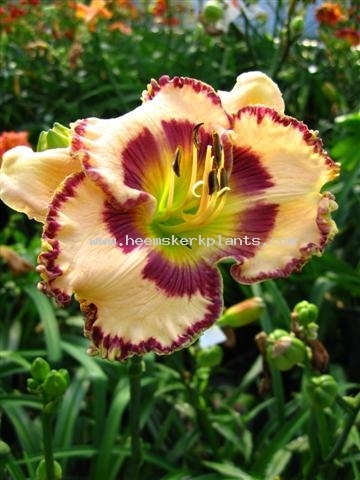 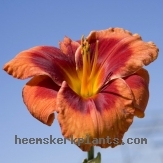 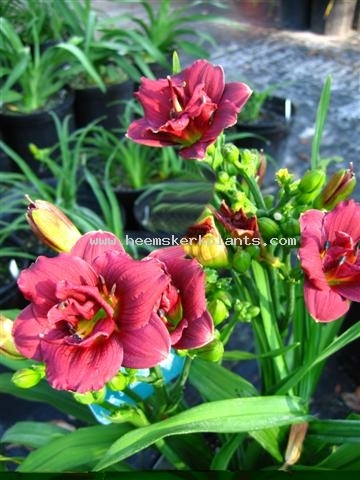 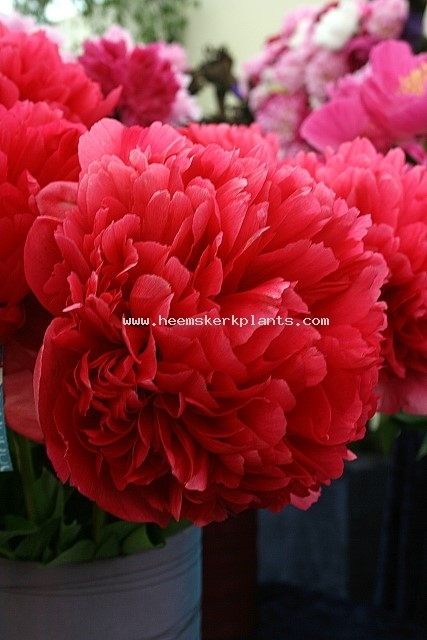 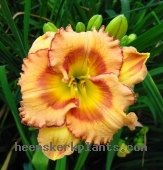 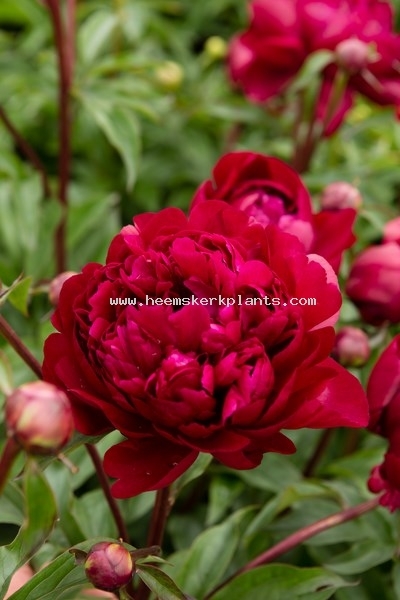 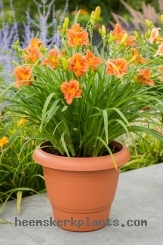 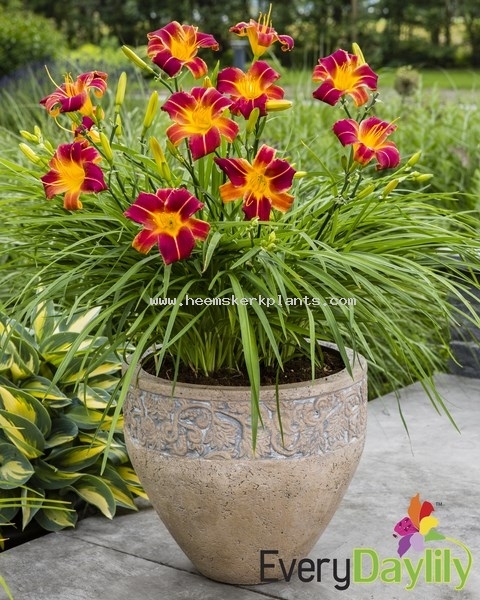 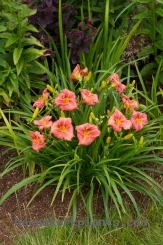 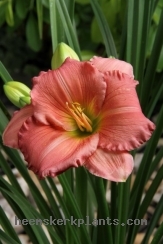 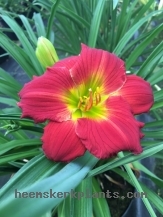 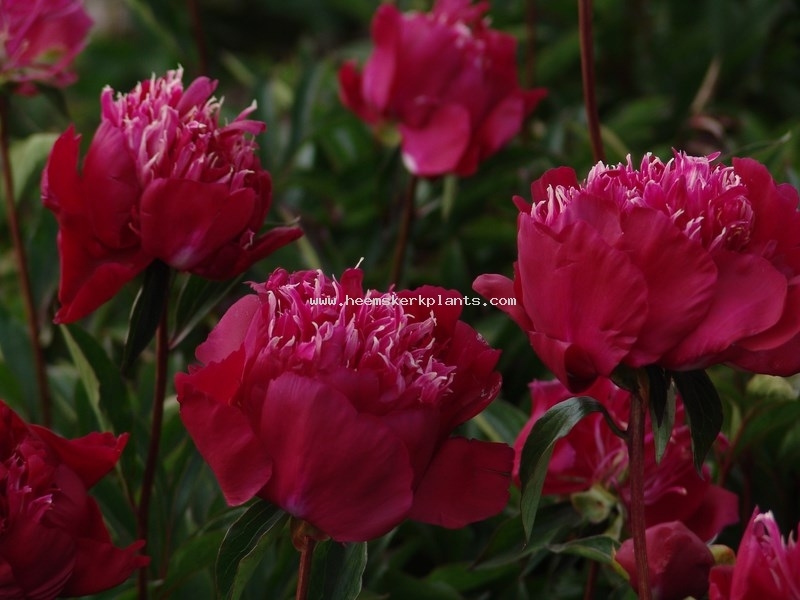 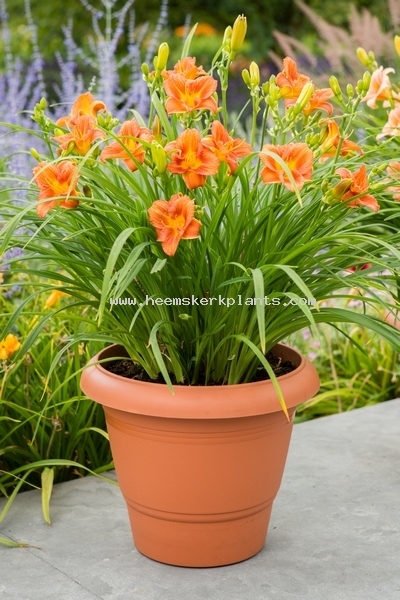 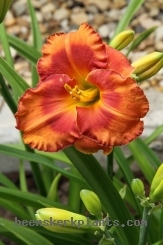 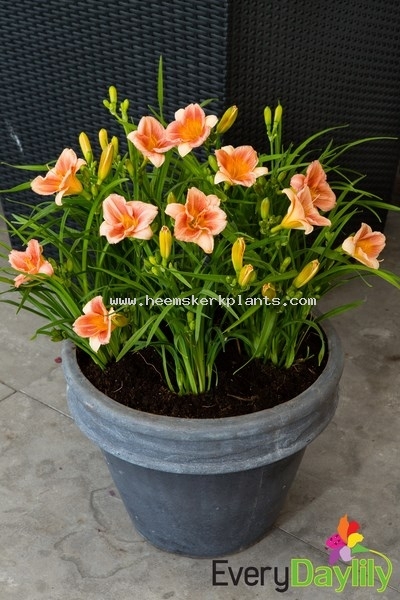 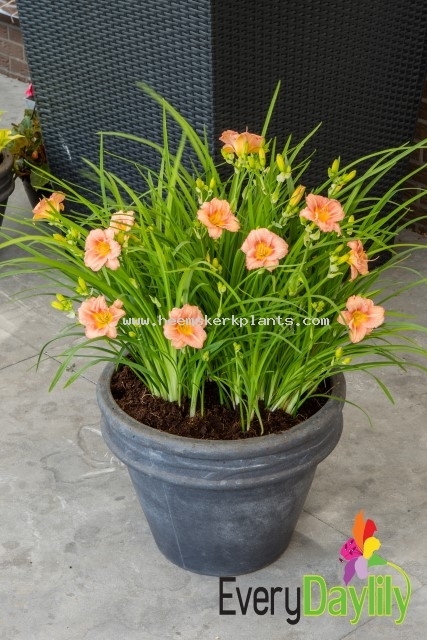 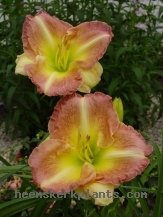 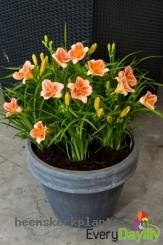 Definition: Red flowres, fast grower with shorter stems flowers very early. 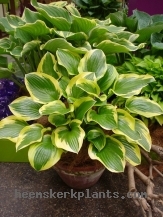 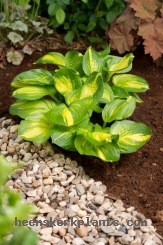 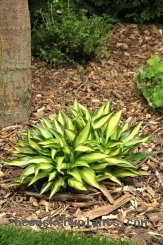 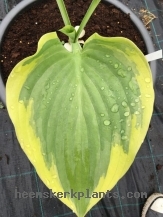 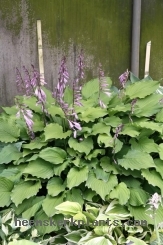 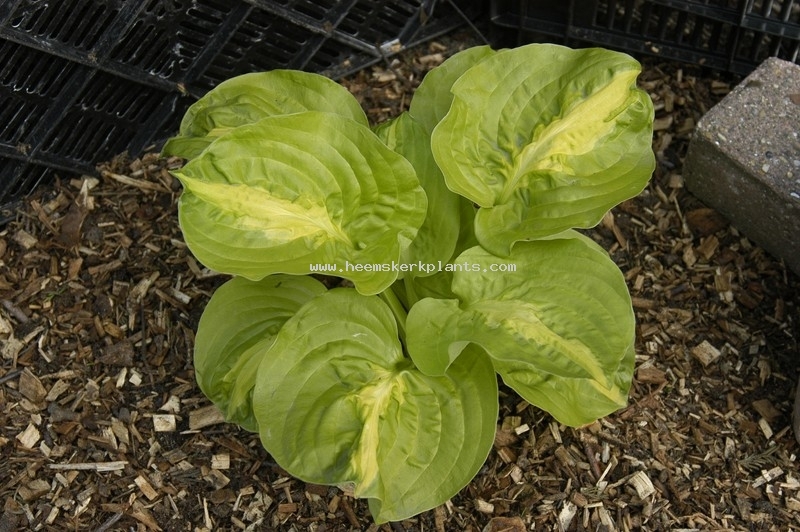 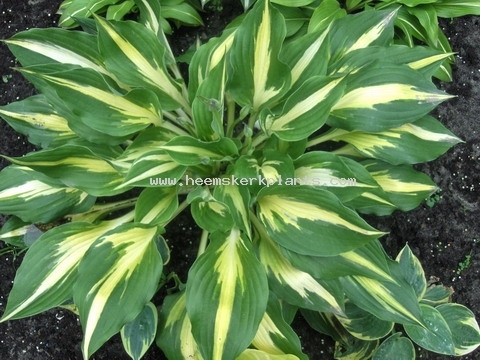 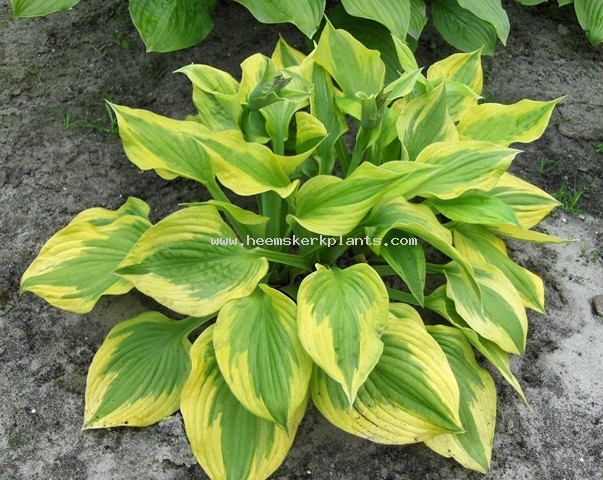 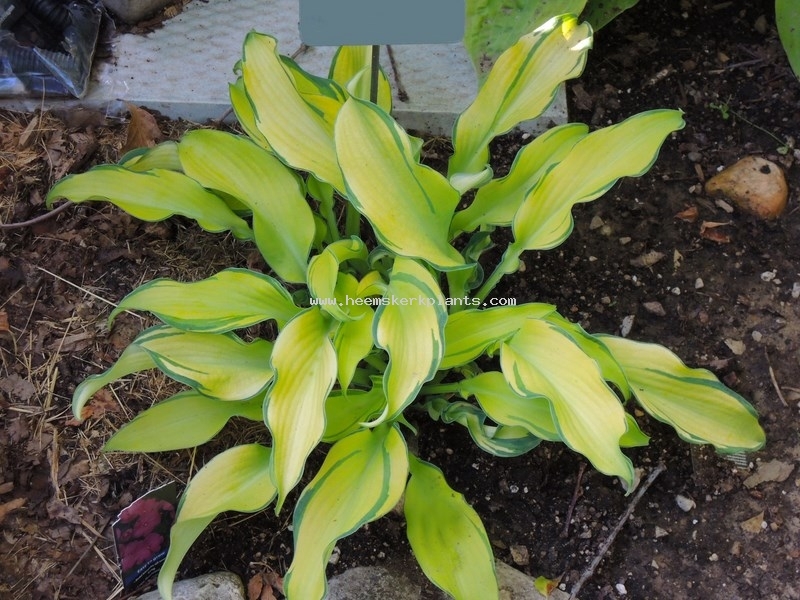 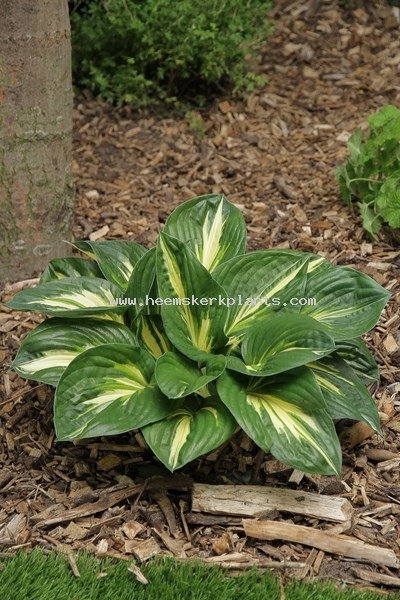 Leaf: First Hosta with yellow flowers. Green leaves. 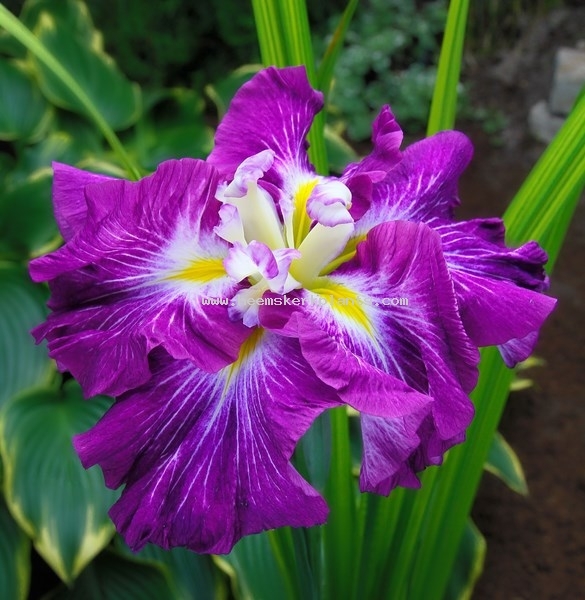 Definition: 9-12 petals. 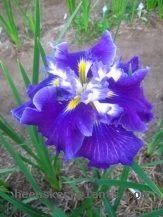 Medium blue. 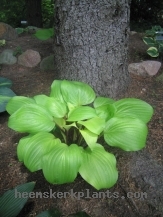 3 falls with 6+ standards and 3 styles. 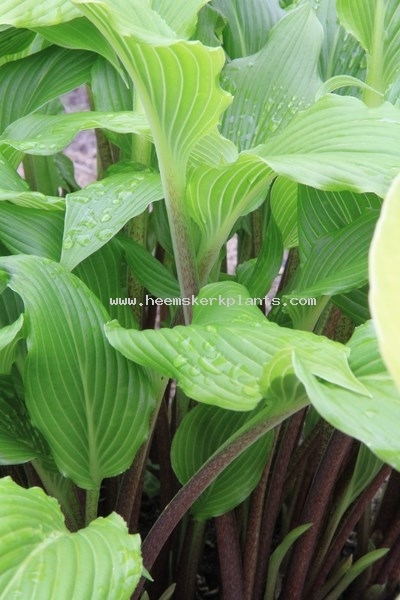 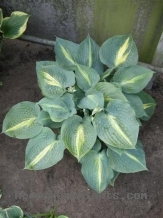 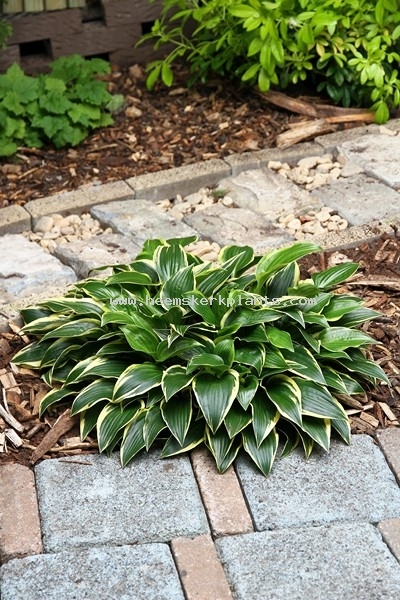 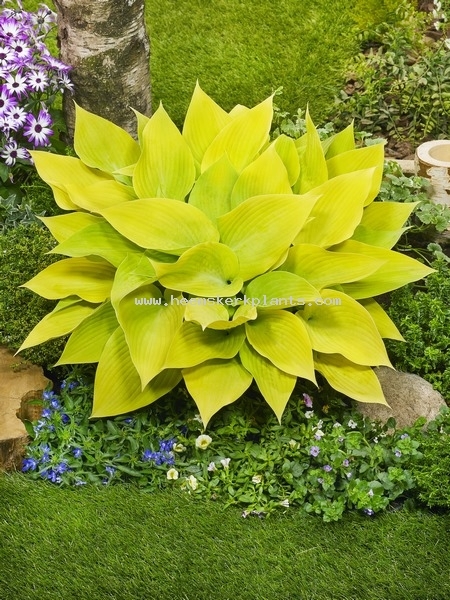 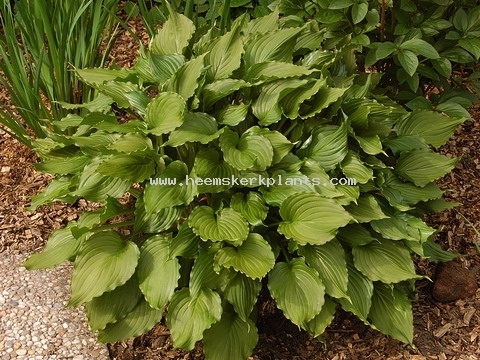 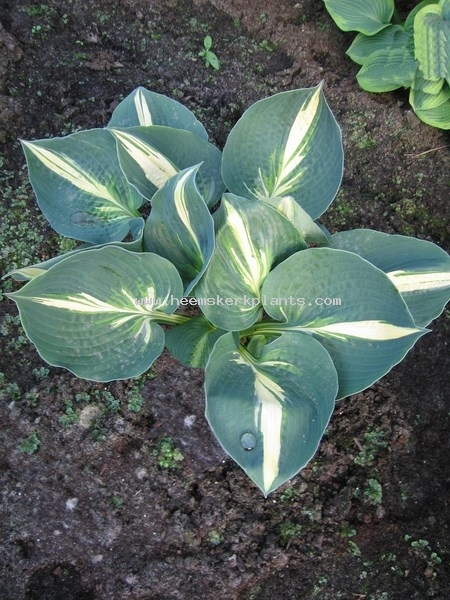 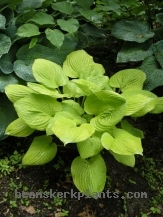 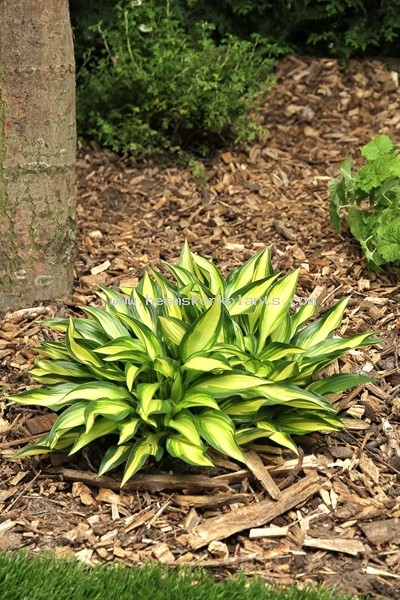 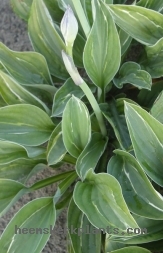 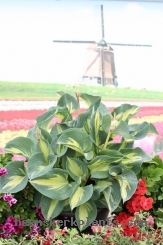 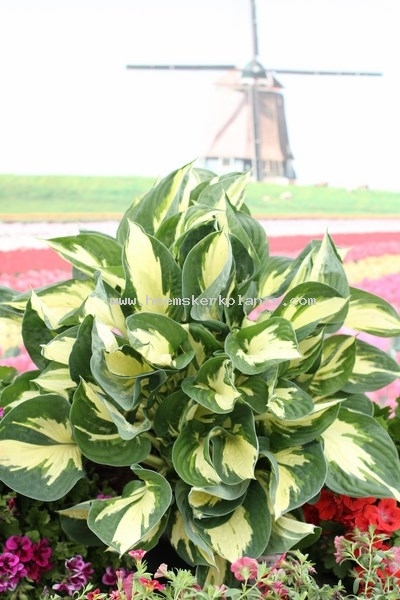 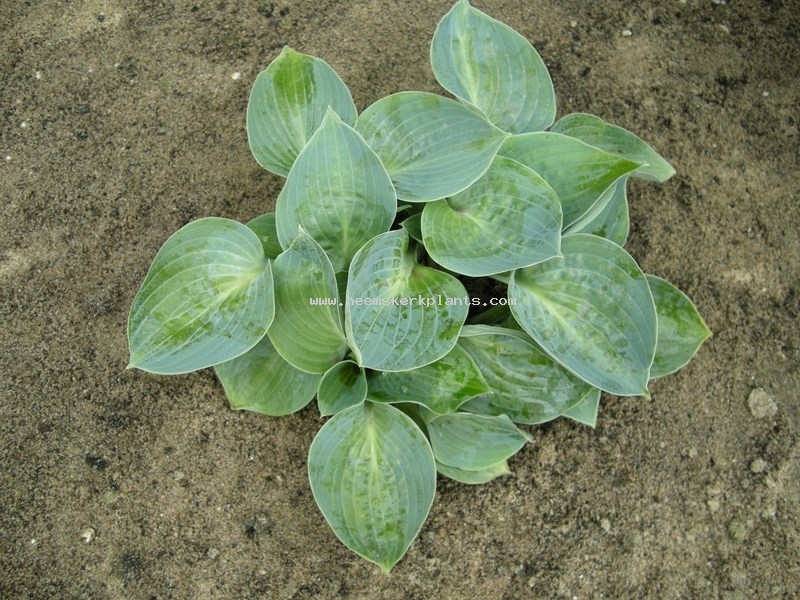 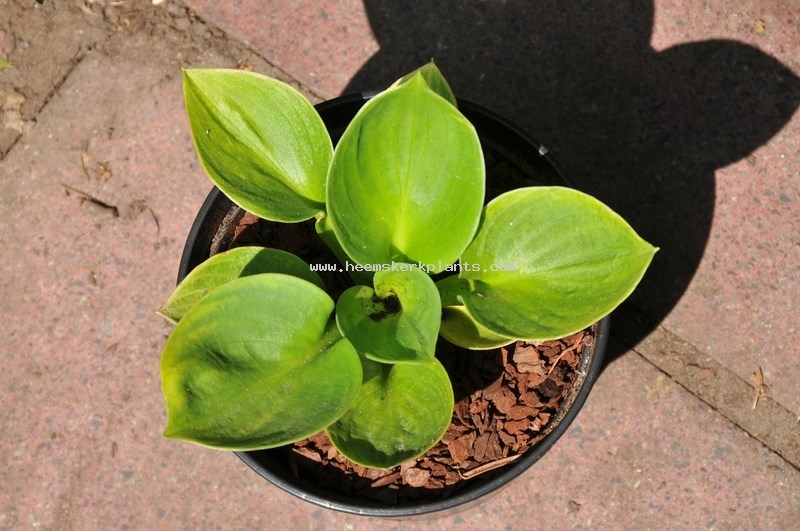 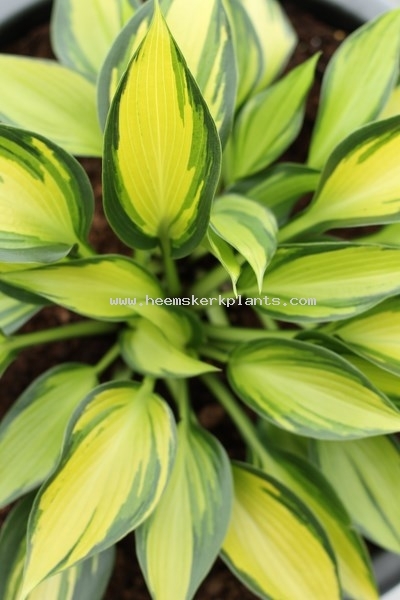 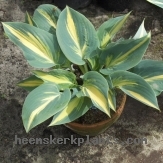 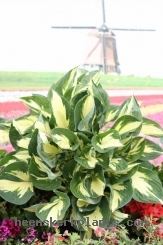 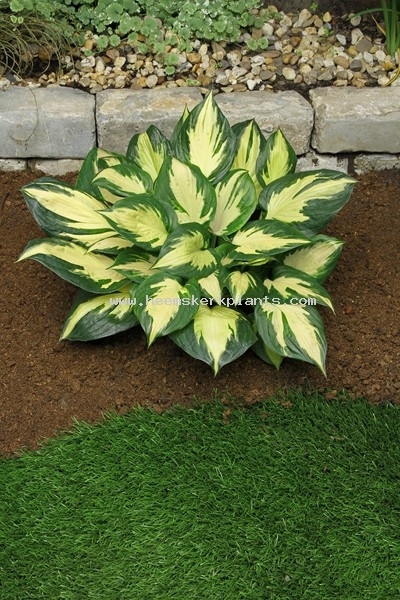 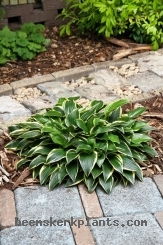 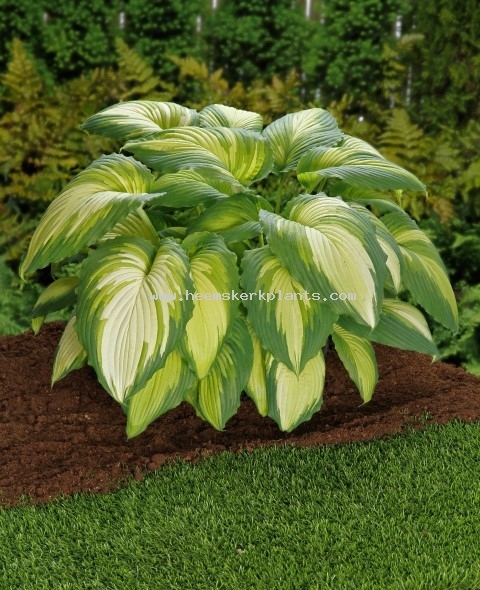 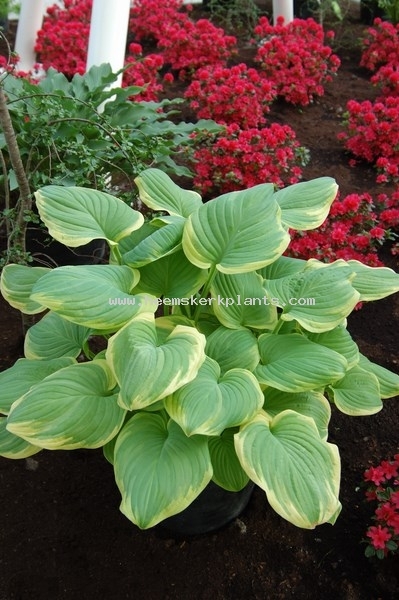 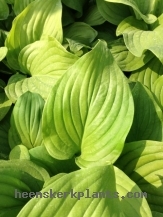 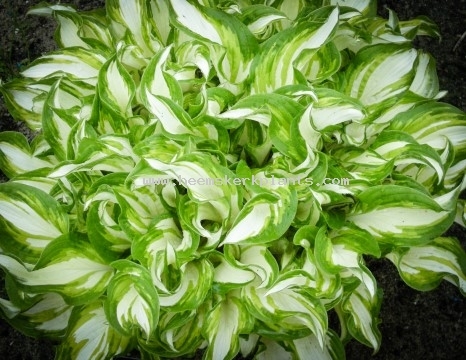 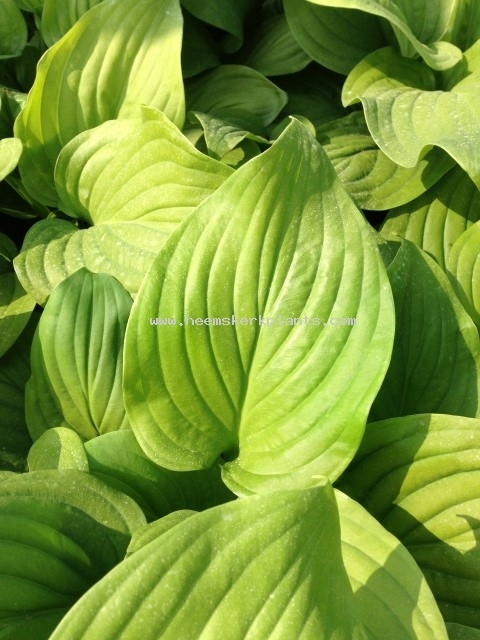 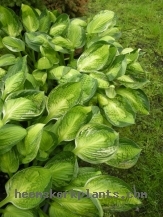 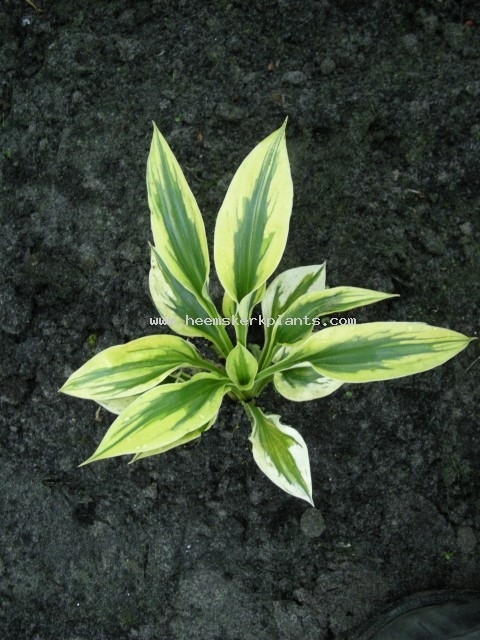 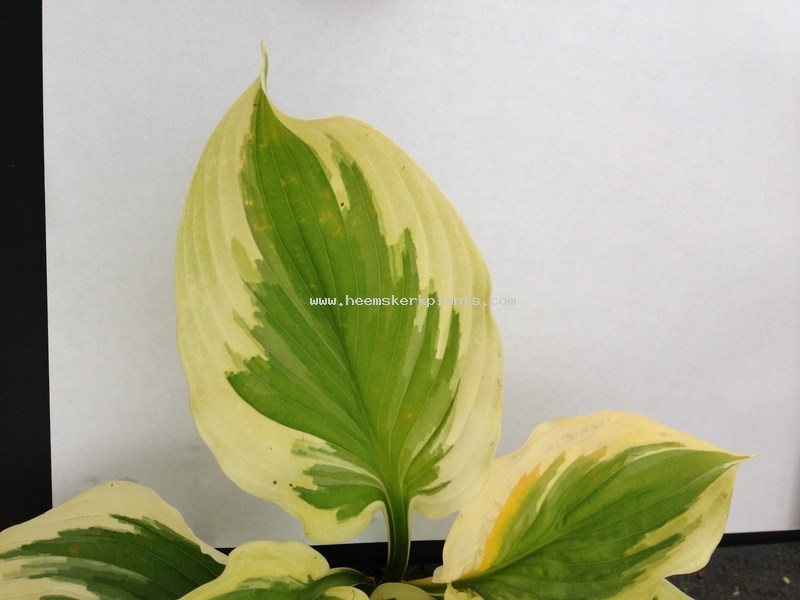 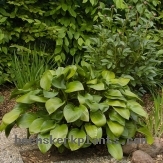 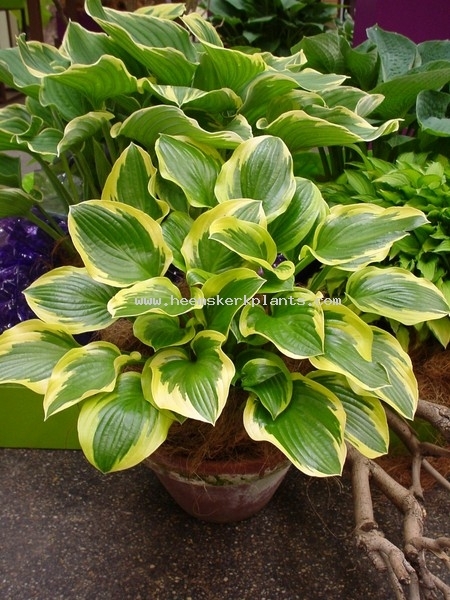 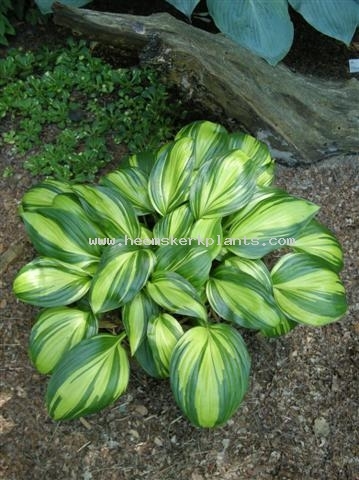 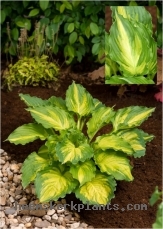 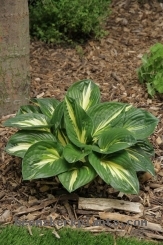 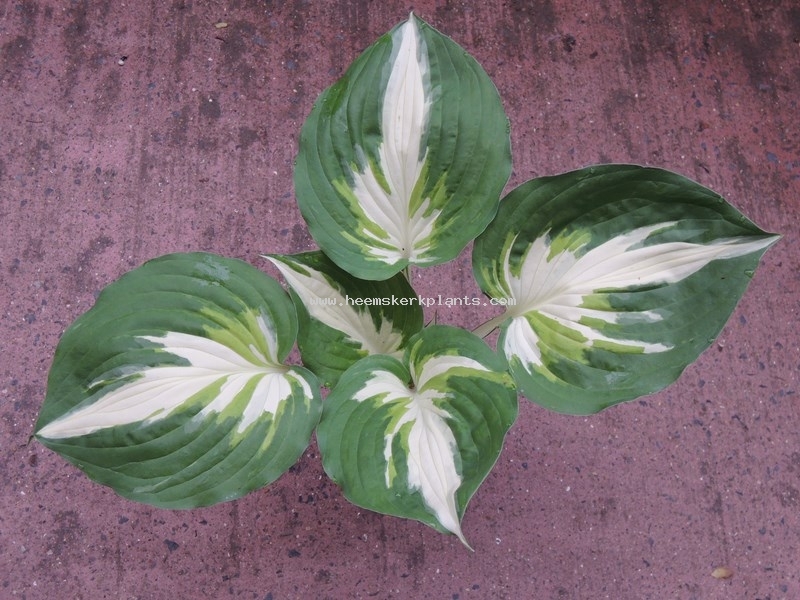 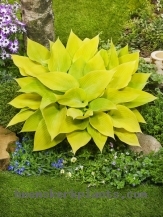 Leaf:	Hosta Empress Wu Sport with shiny green leaf. 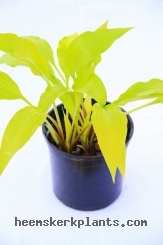 Leaf: Yellow center with green margin. 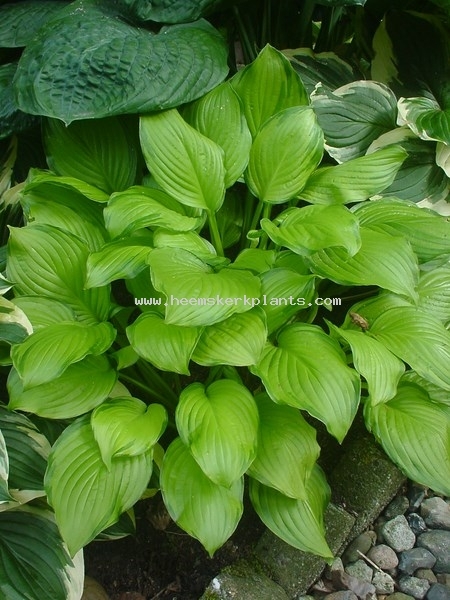 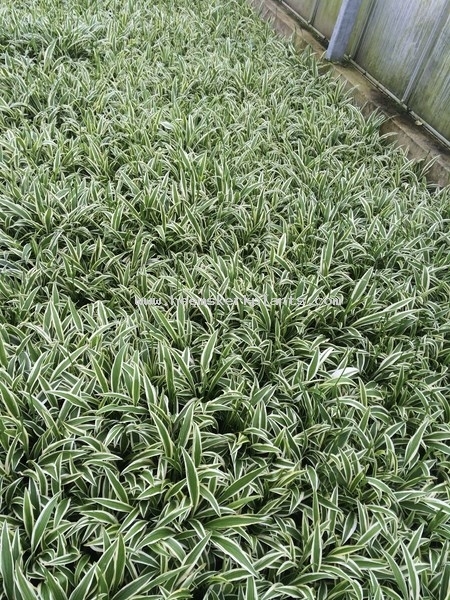 Leaf:	Rounded dark green, very heavily substanced leaves that are frosted with white wax in spring and shiny in summer. 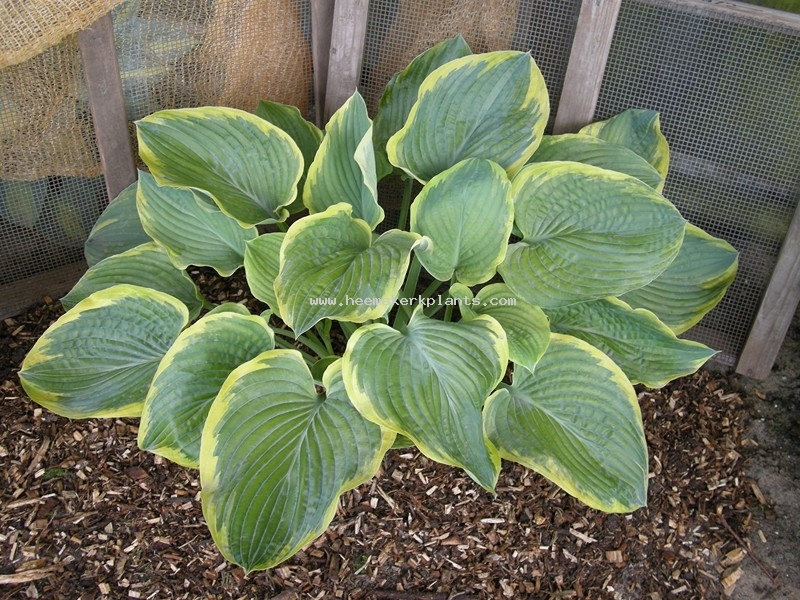 Leaf:	An irregular shaped yellow leaf. 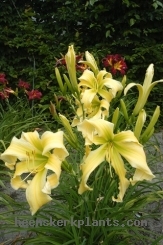 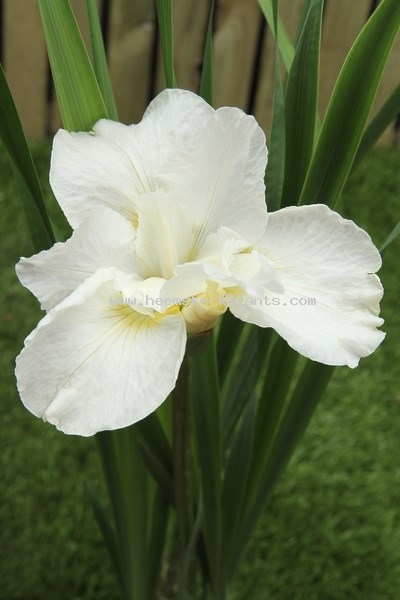 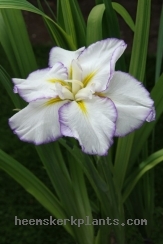 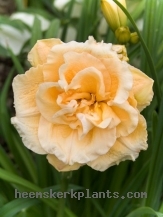 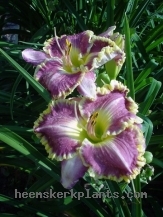 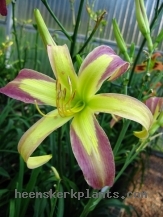 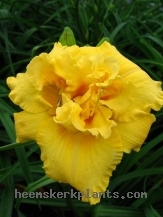 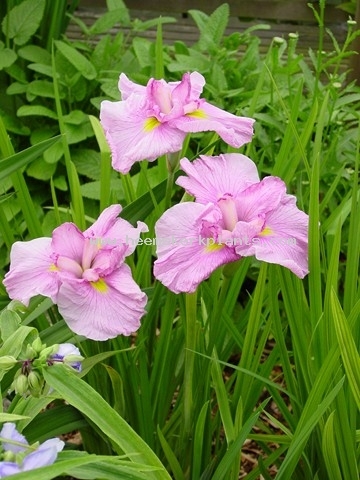 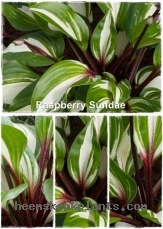 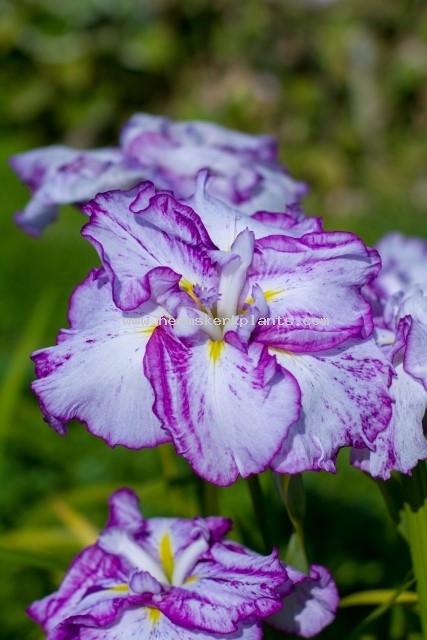 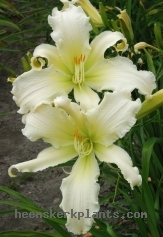 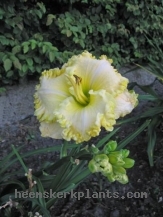 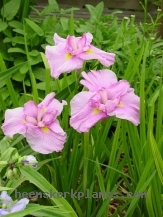 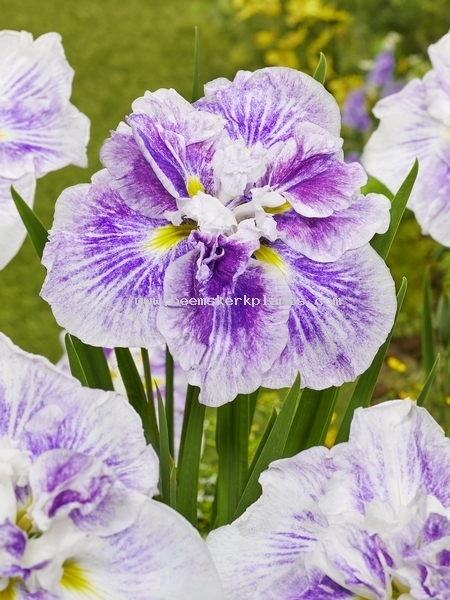 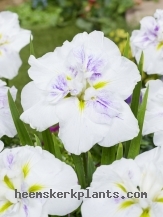 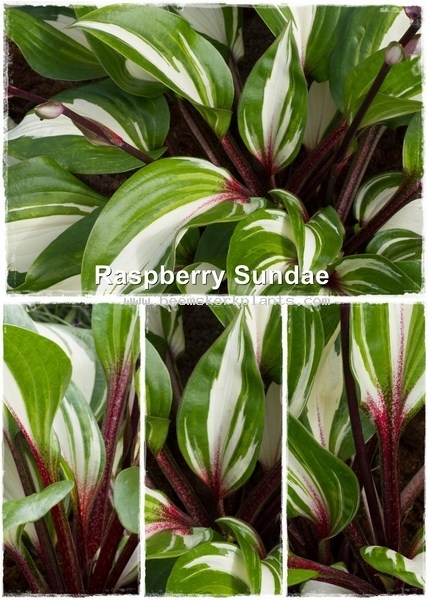 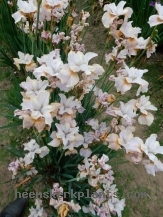 Definition: Clean white, yellow signal with basal greenish cast, rose violet veins radiating from deeper rose area surrounding signal; style arms rose violet, tipped white. 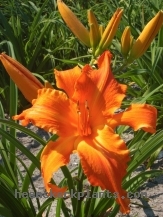 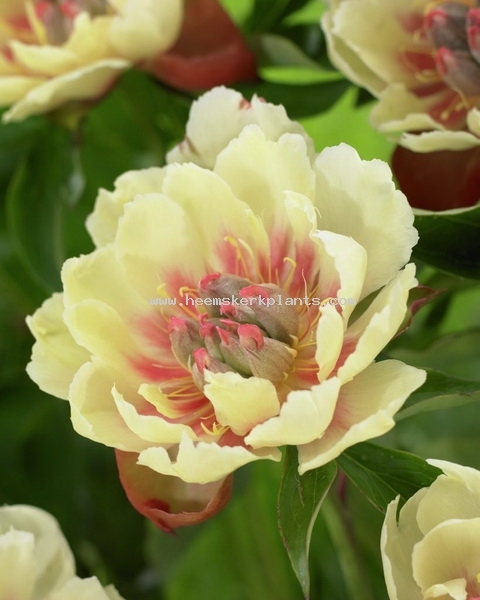 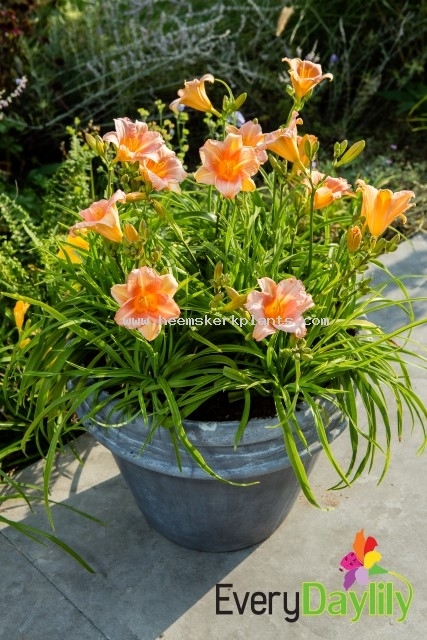 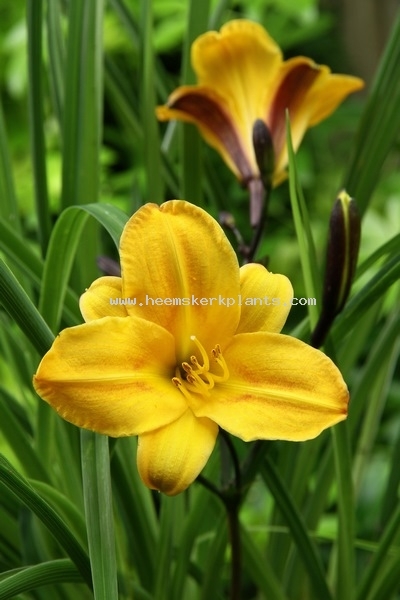 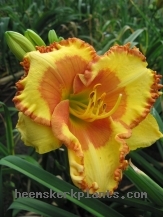 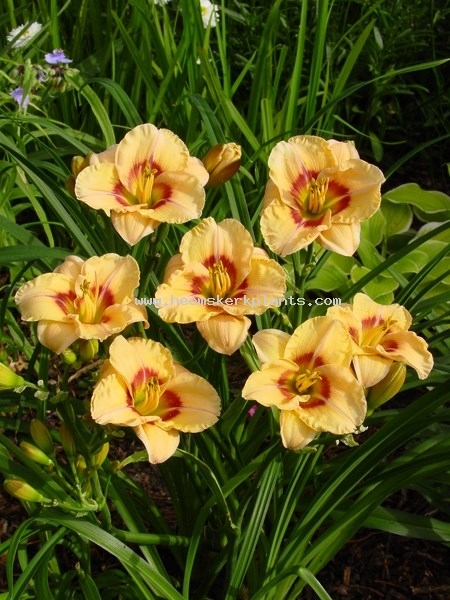 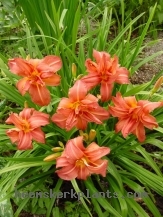 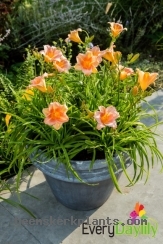 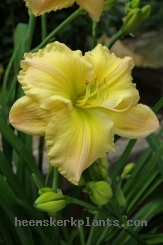 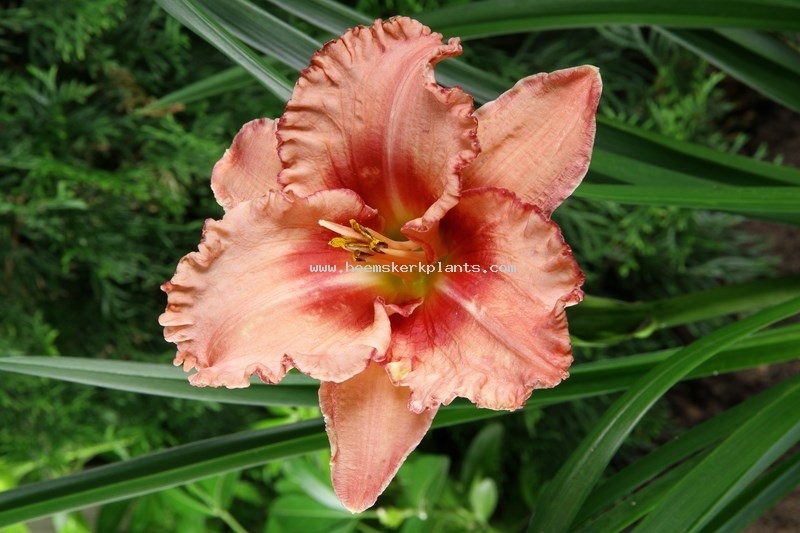 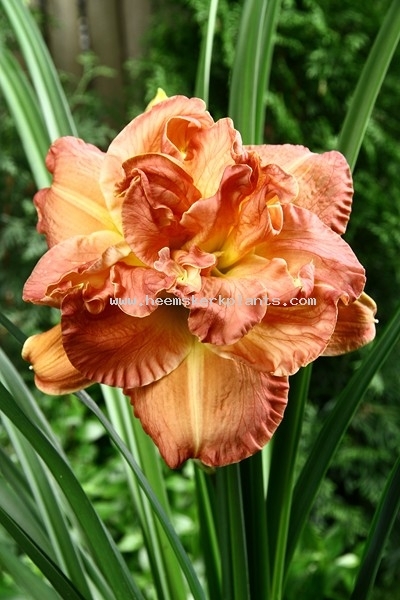 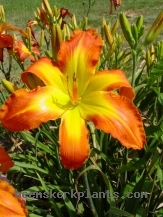 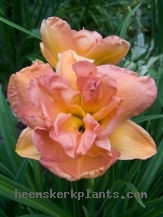 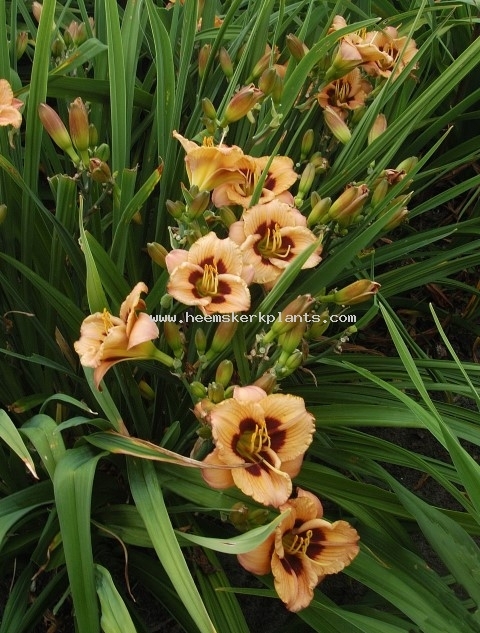 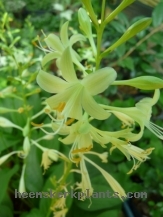 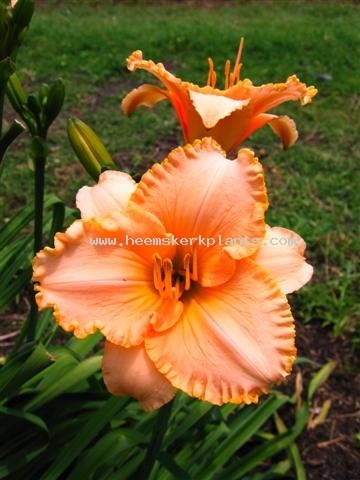 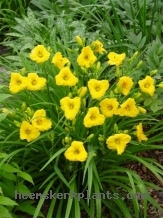 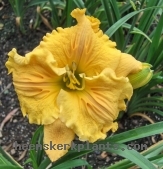 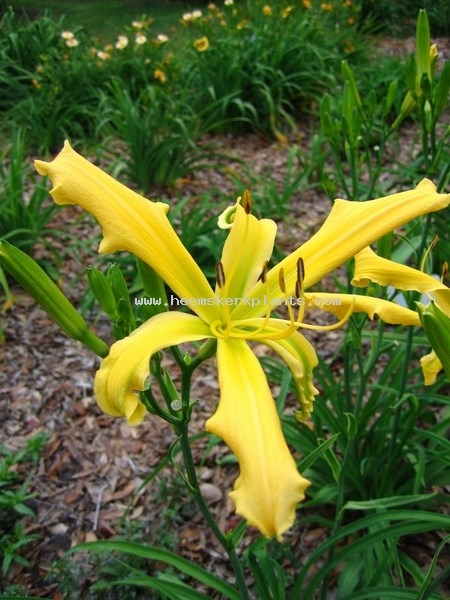 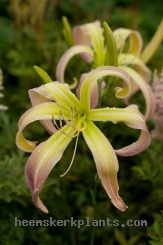 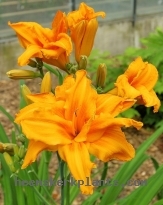 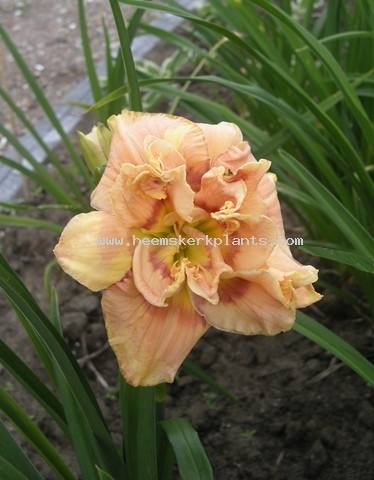 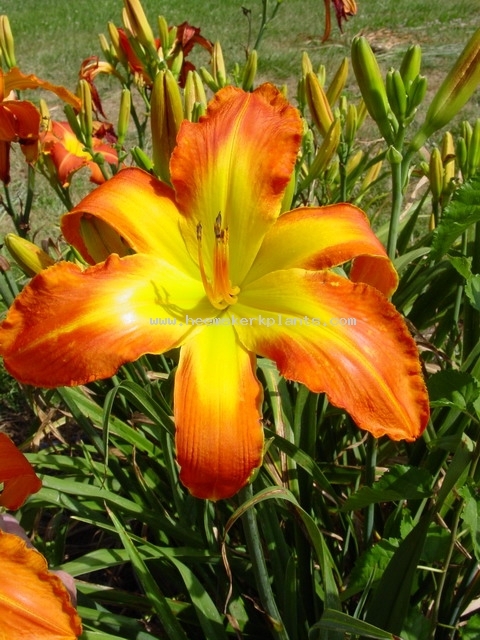 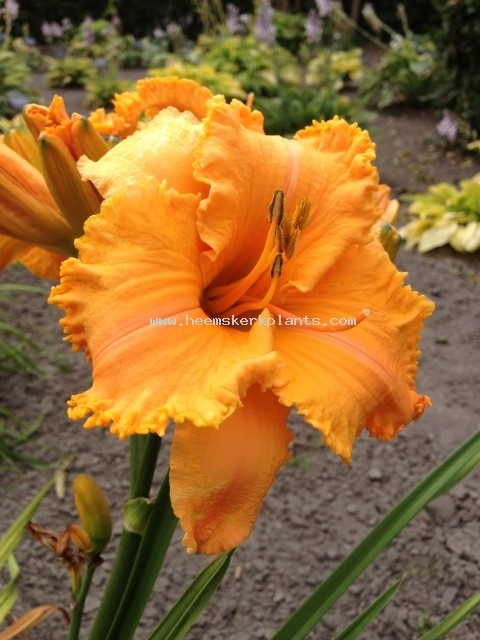 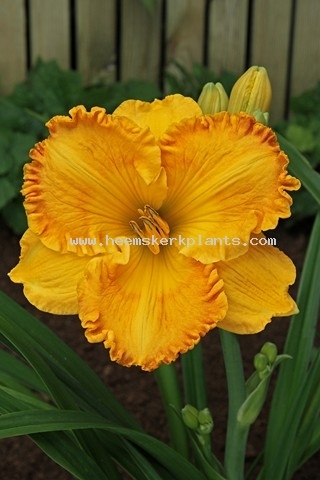 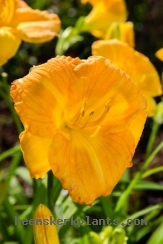 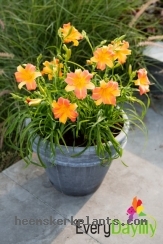 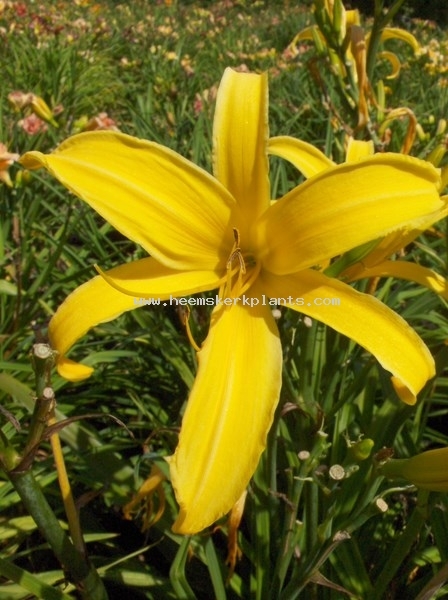 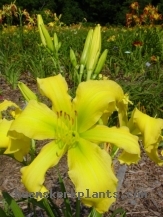 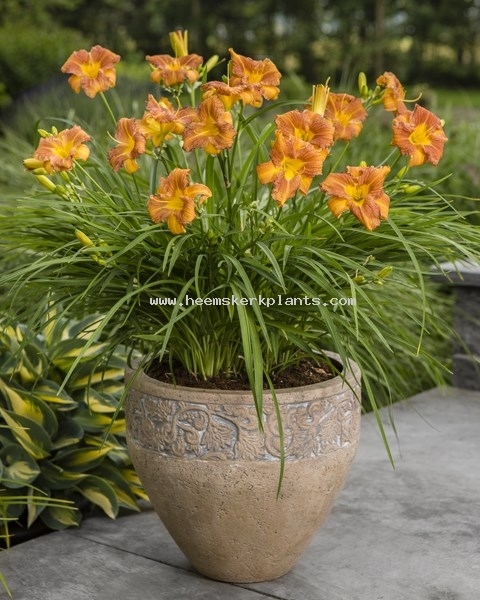 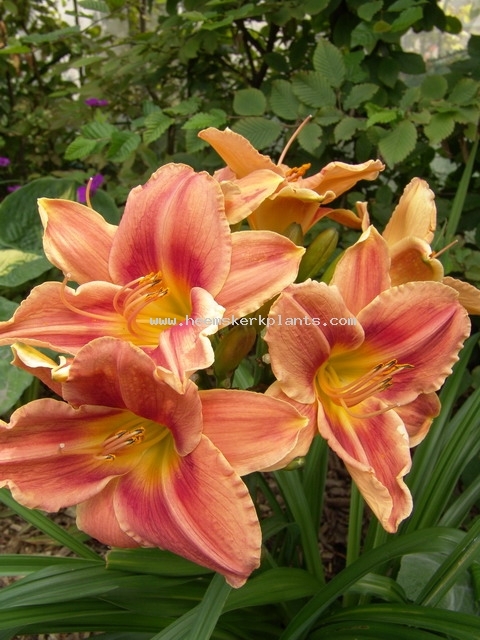 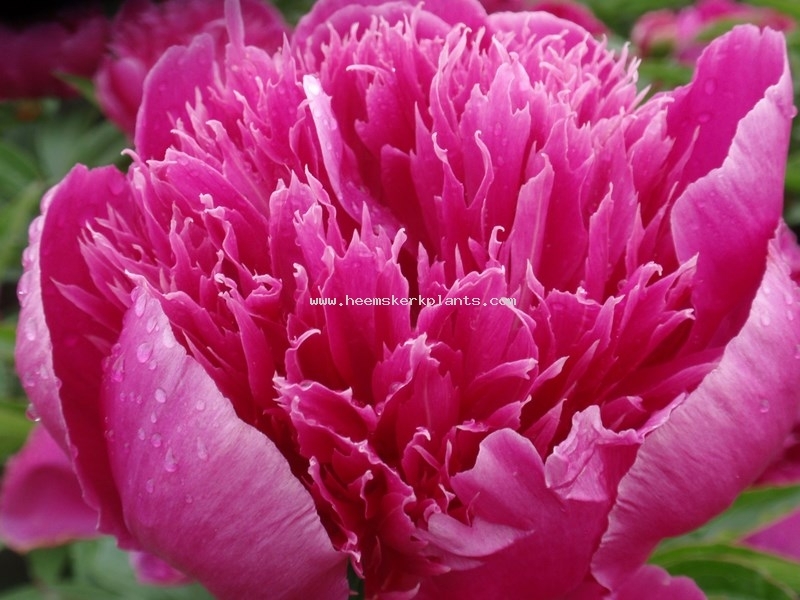 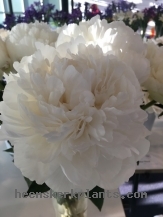 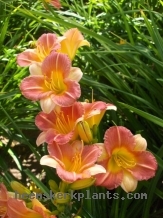 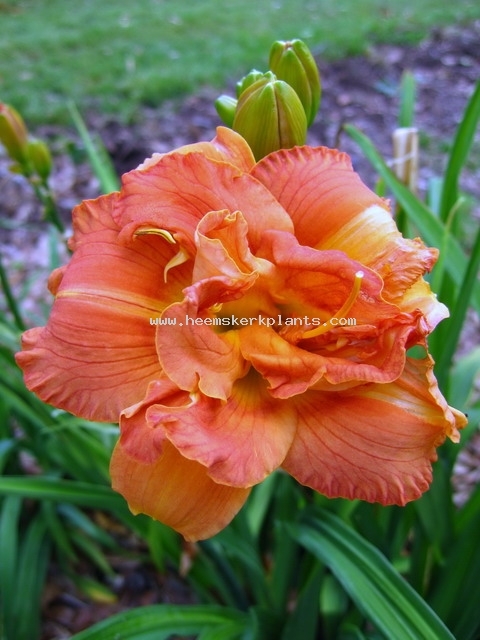 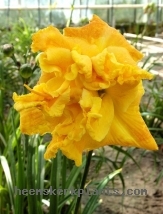 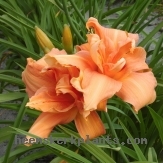 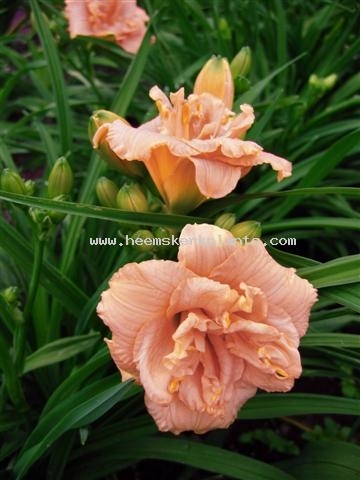 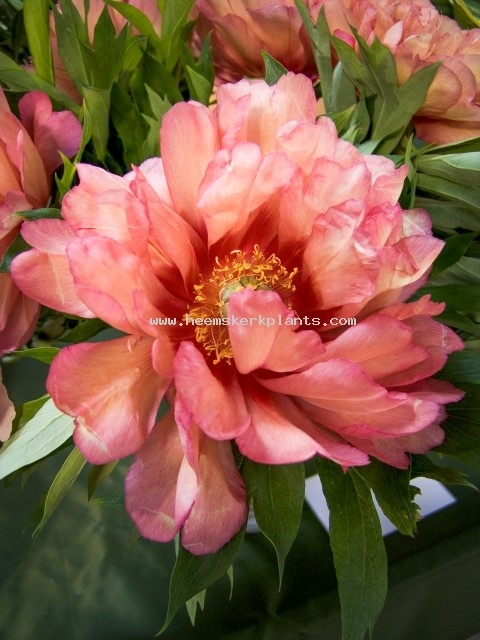 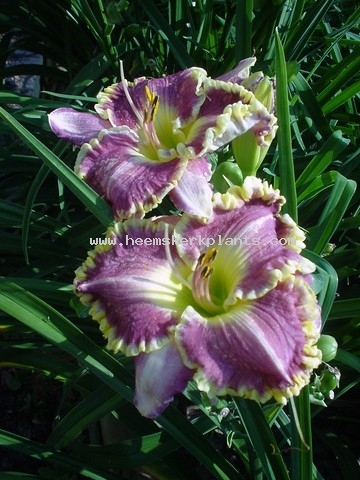 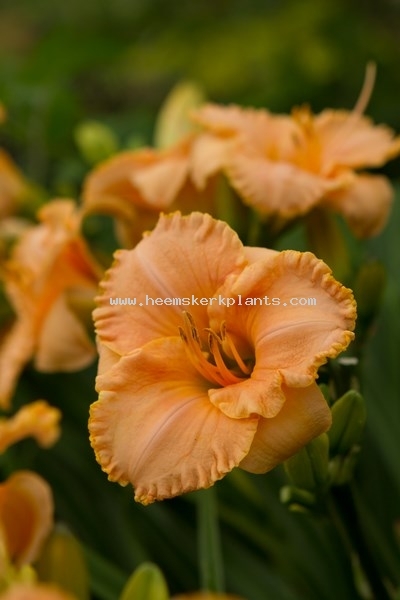 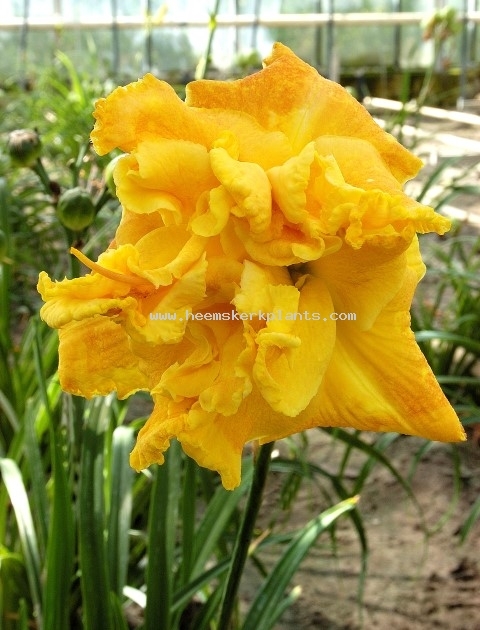 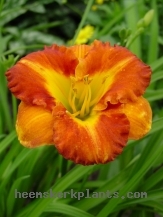 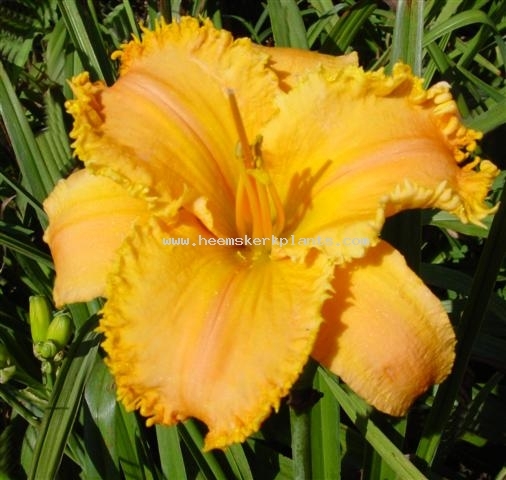 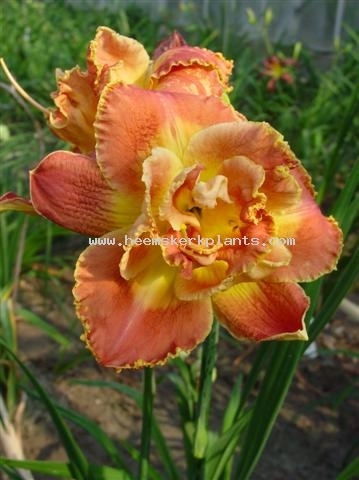 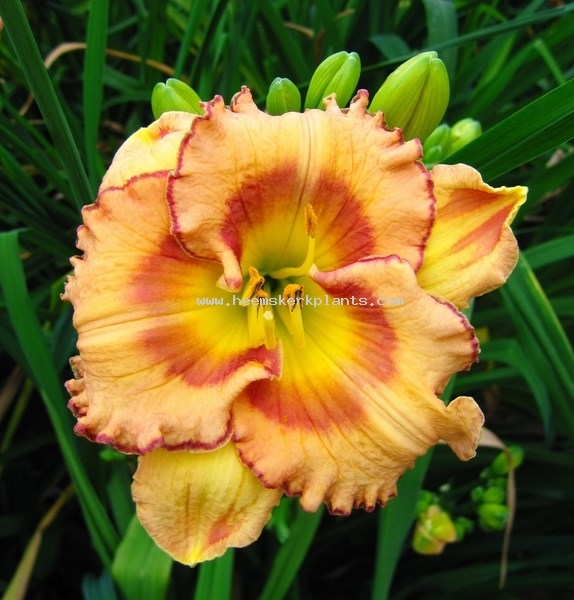 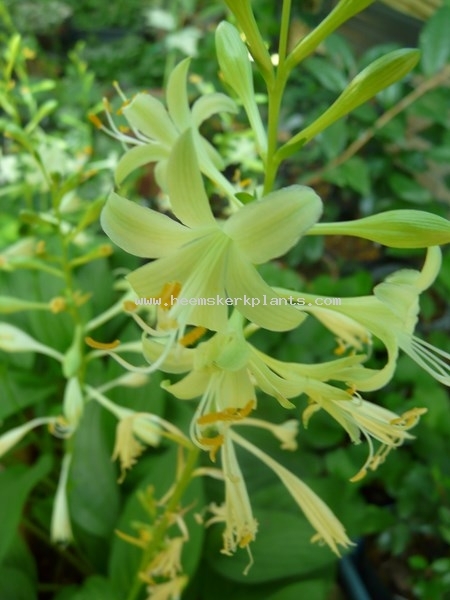 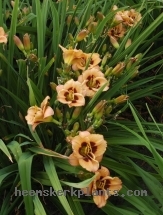 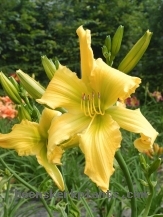 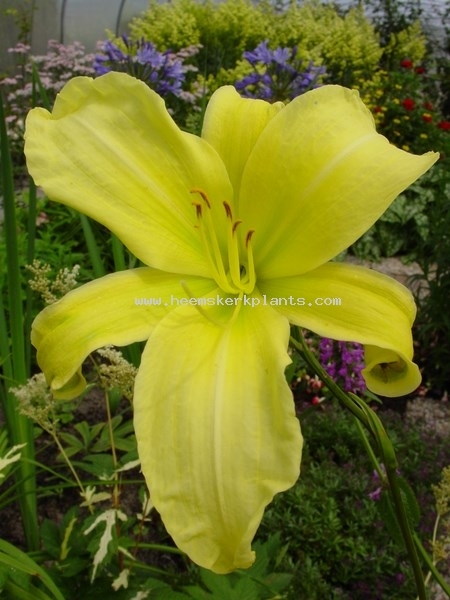 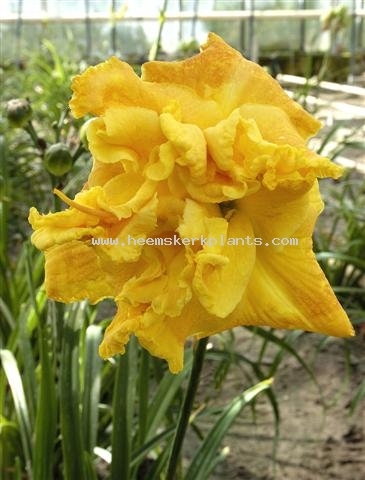 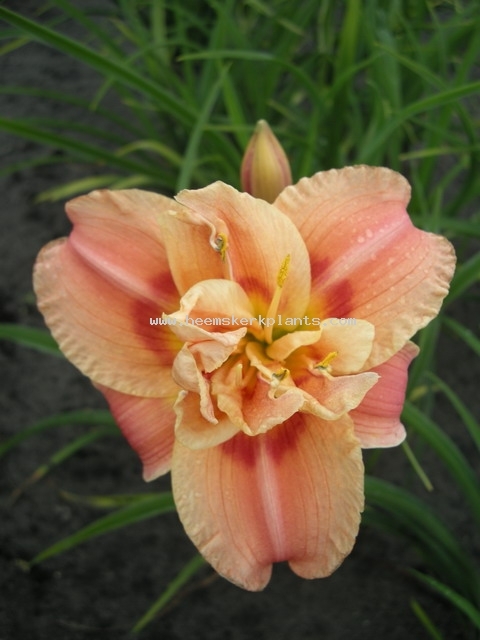 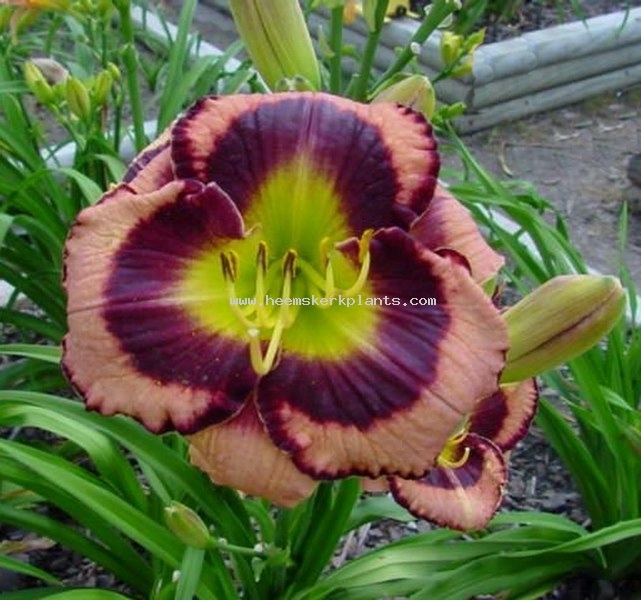 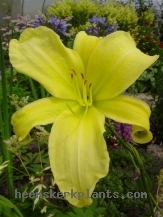 Definition: The flower dominates; buds are massive, flowers may grow to nine inches diameter, good for cut flower. Definition: Pink and Yellow and medium sized flower. 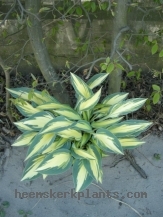 Carried on strong stems above the foliage. 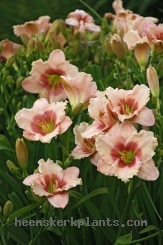 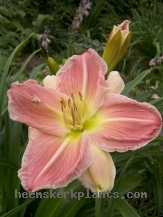 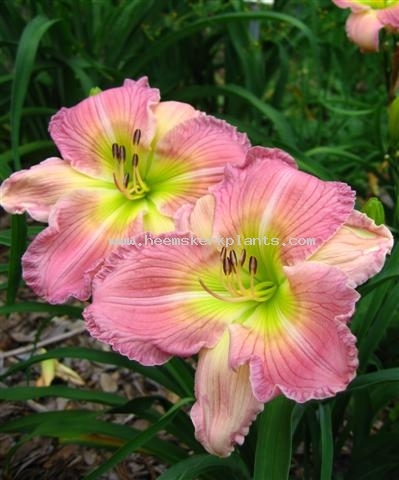 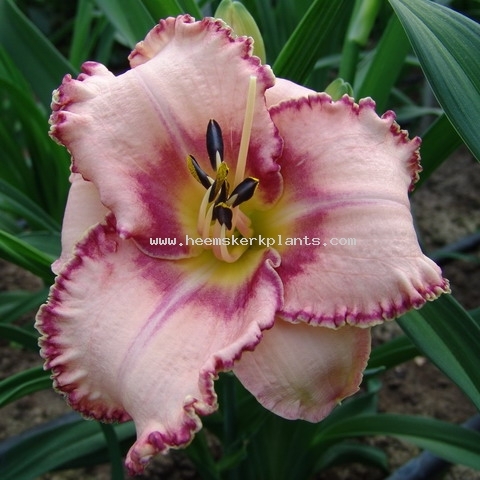 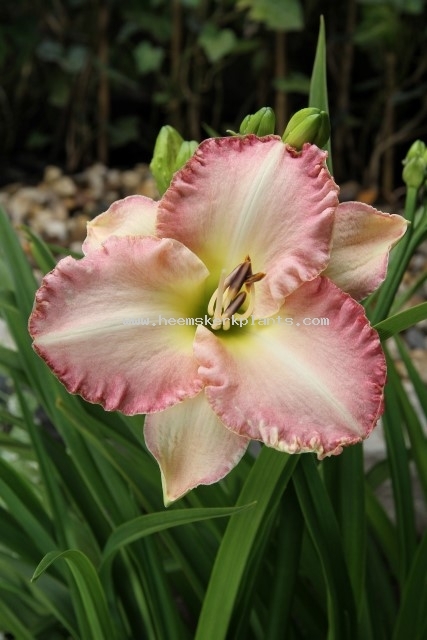 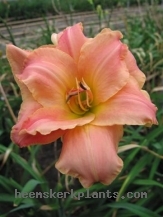 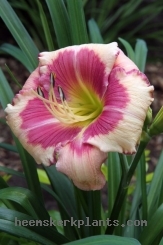 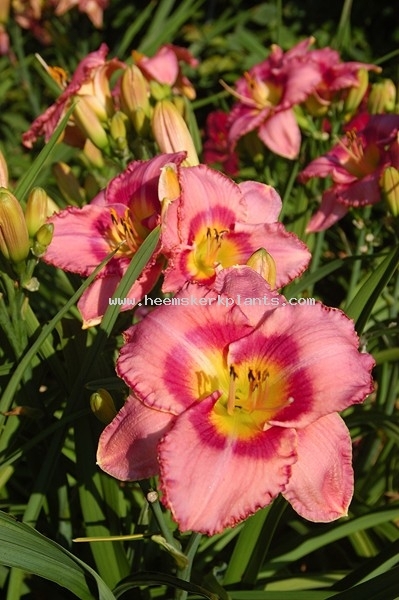 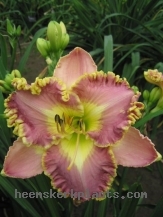 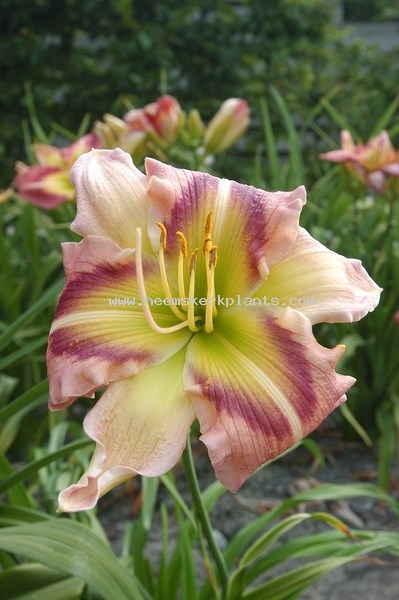 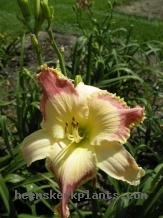 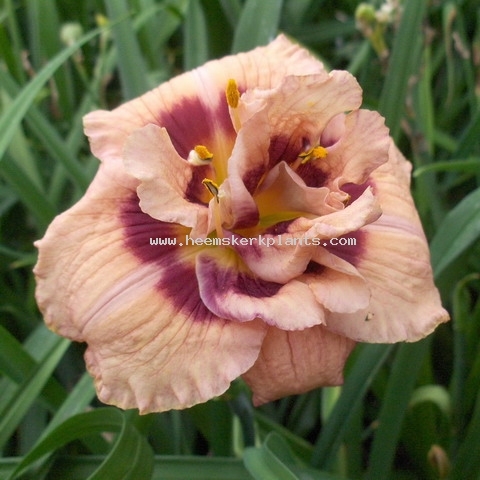 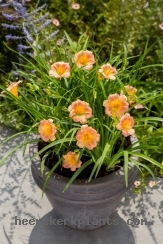 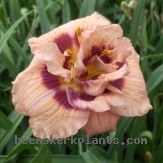 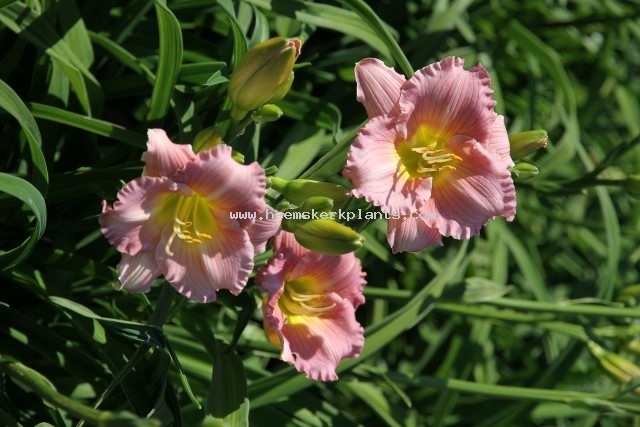 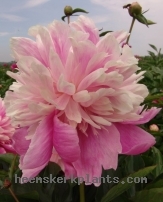 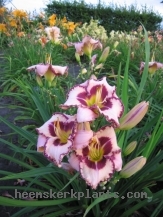 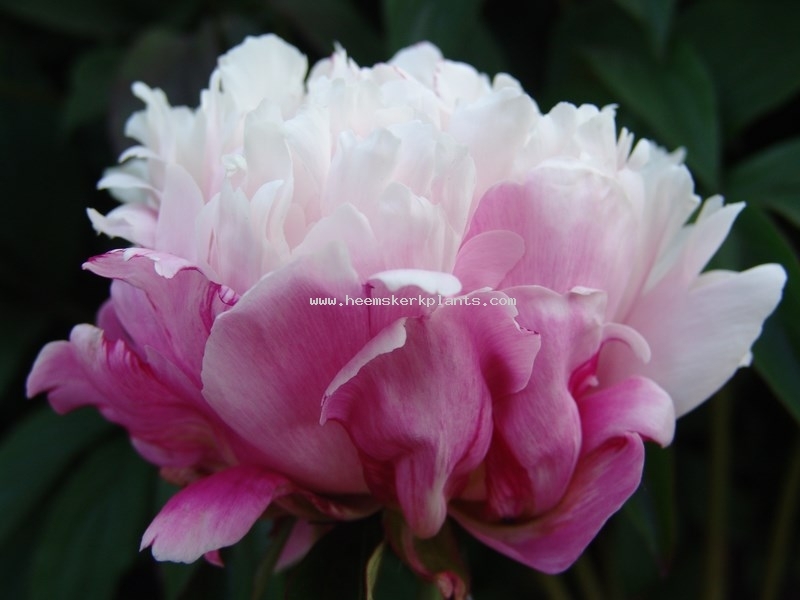 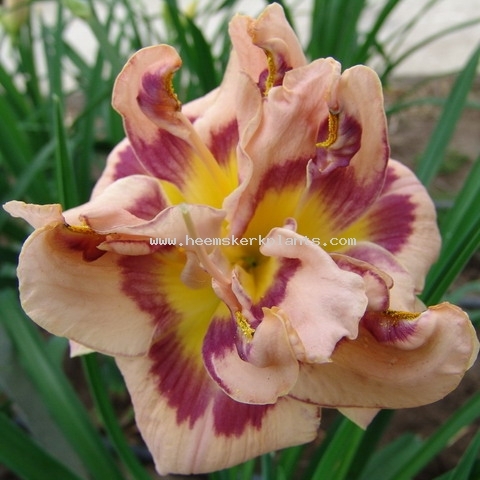 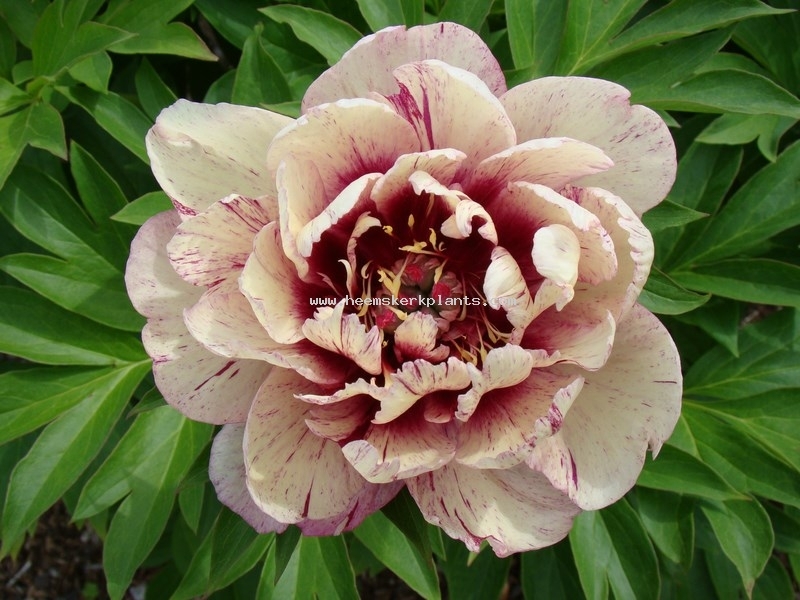 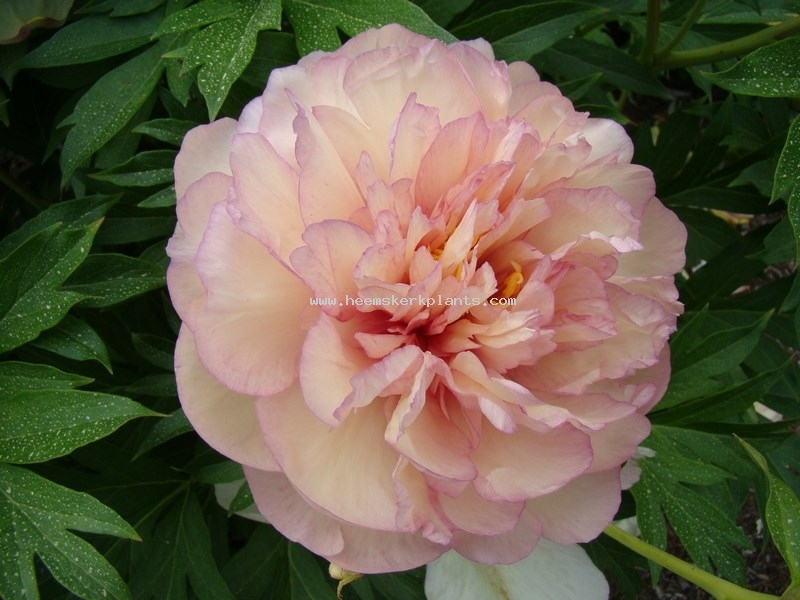 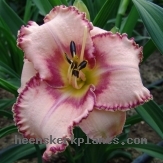 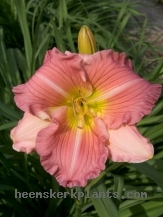 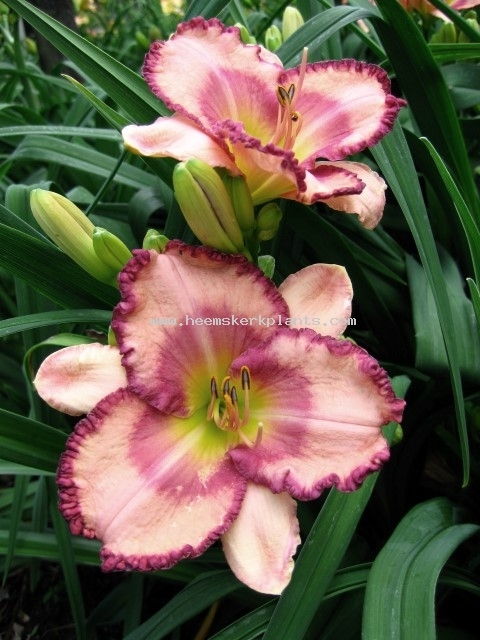 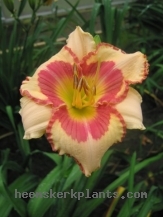 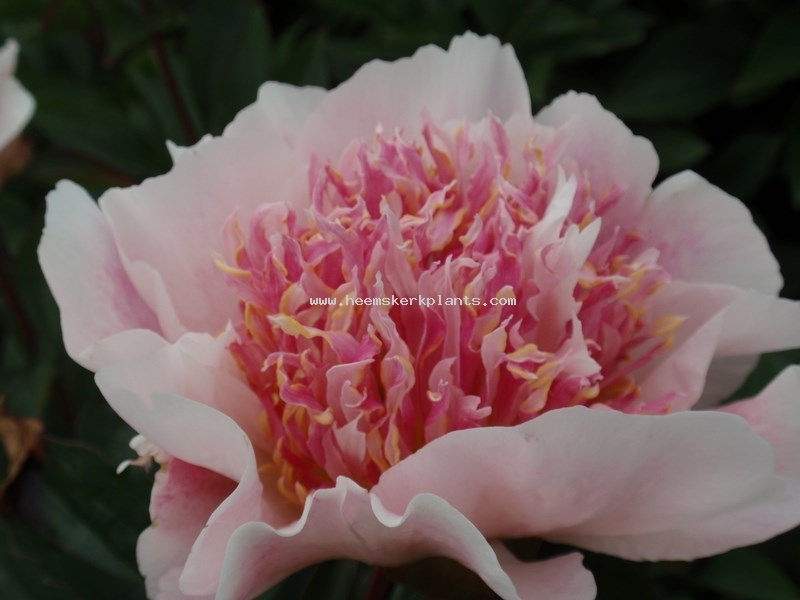 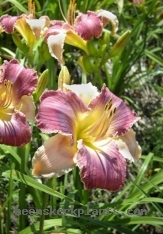 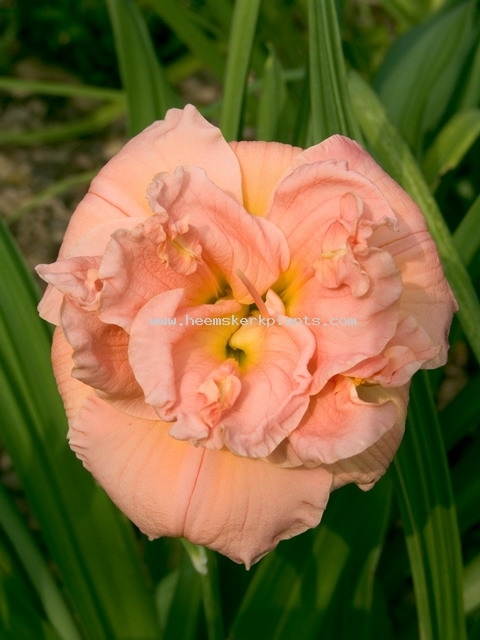 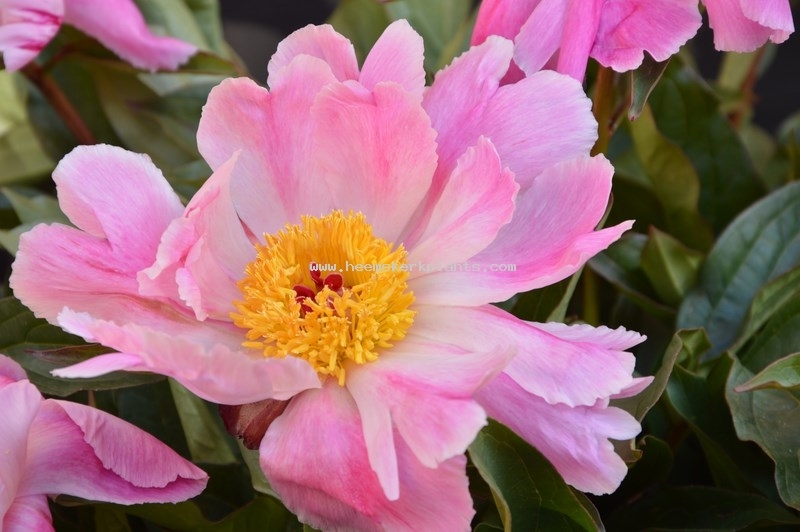 Definition: Unusual pink coloration with the white center sandwiched with soft pink shades. Definition: Huge double flowers. 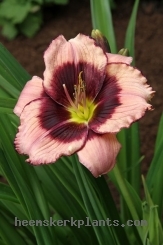 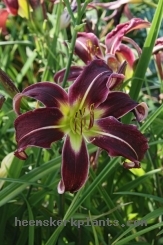 Very dark pink at opening that fades gradually to a cream on the upper part of the petals whereas the lower part keeps its red-rose.